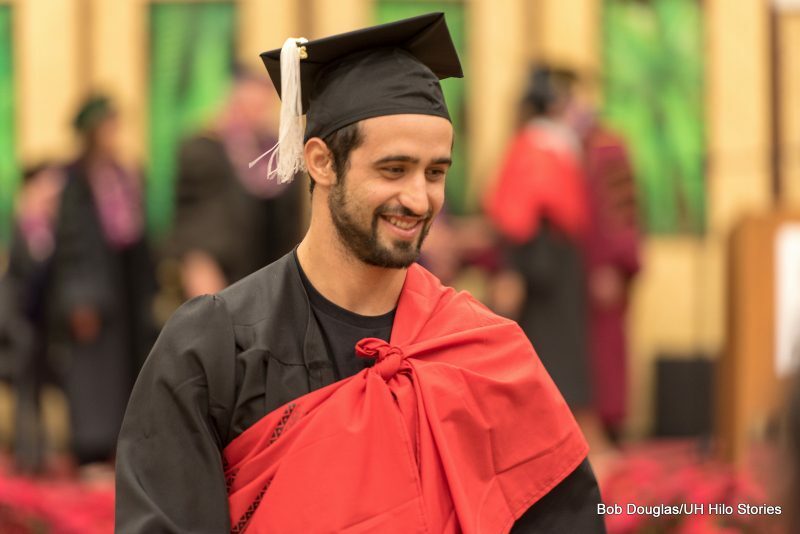 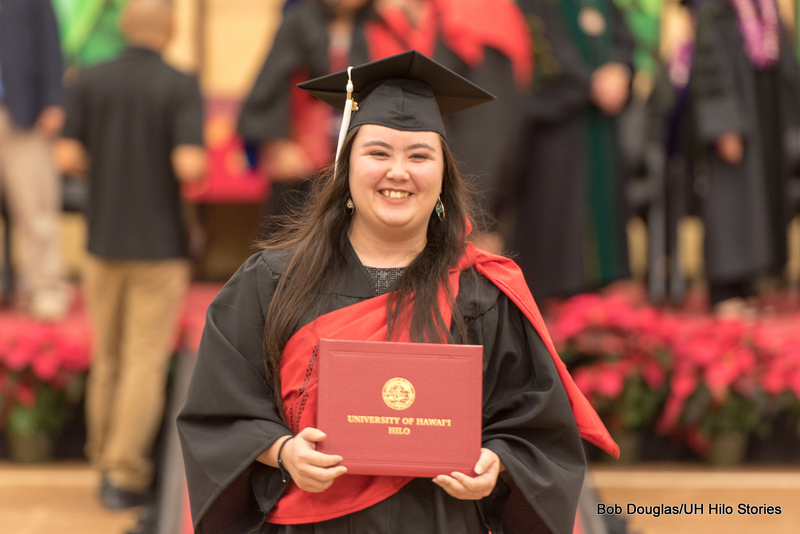 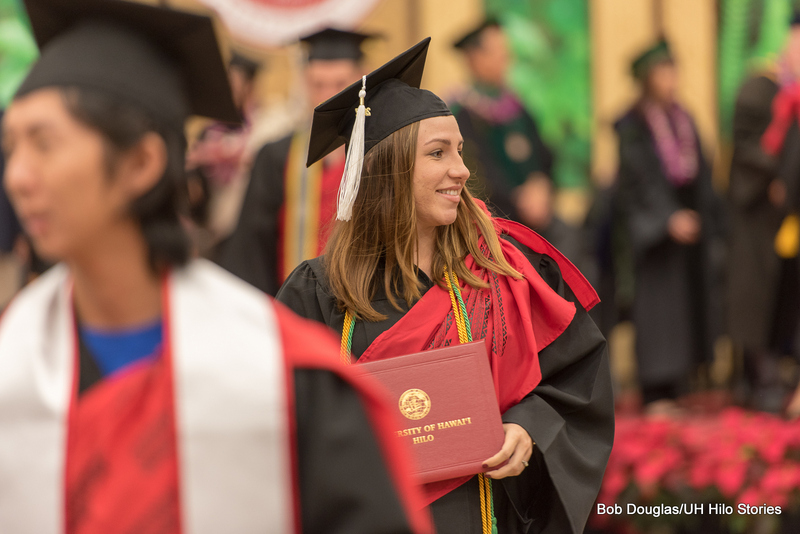 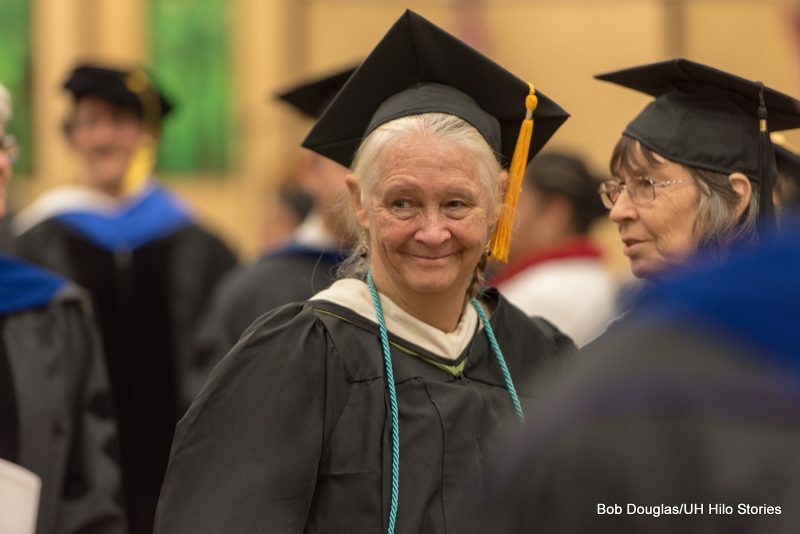 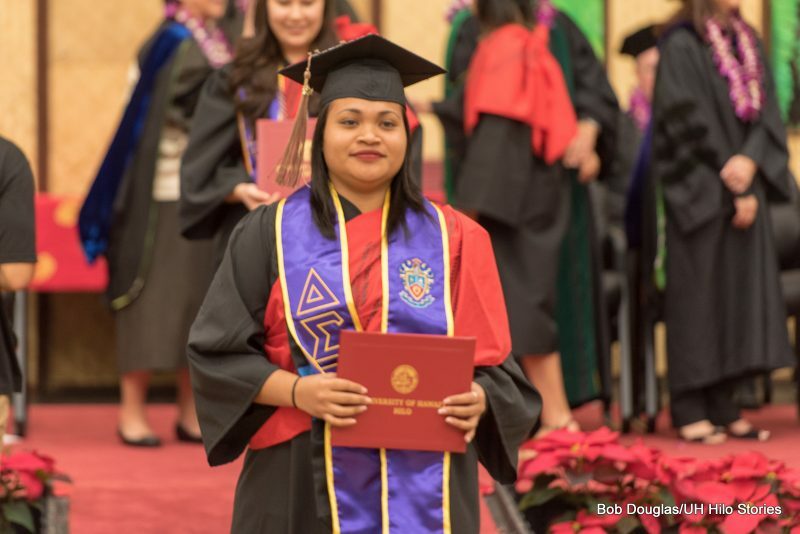 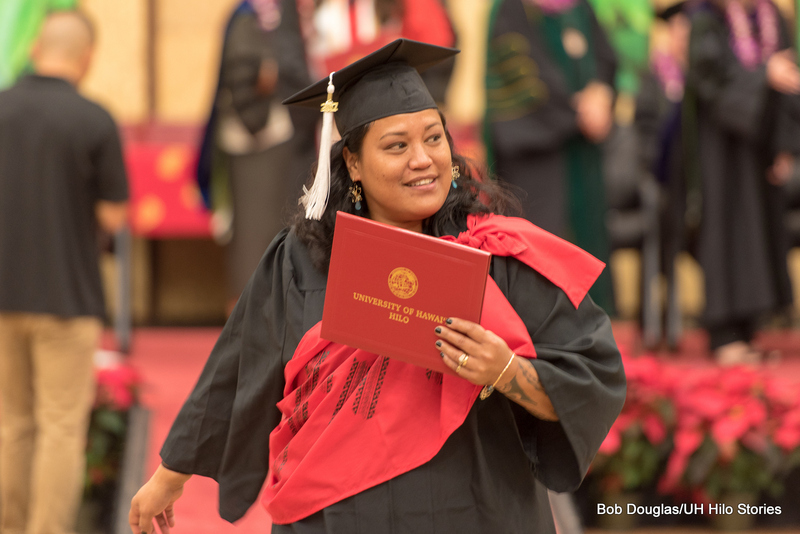 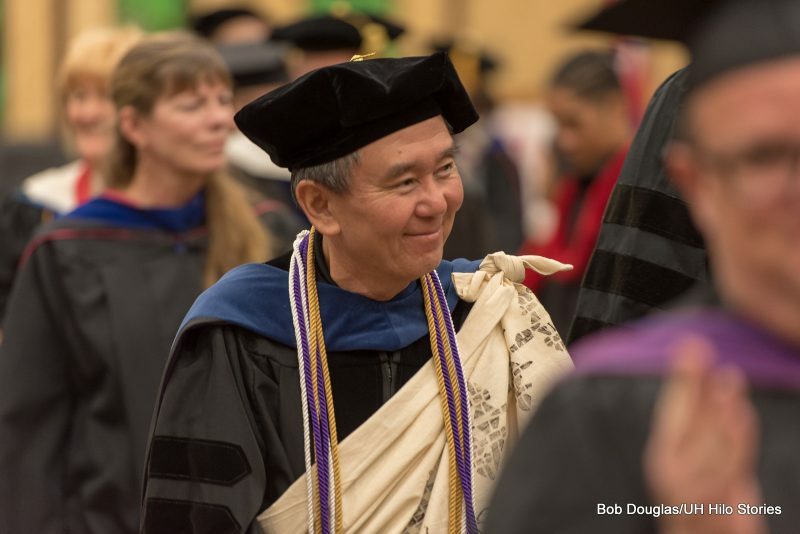 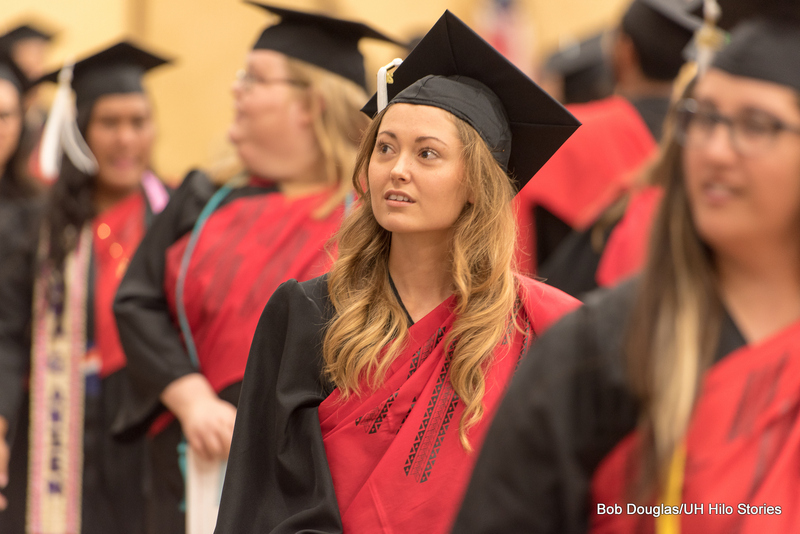 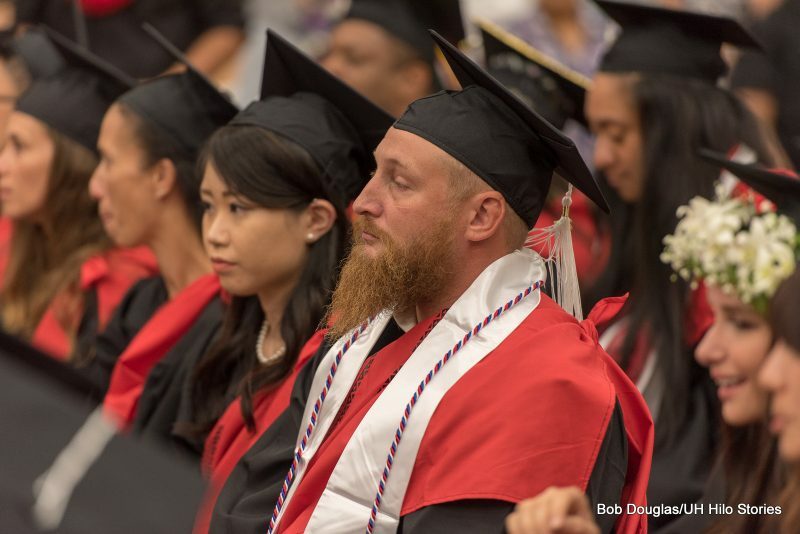 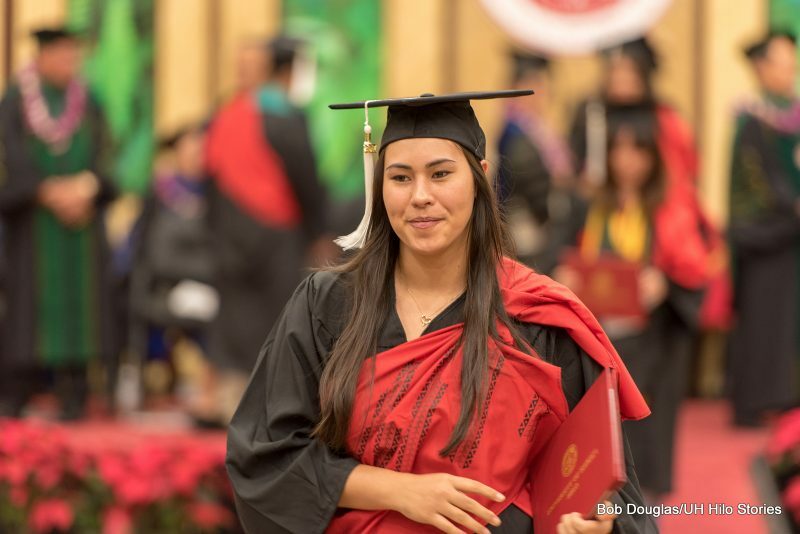 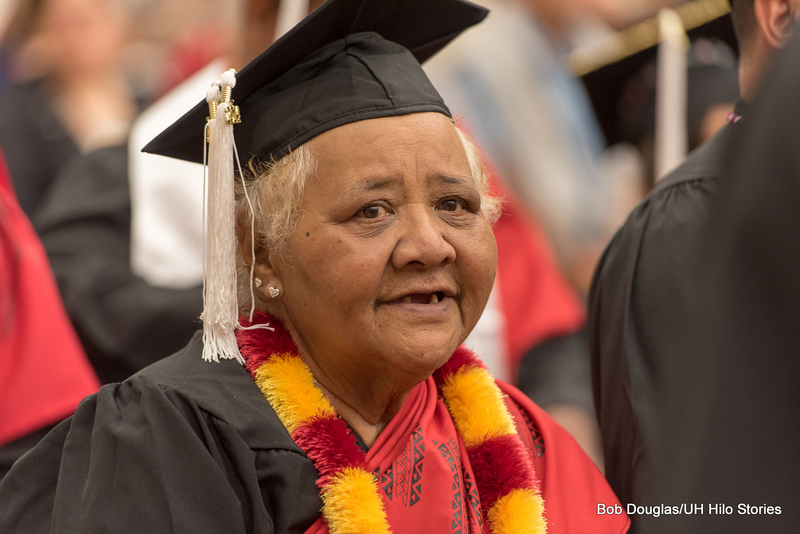 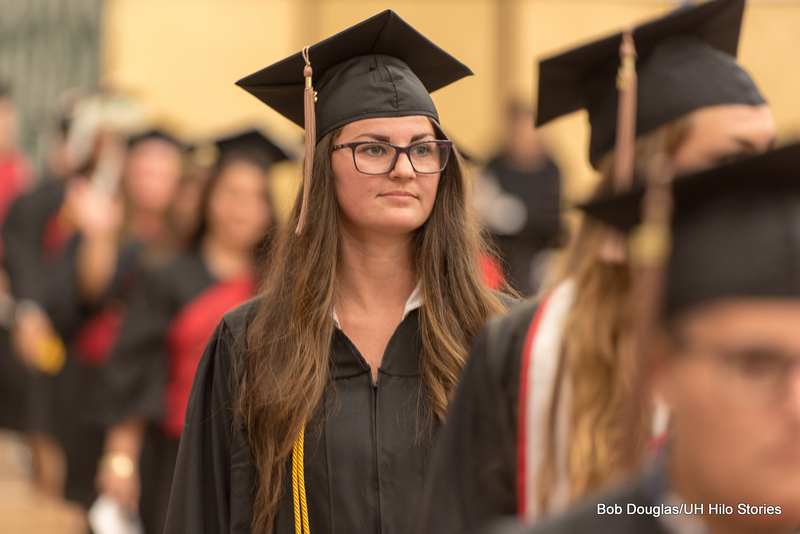 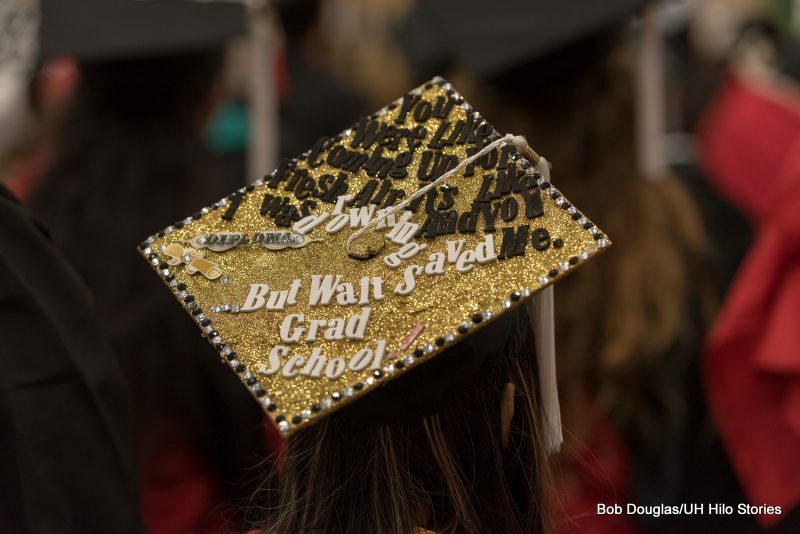 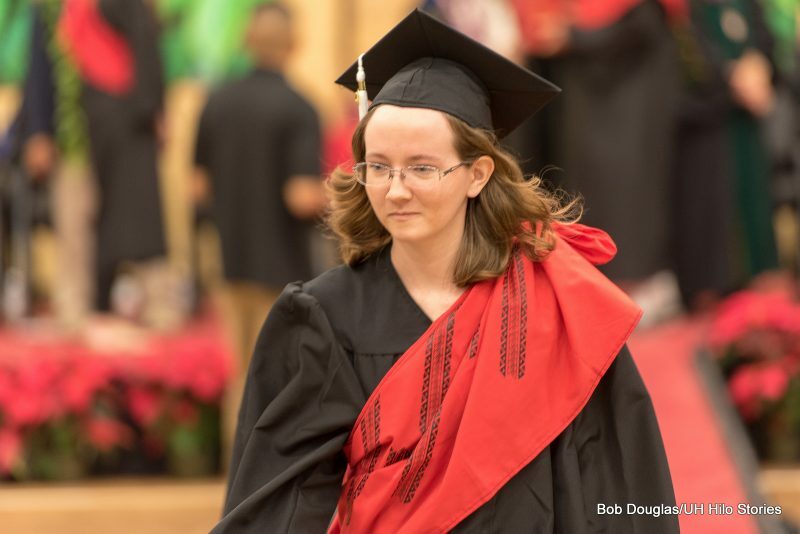 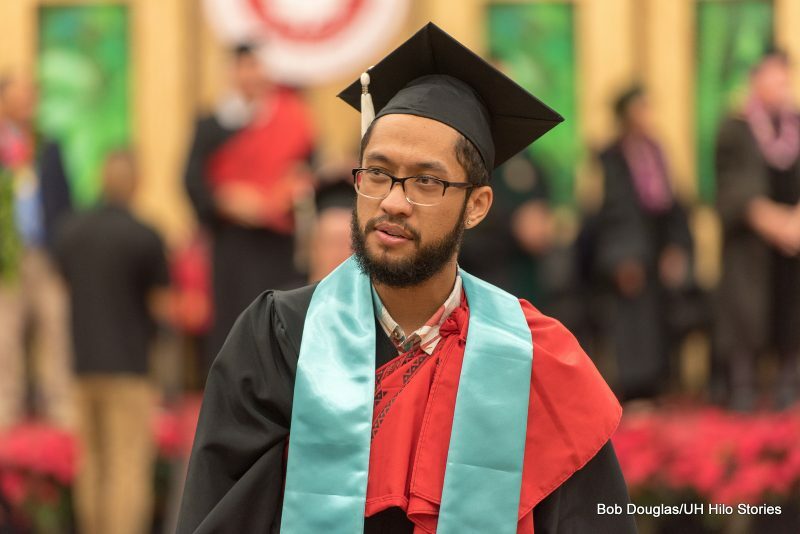 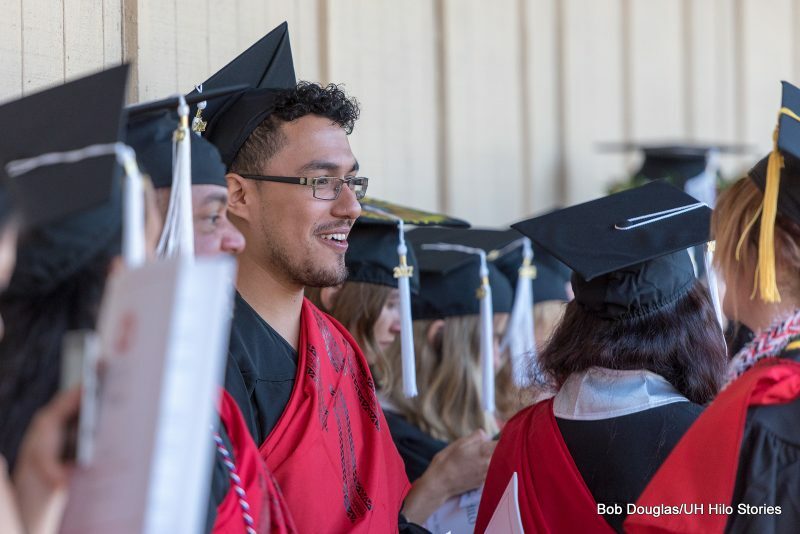 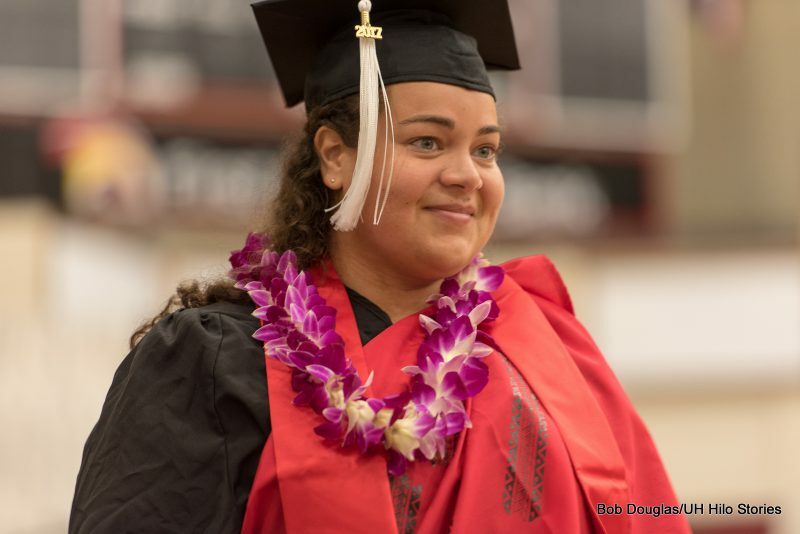 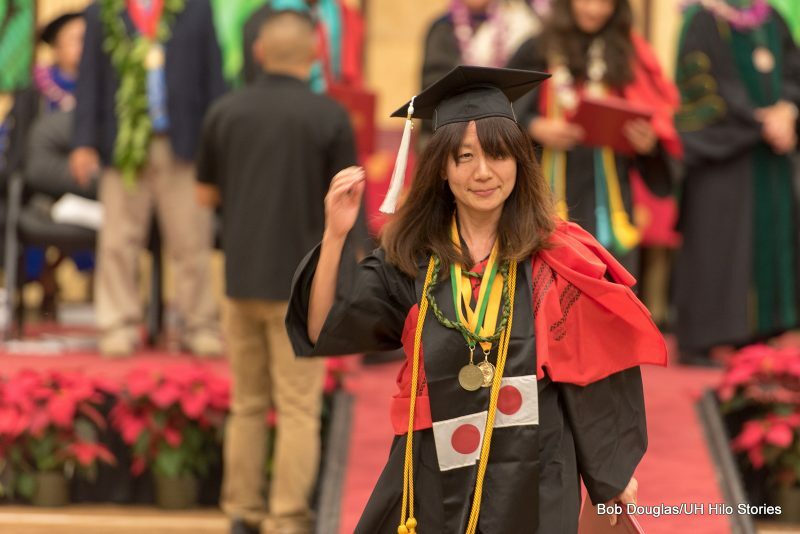 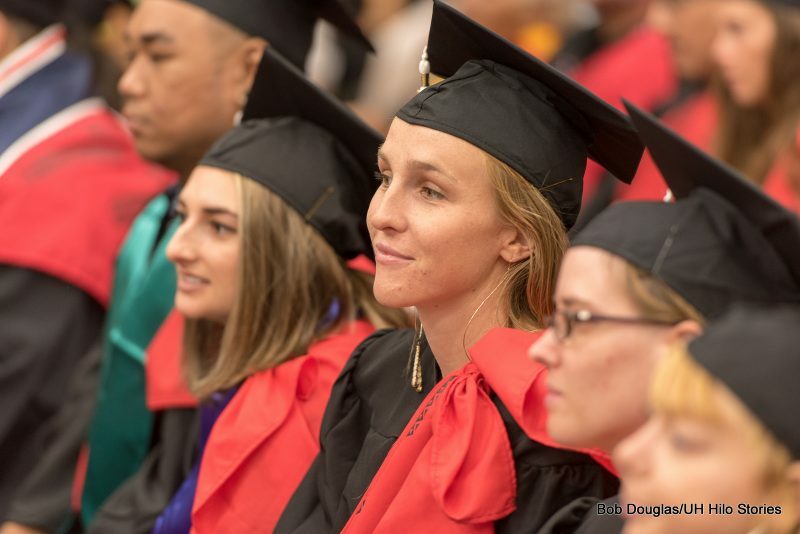 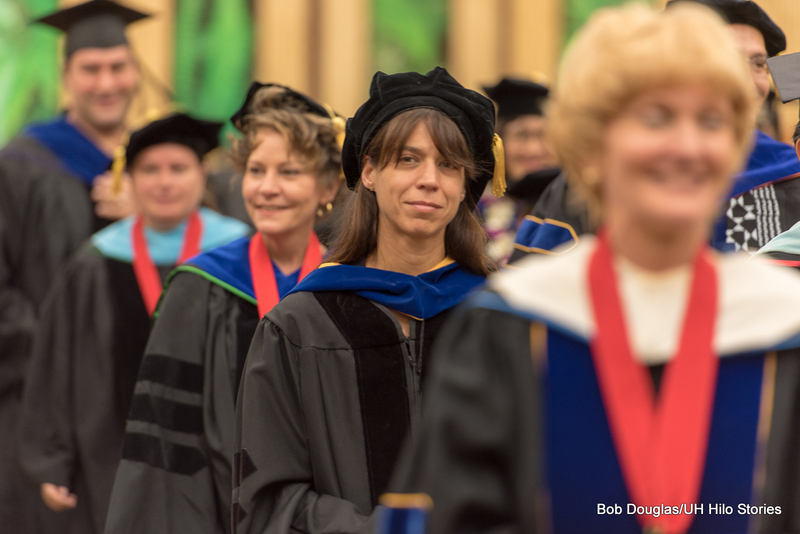 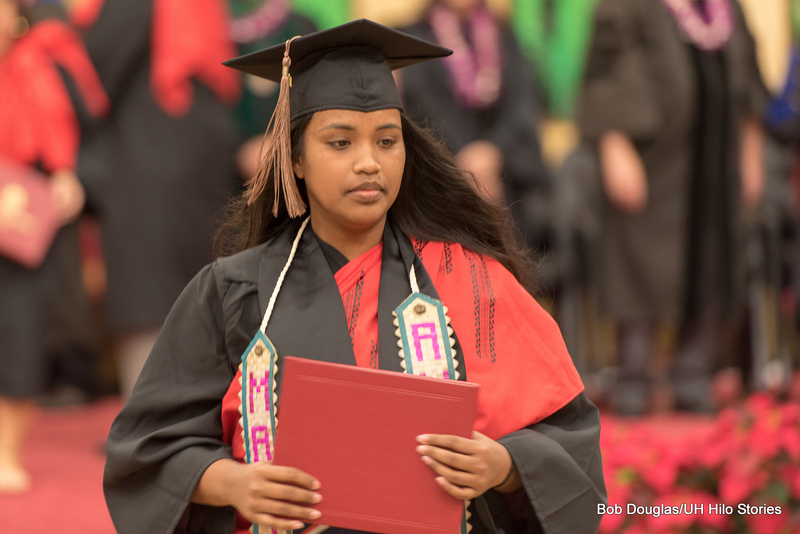 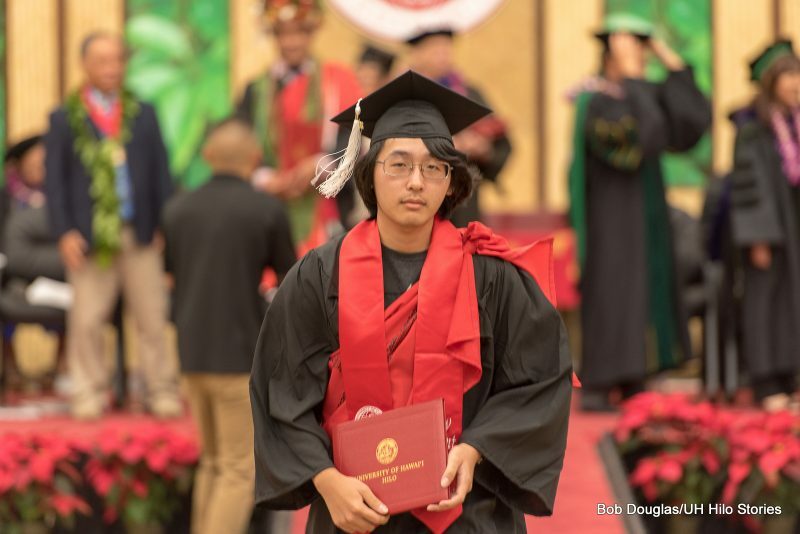 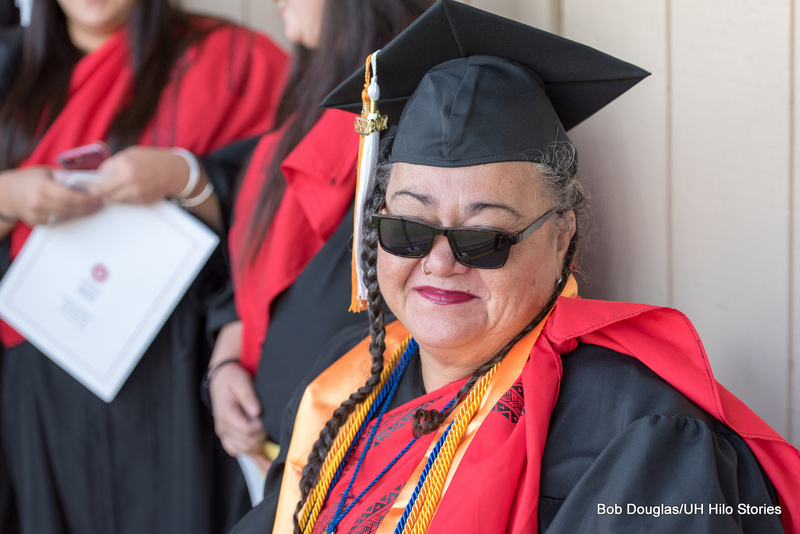 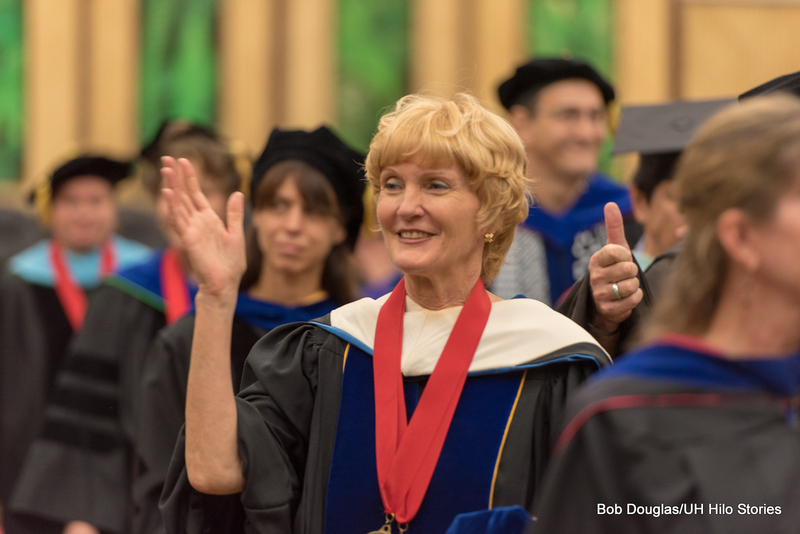 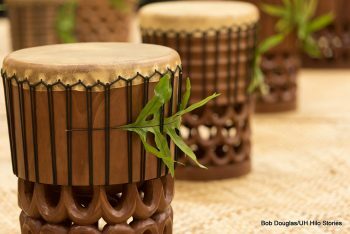 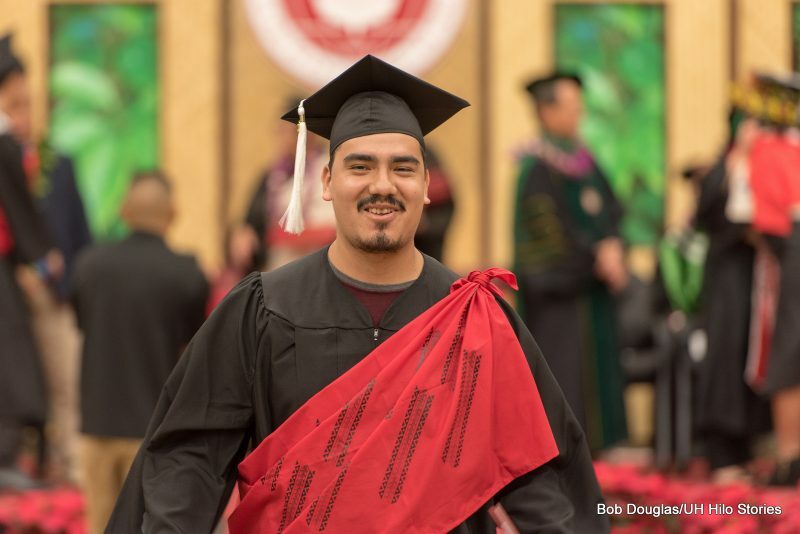 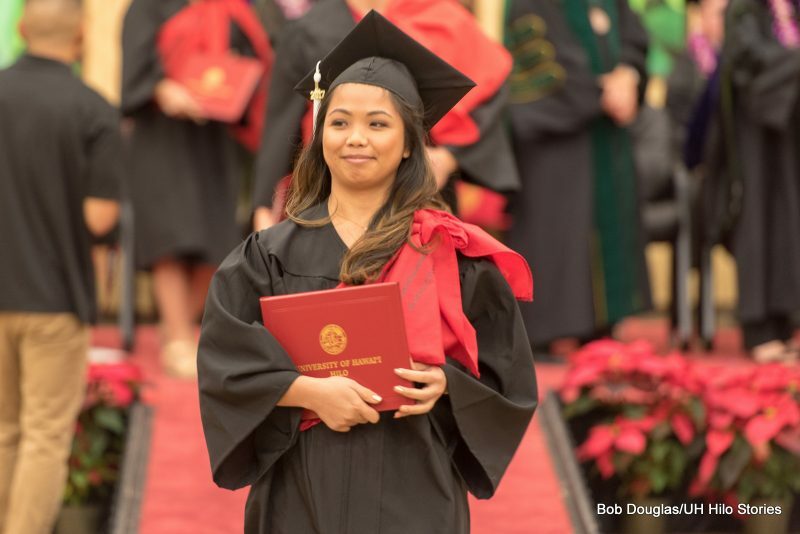 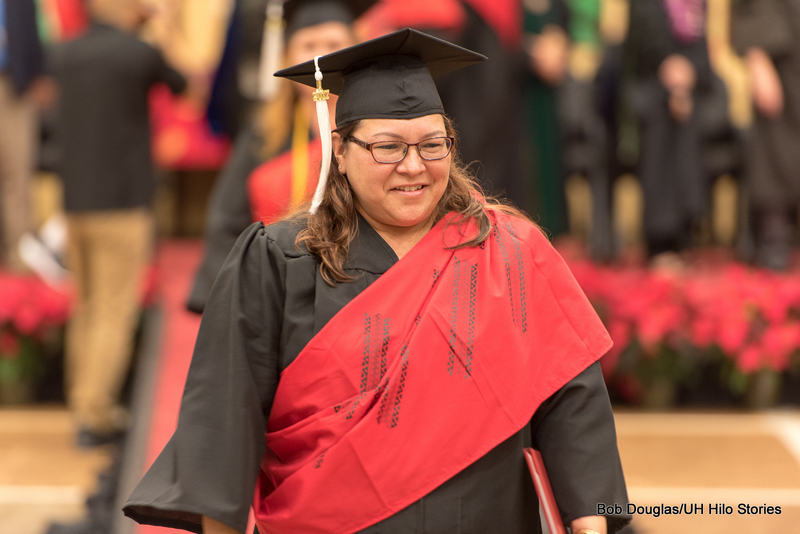 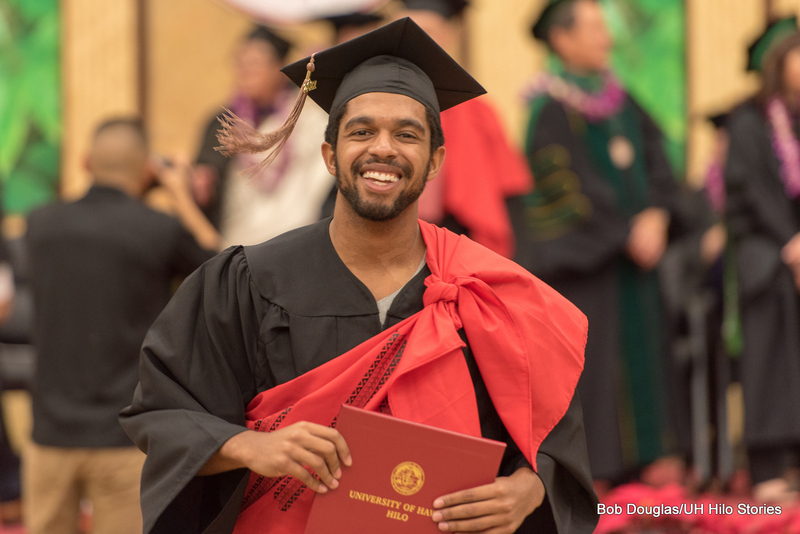 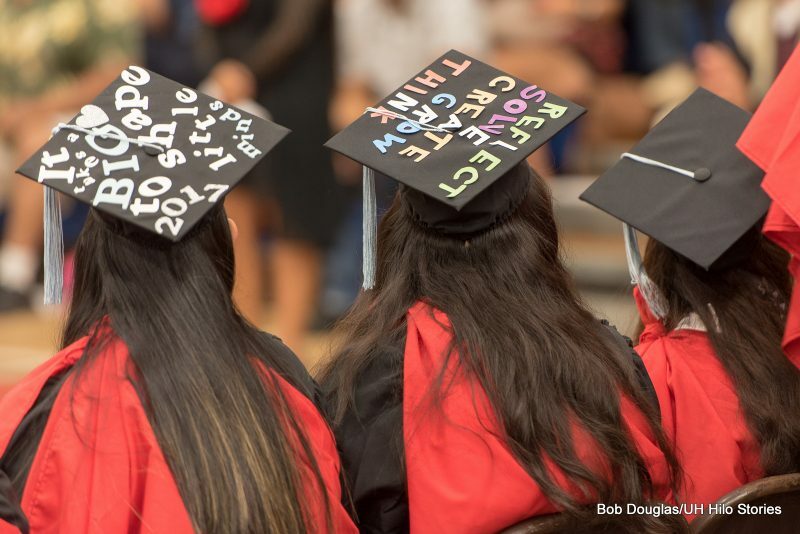 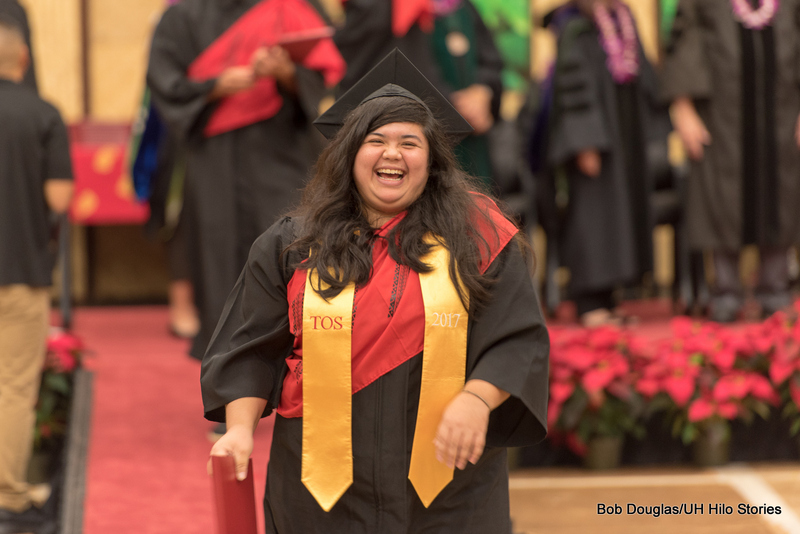 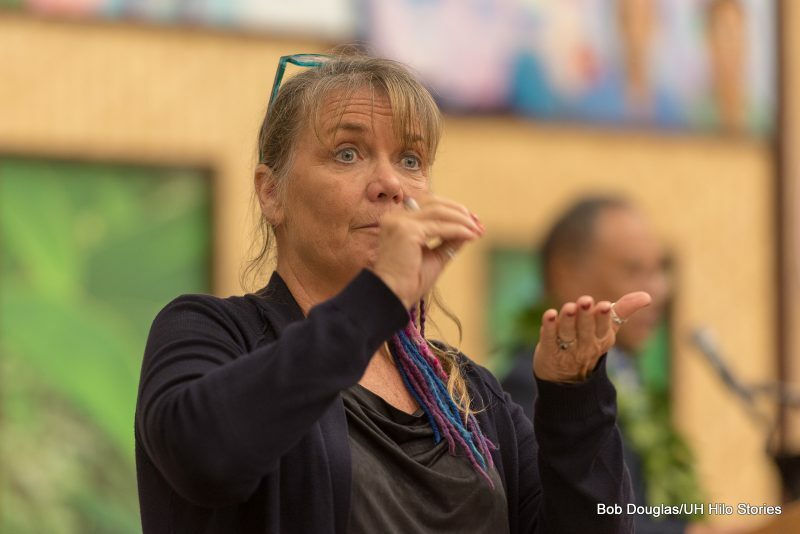 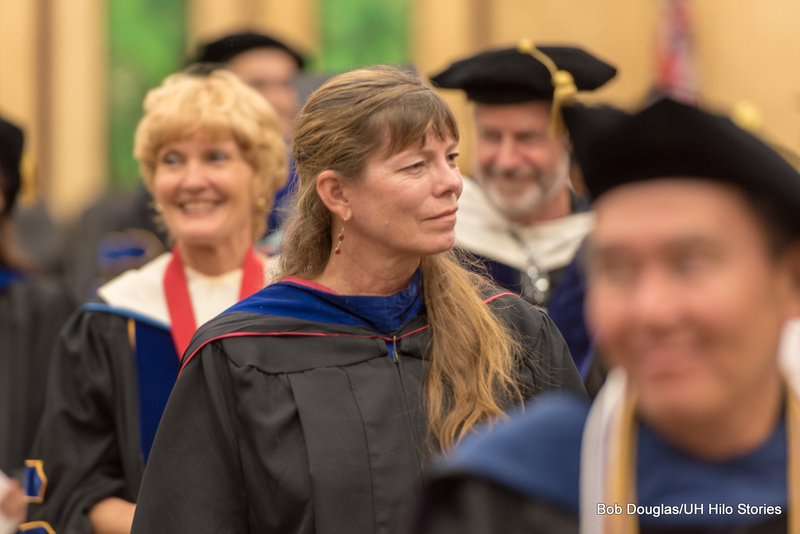 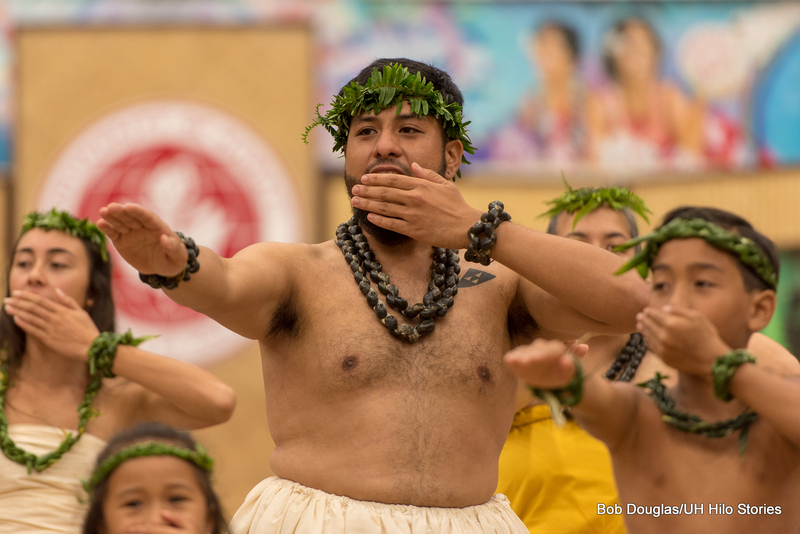 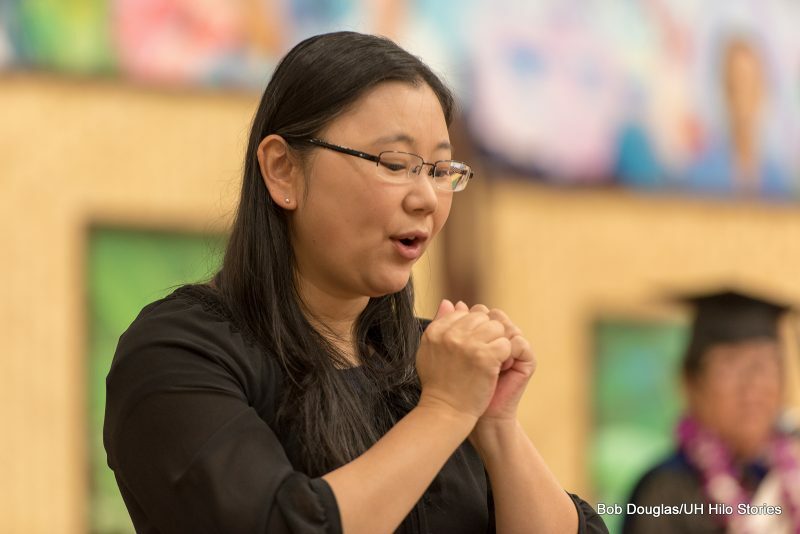 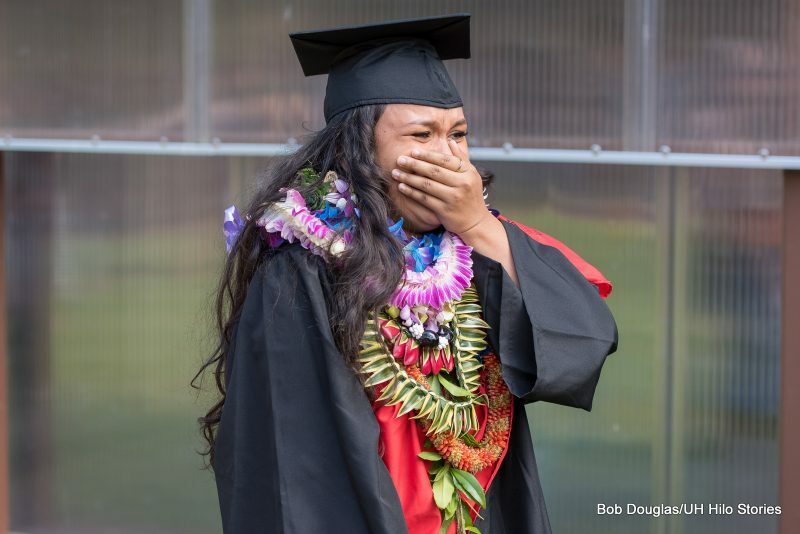 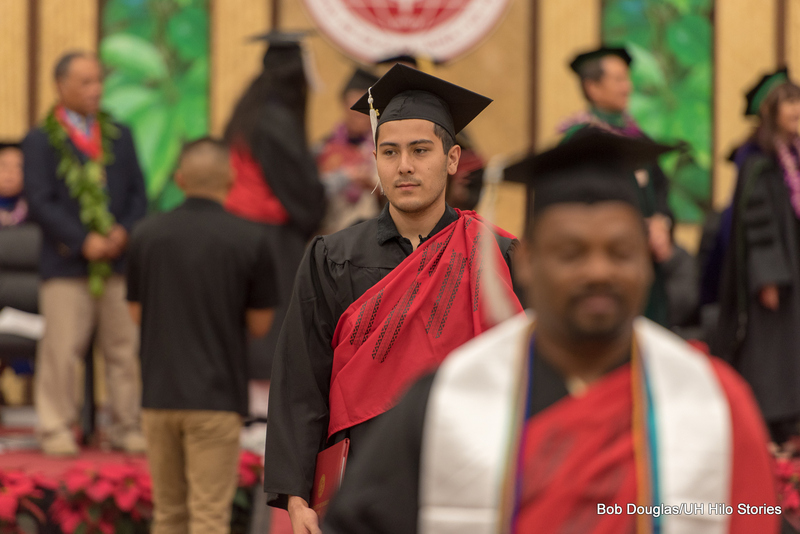 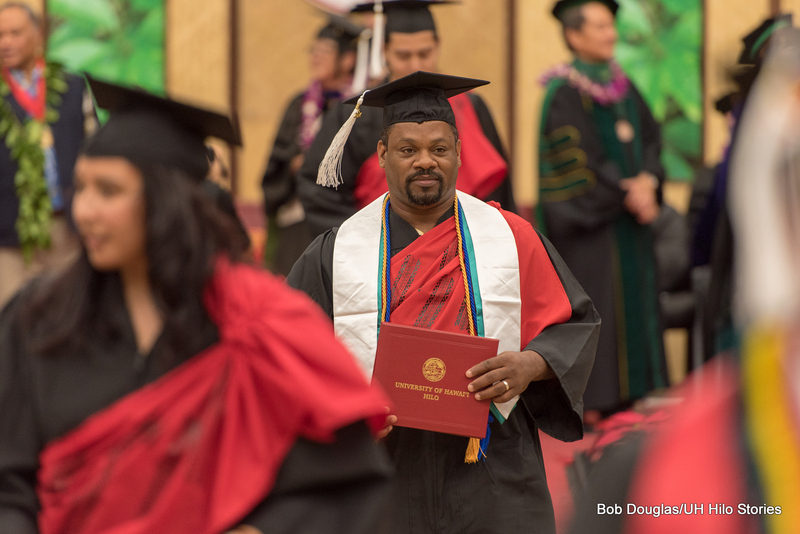 The extraordinary talent, diversity, and inspiration of these fine scholars are beautifully captured in this photo essay of fall commencement by Bob Douglas. 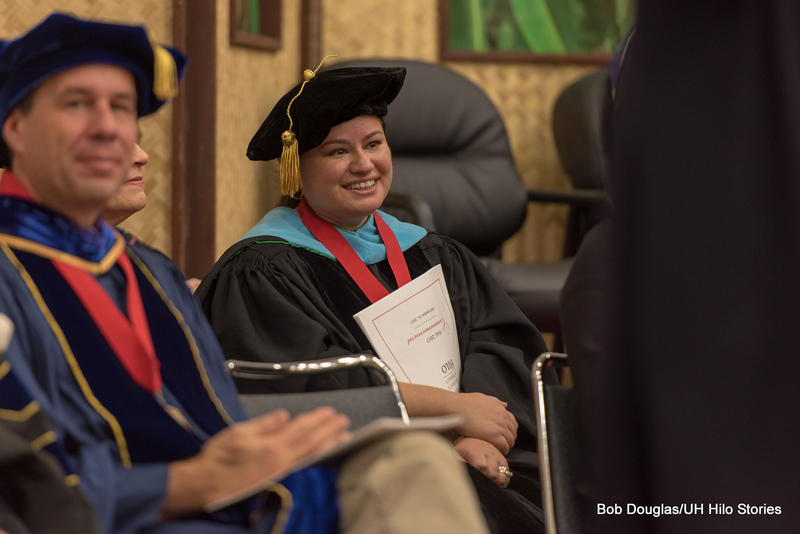 Two graduates after commencement ceremonies. 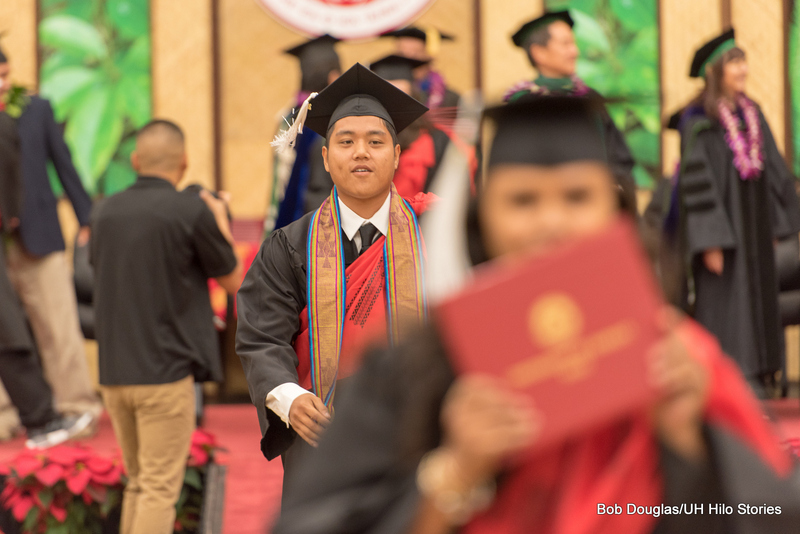 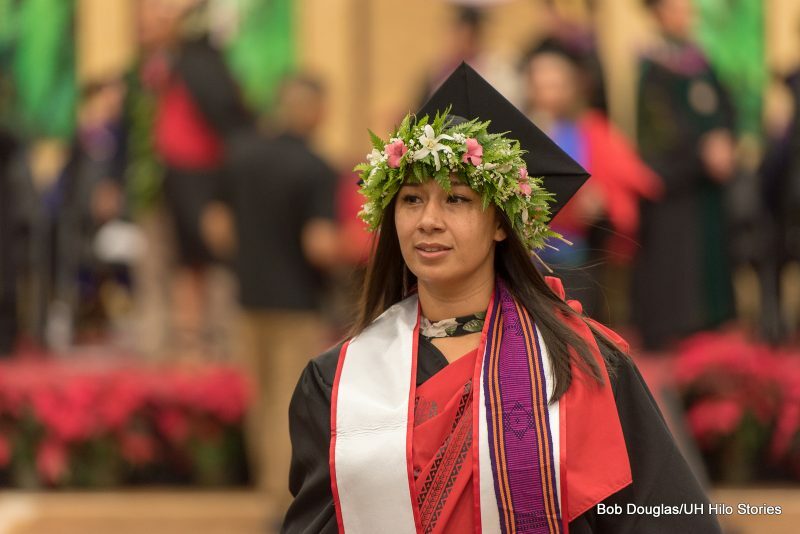 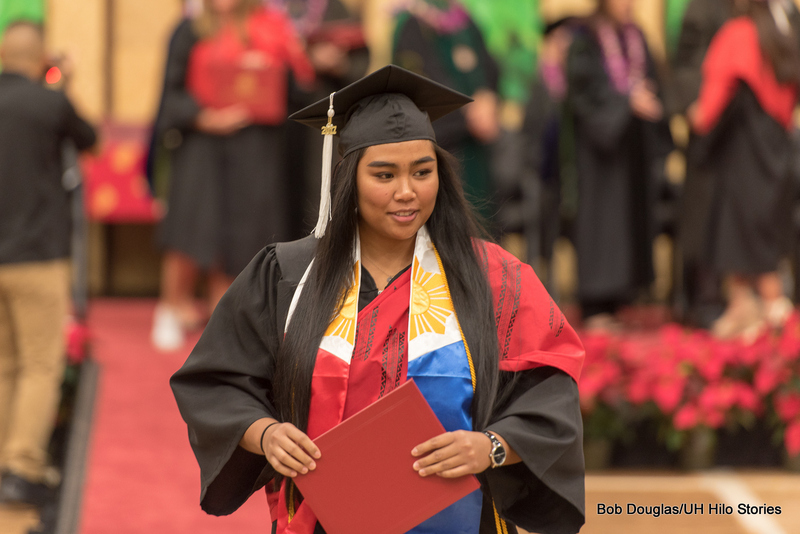 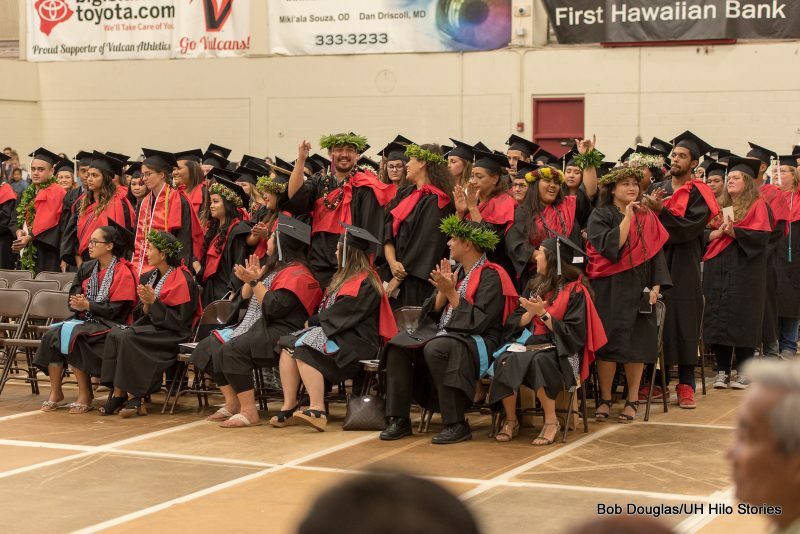 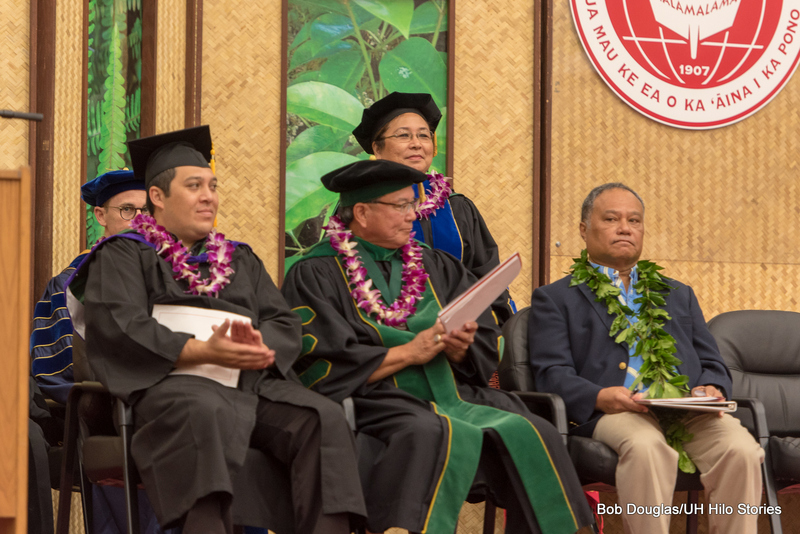 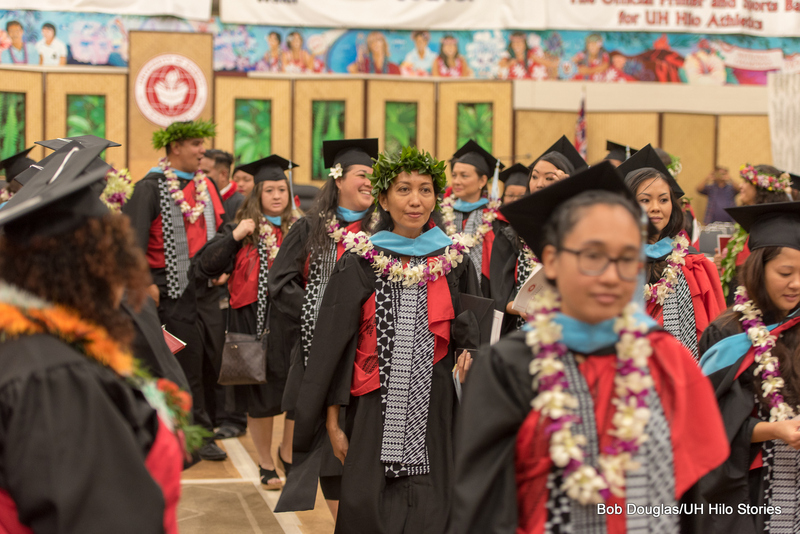 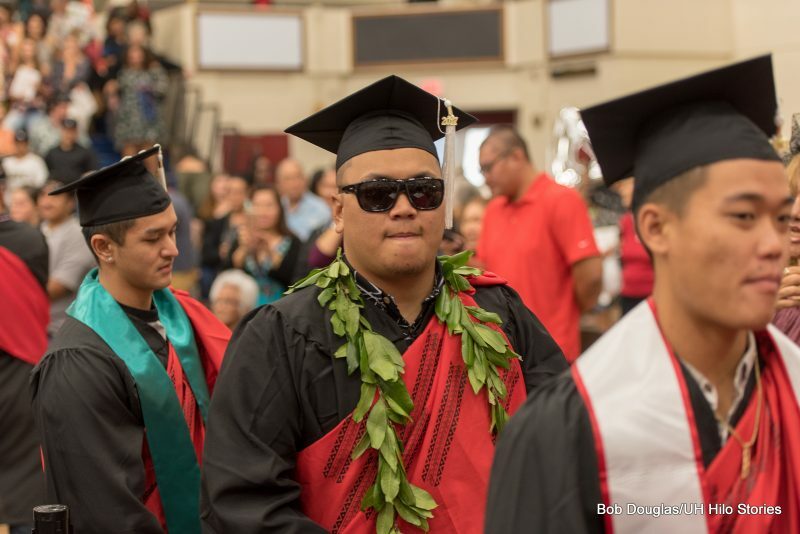 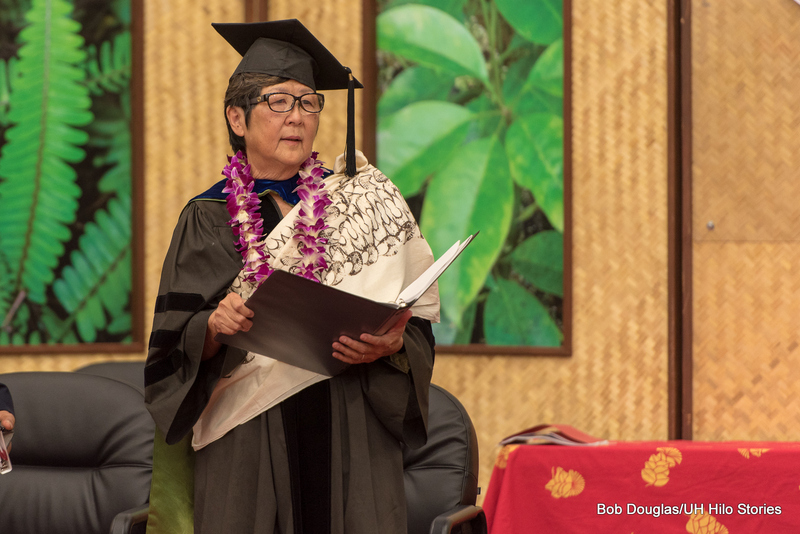 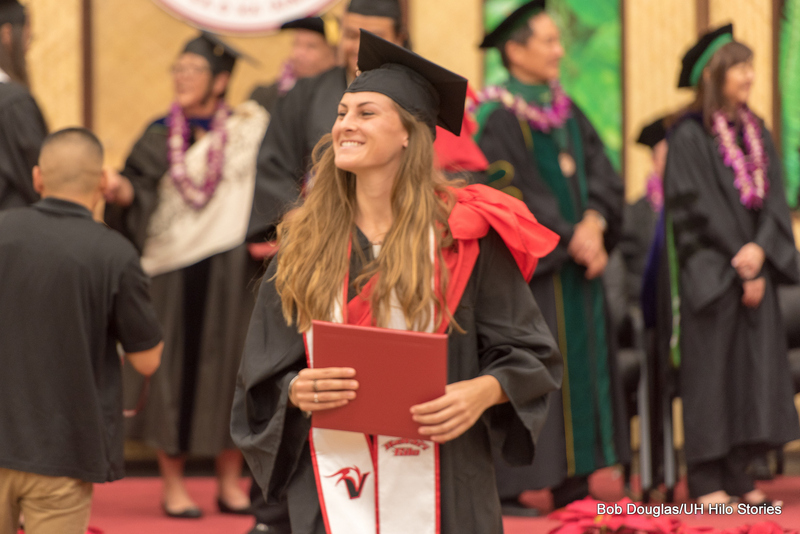 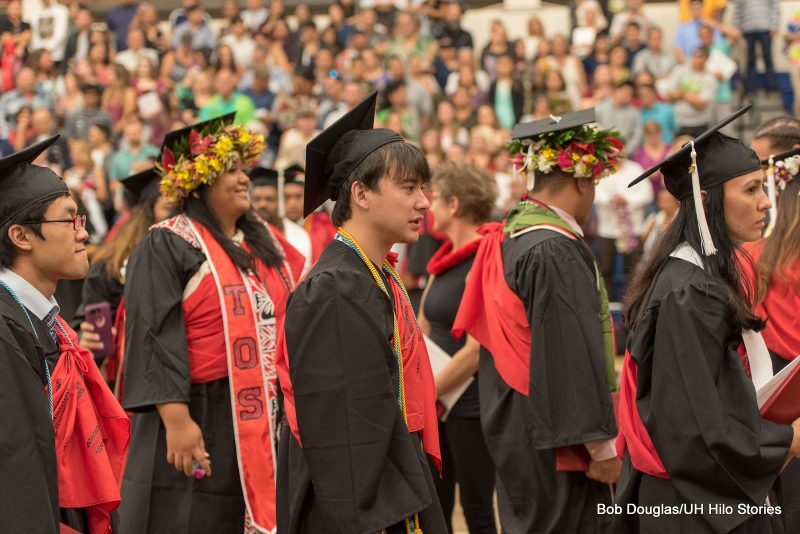 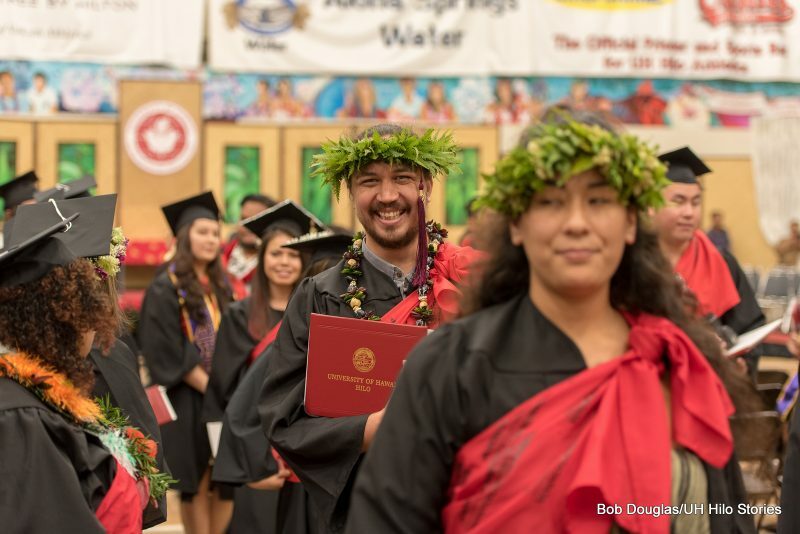 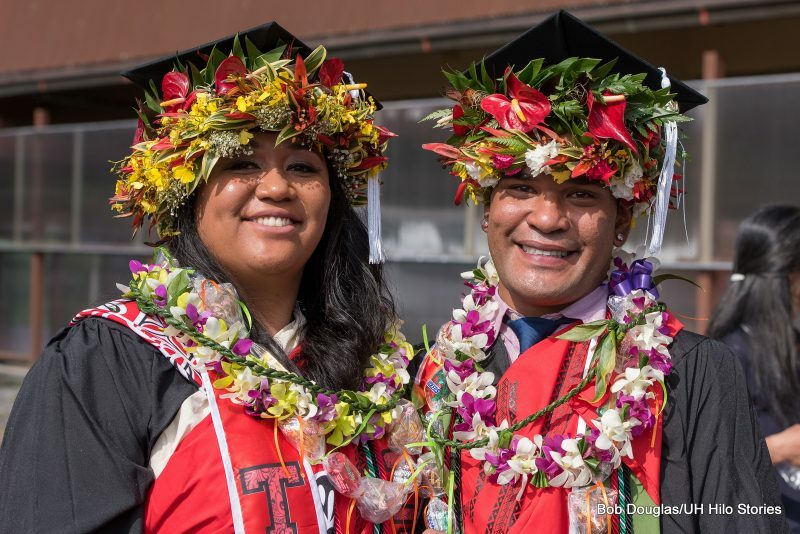 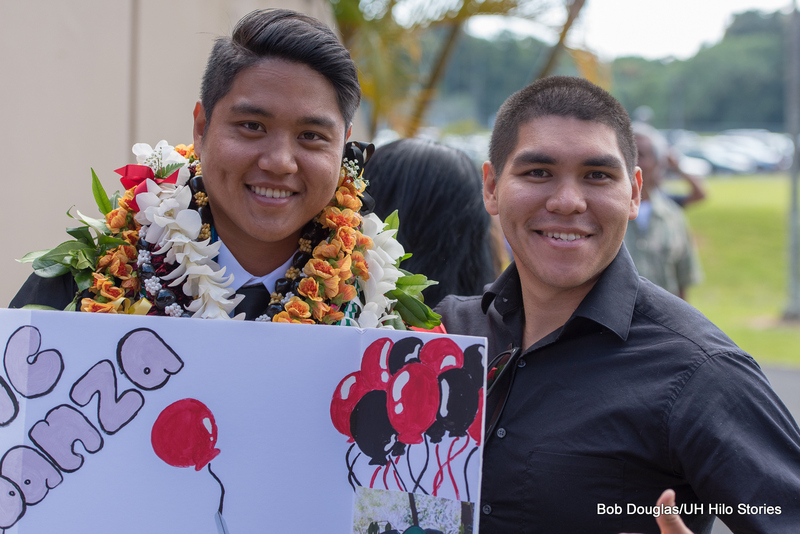 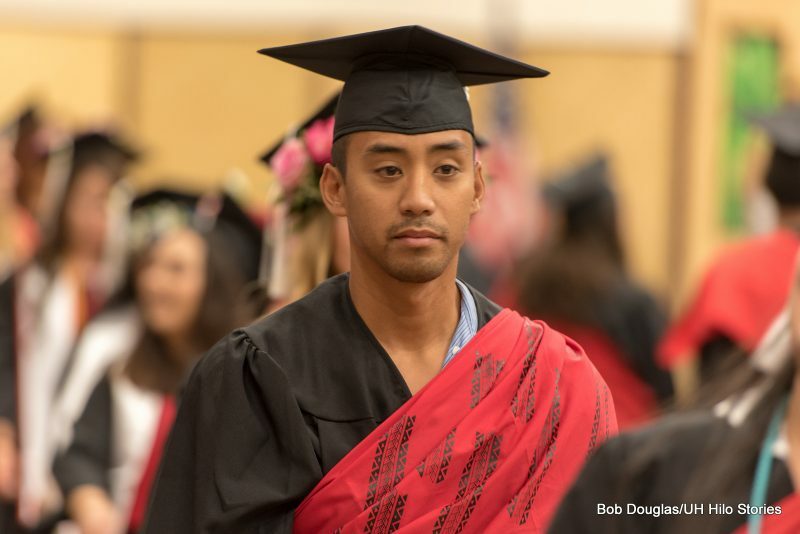 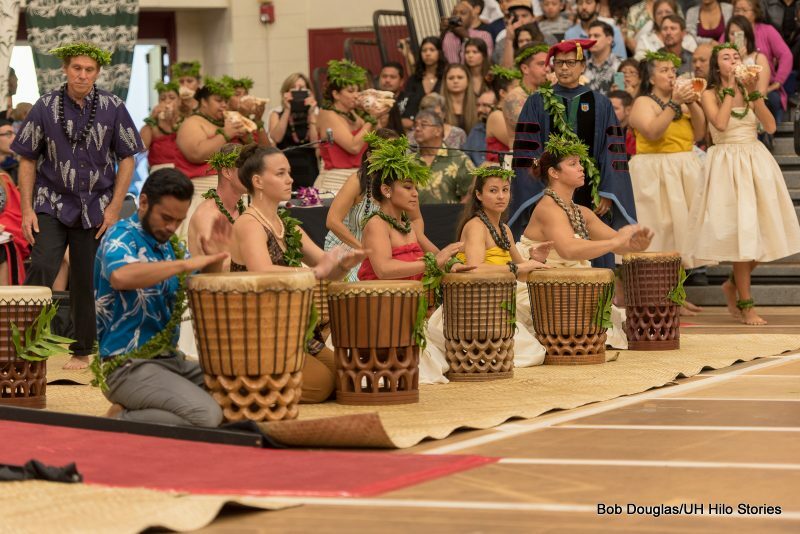 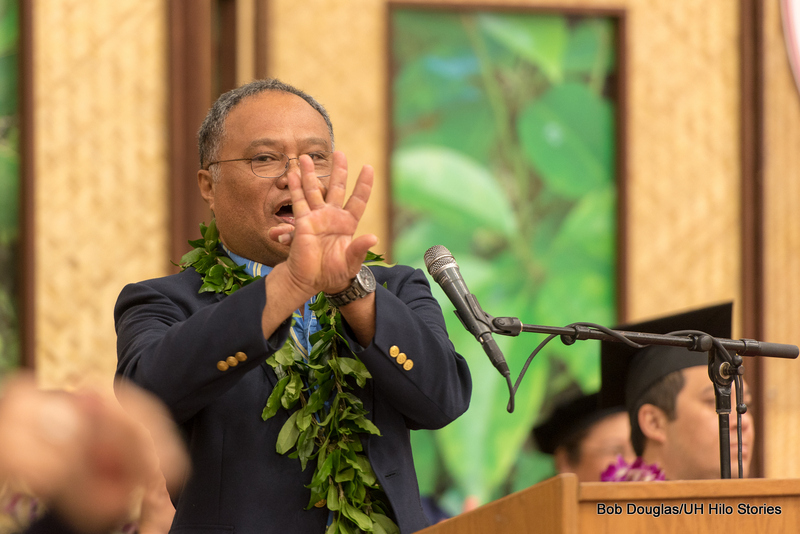 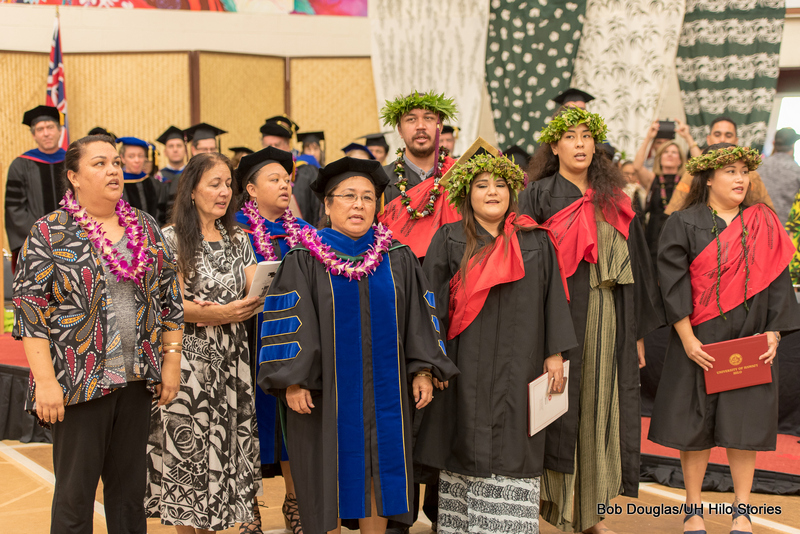 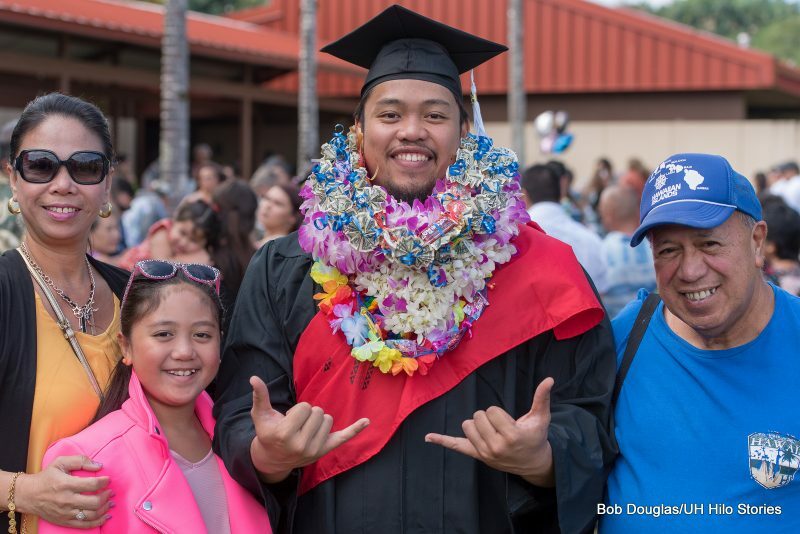 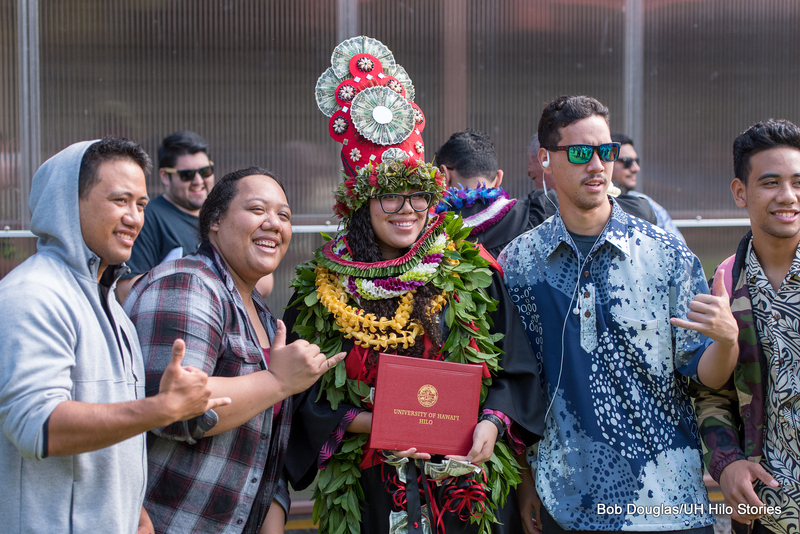 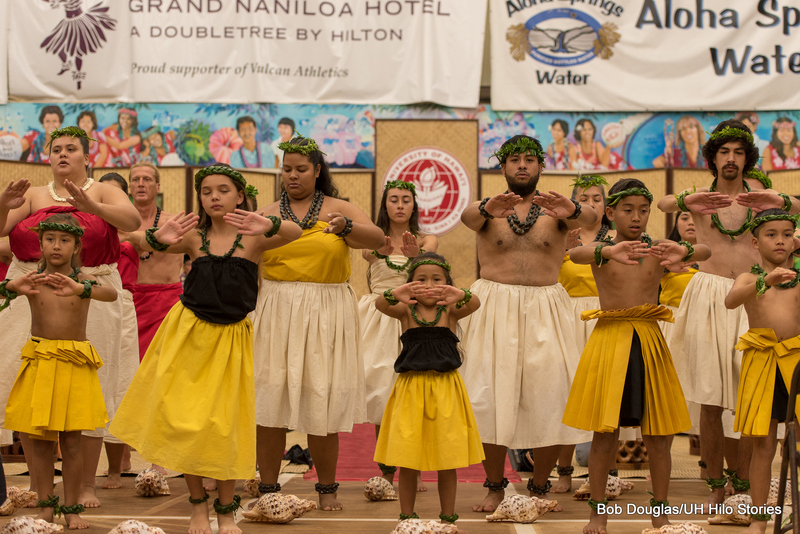 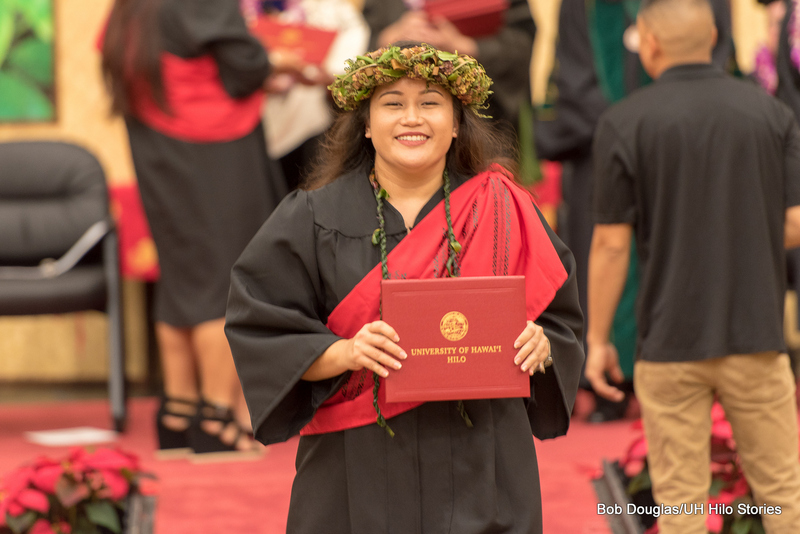 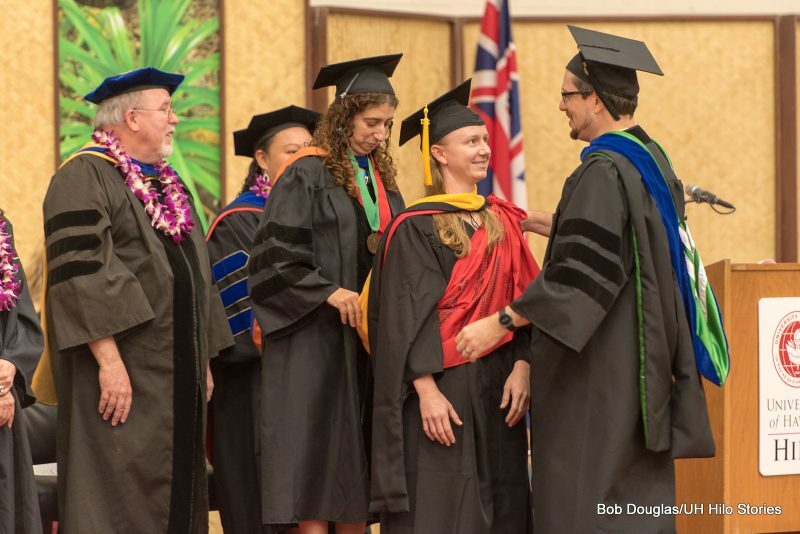 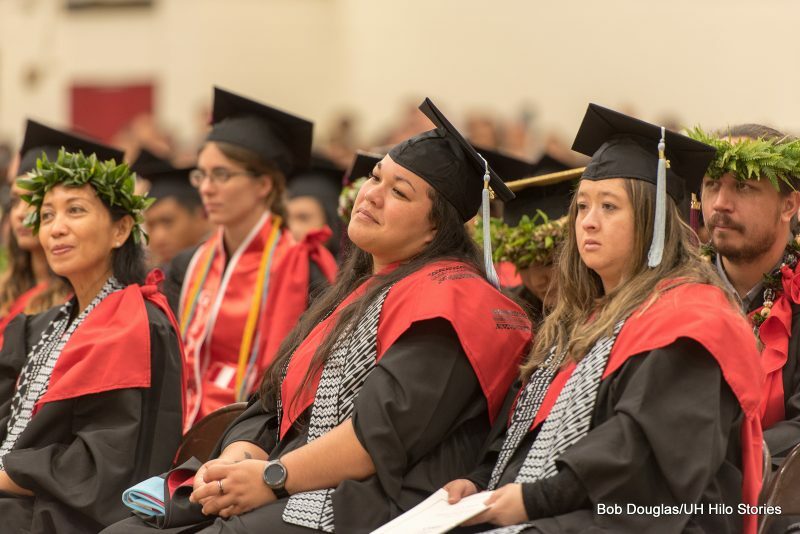 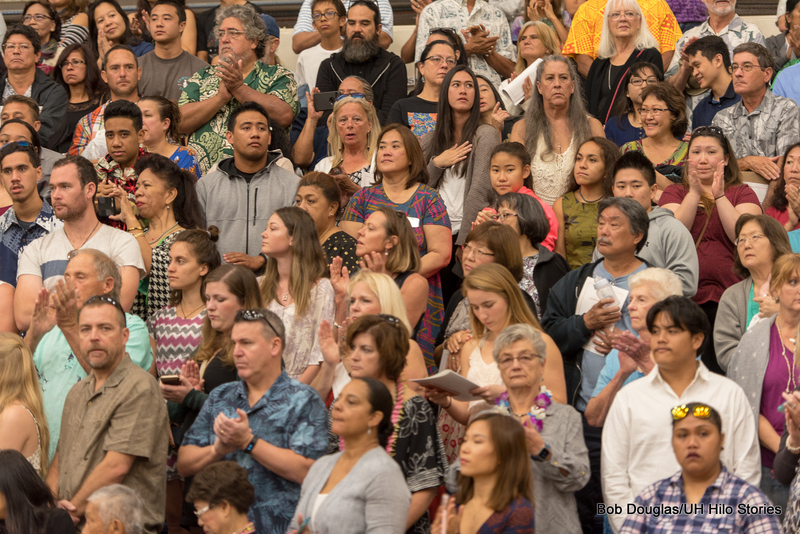 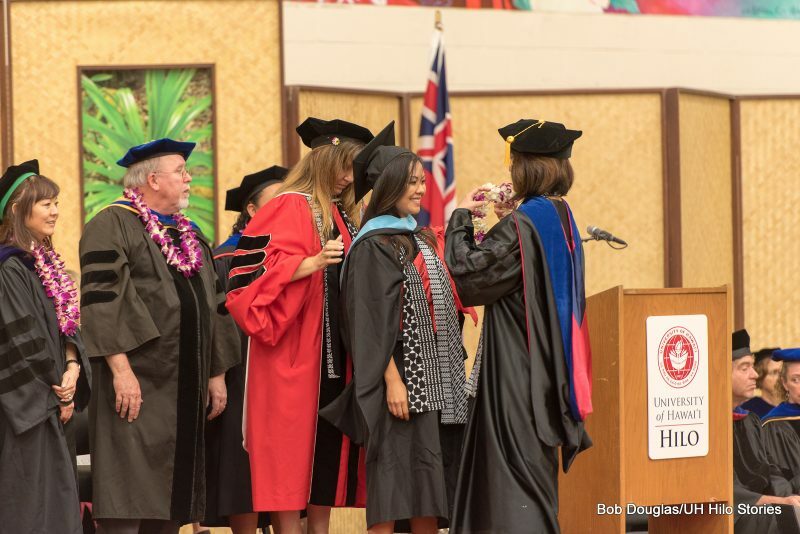 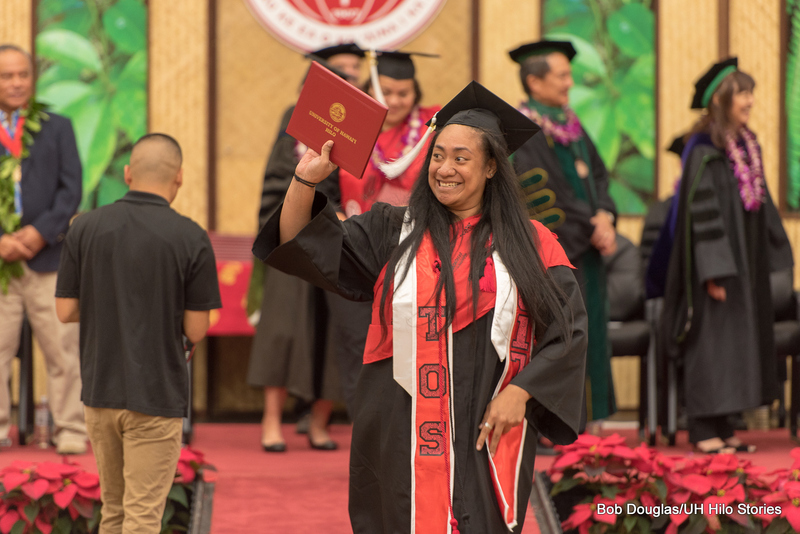 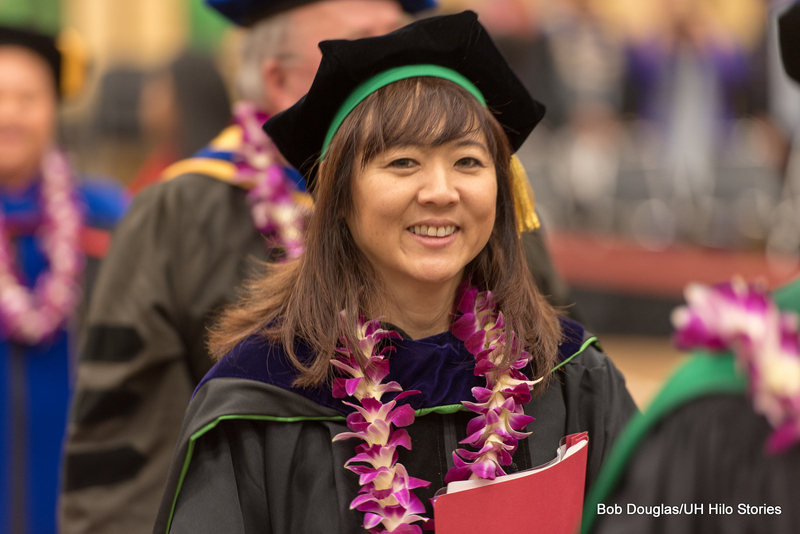 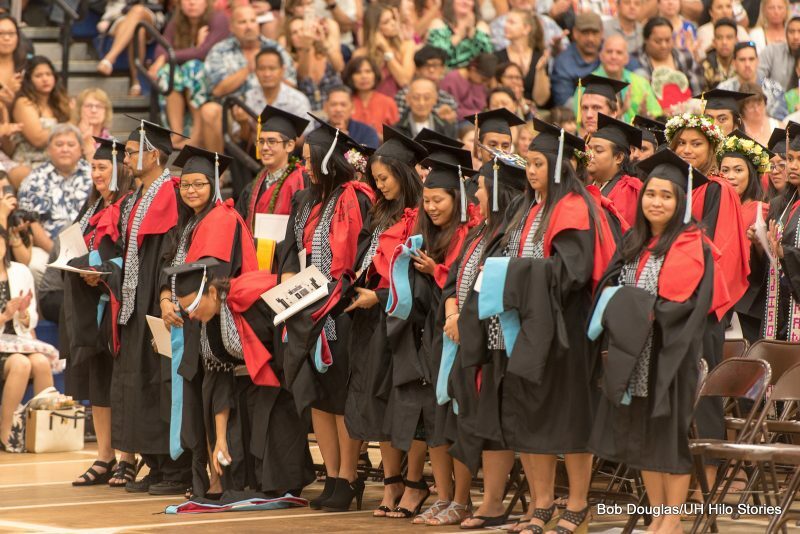 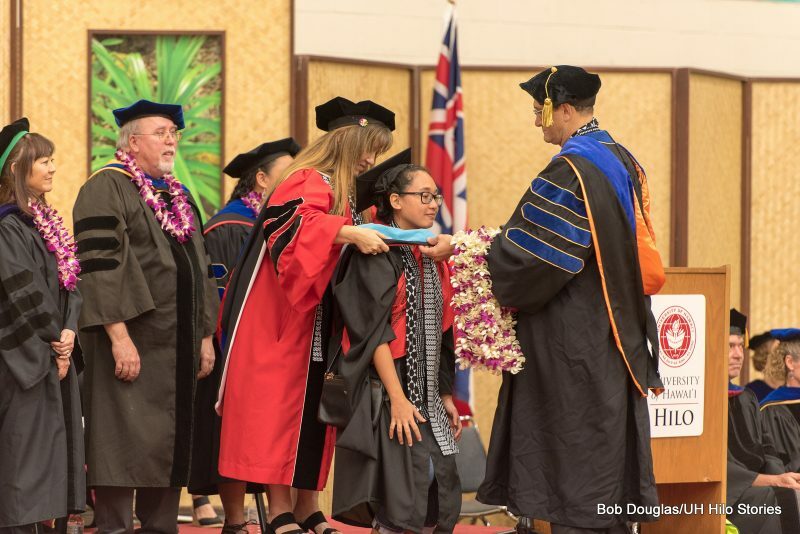 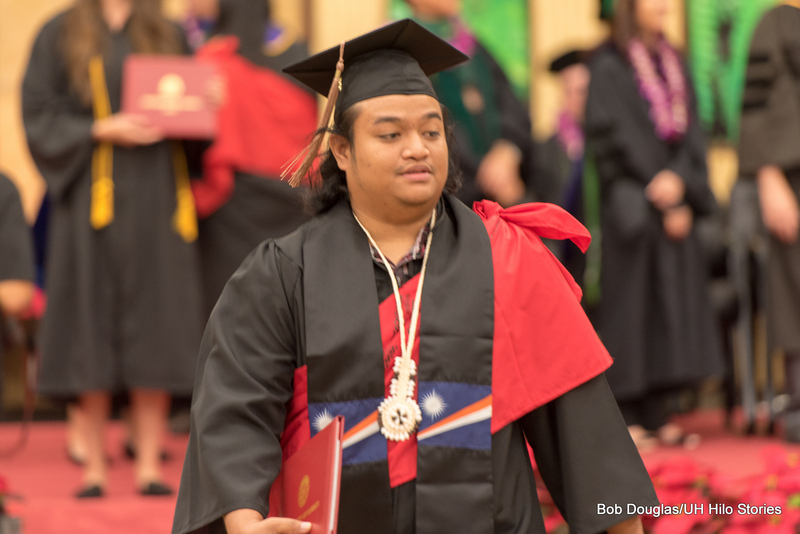 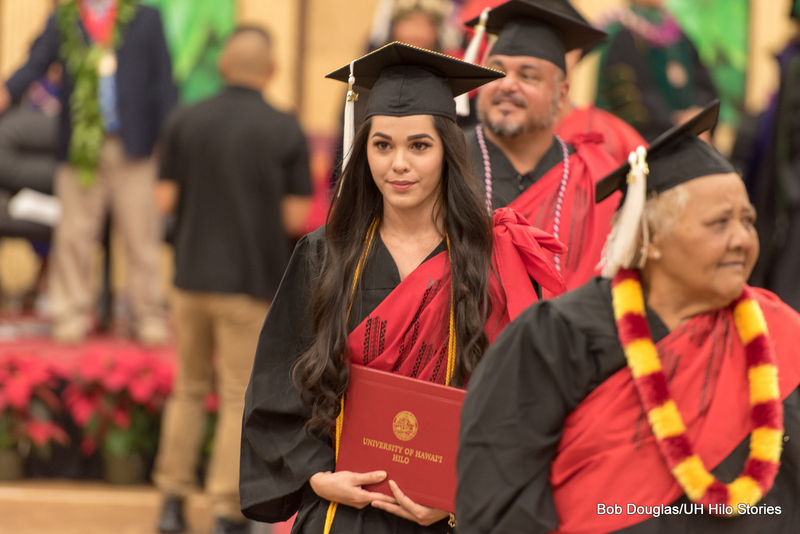 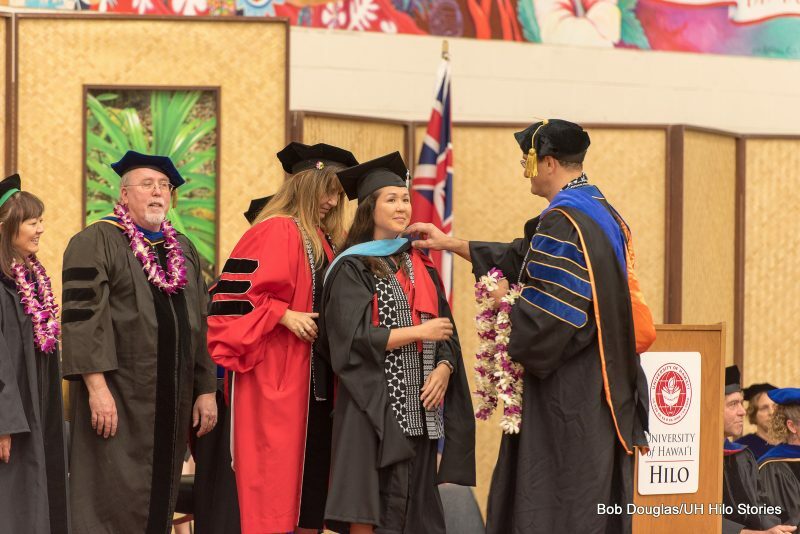 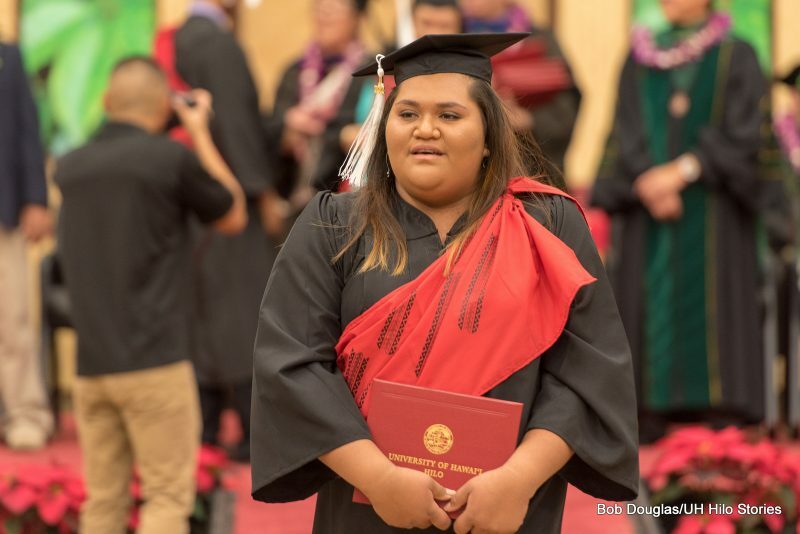 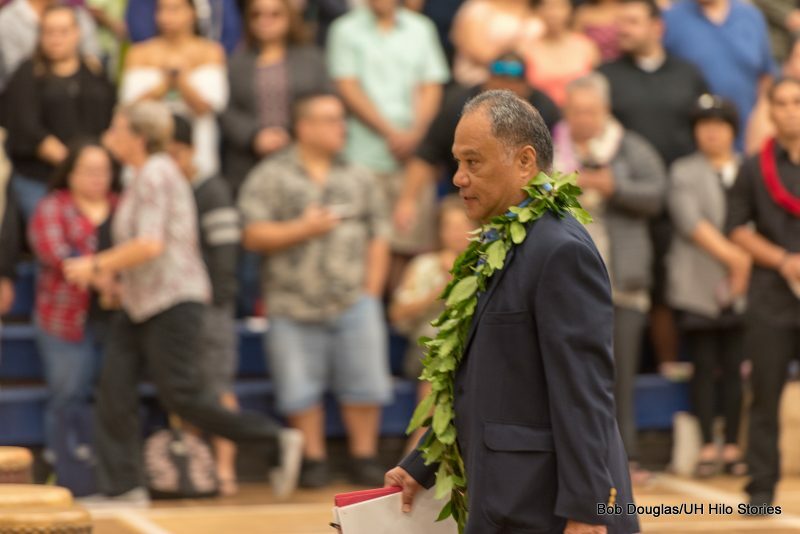 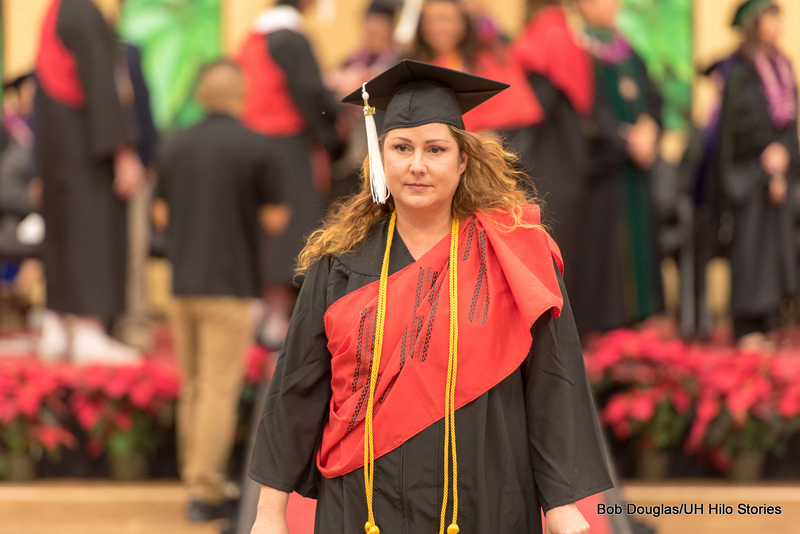 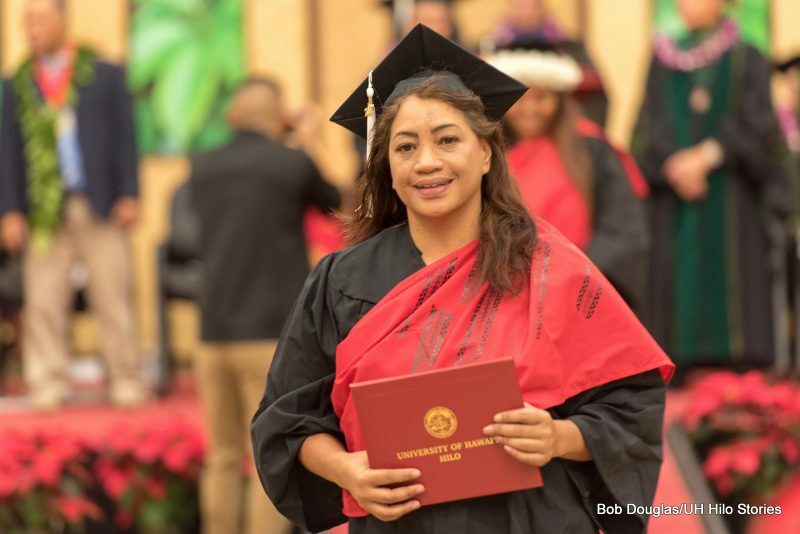 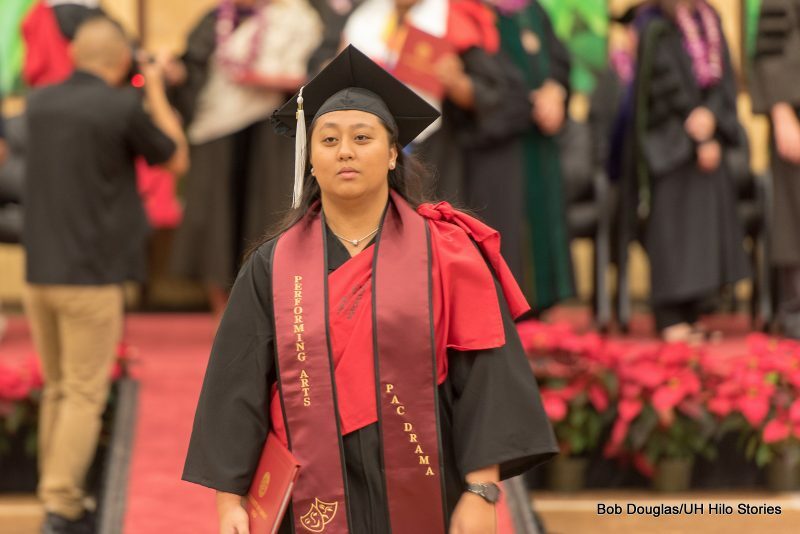 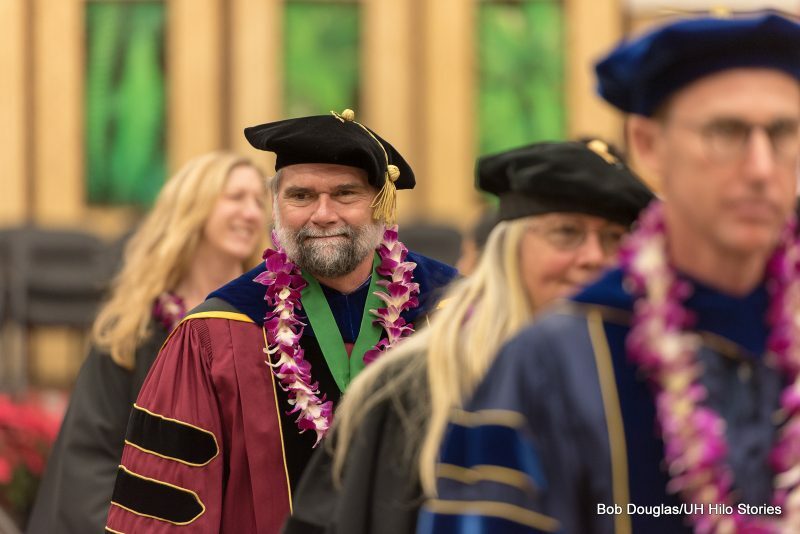 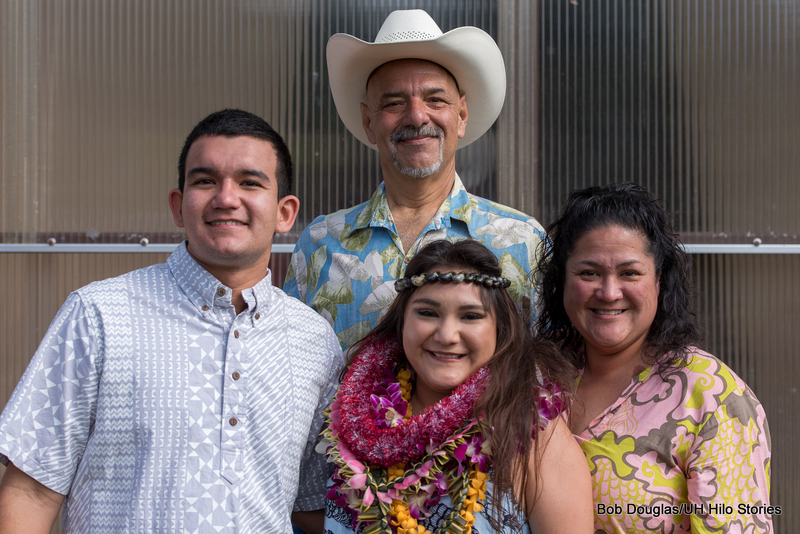 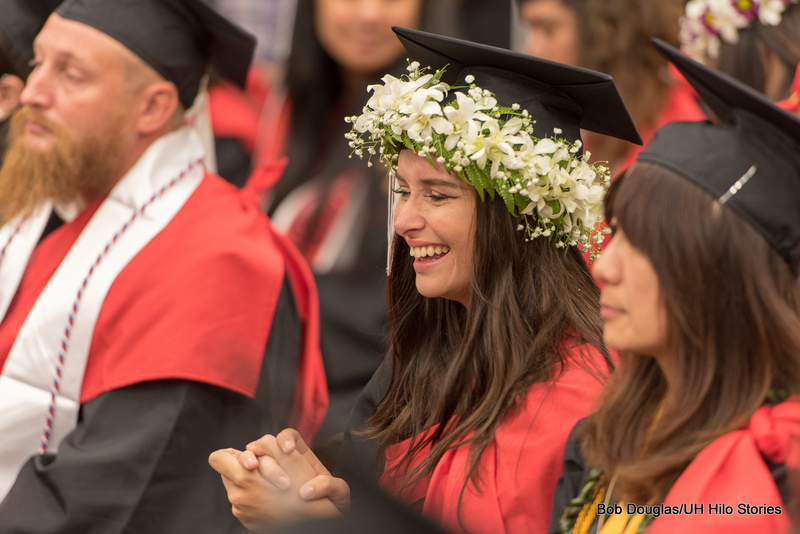 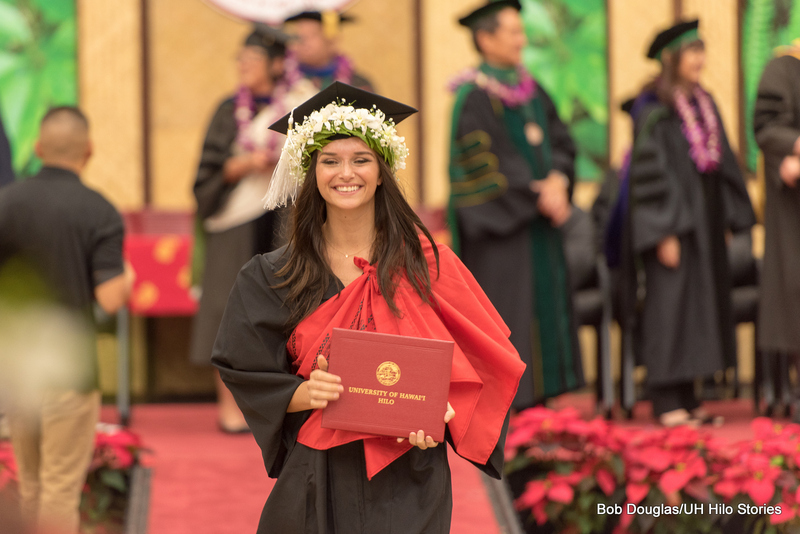 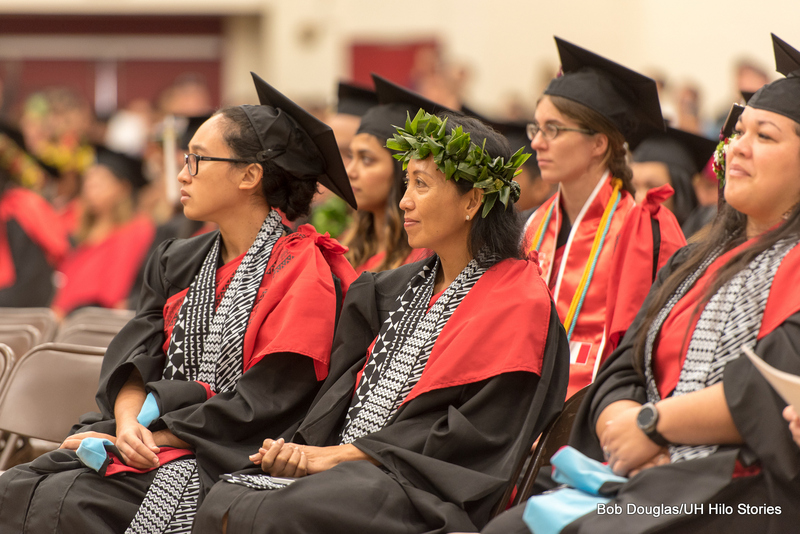 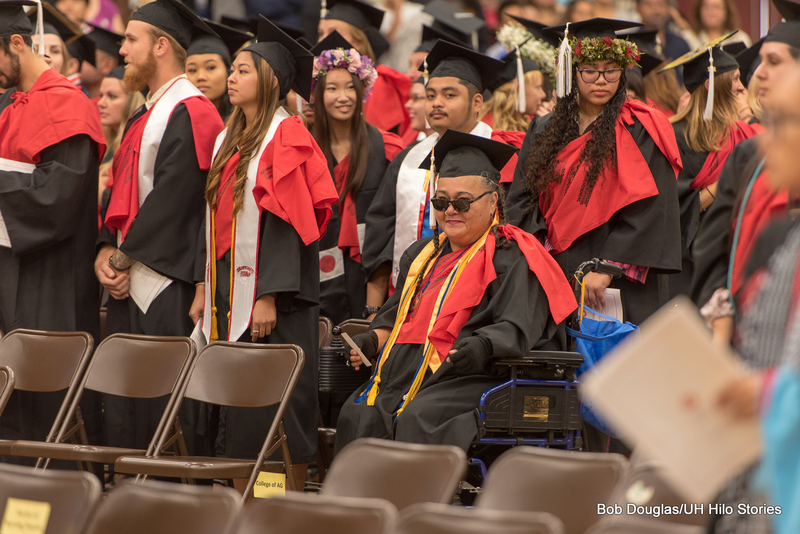 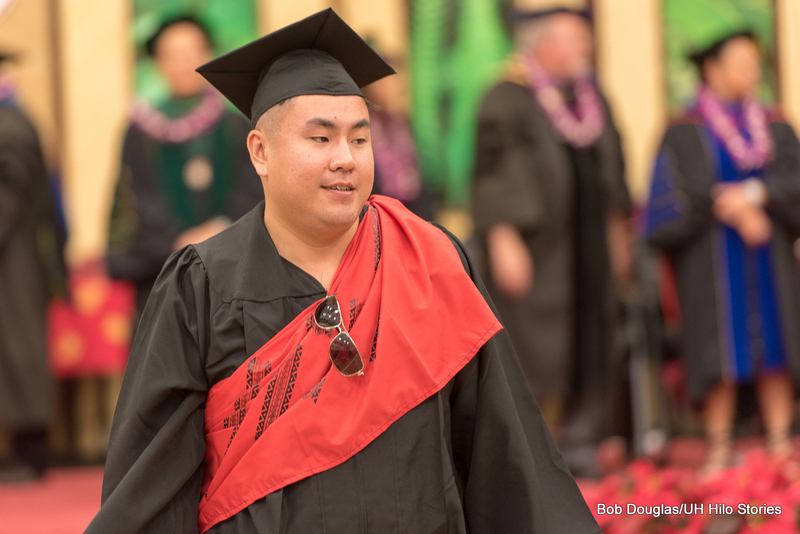 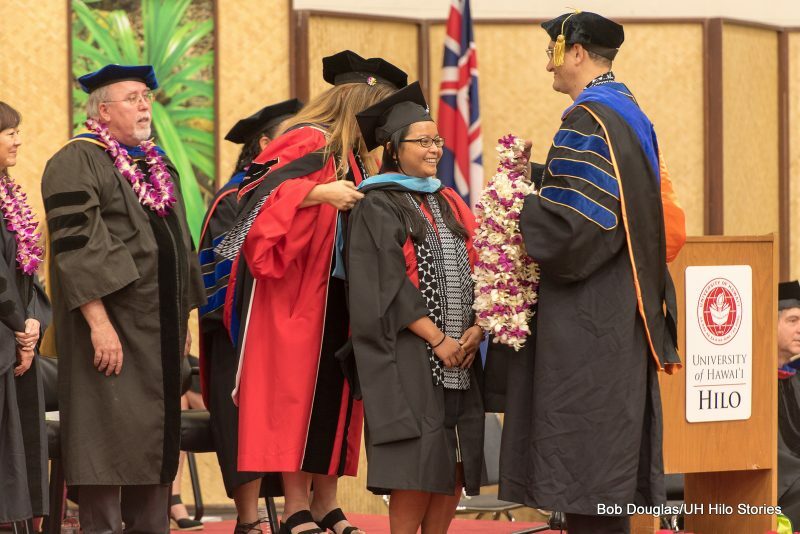 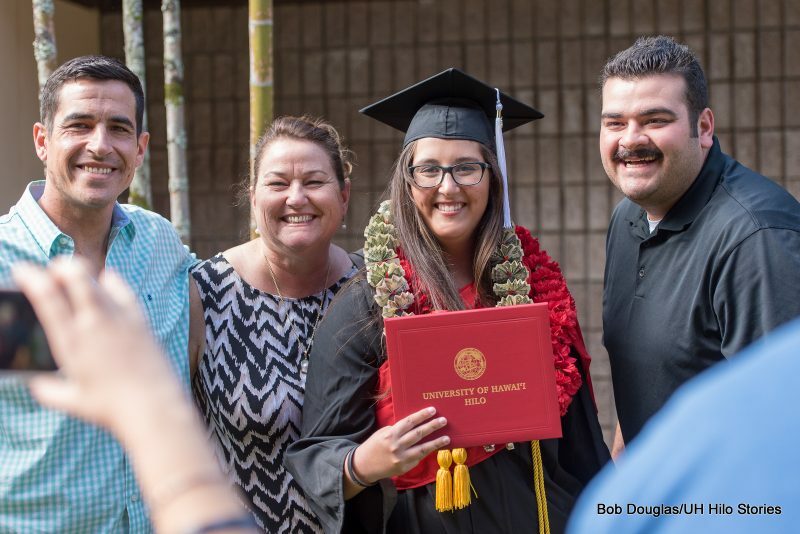 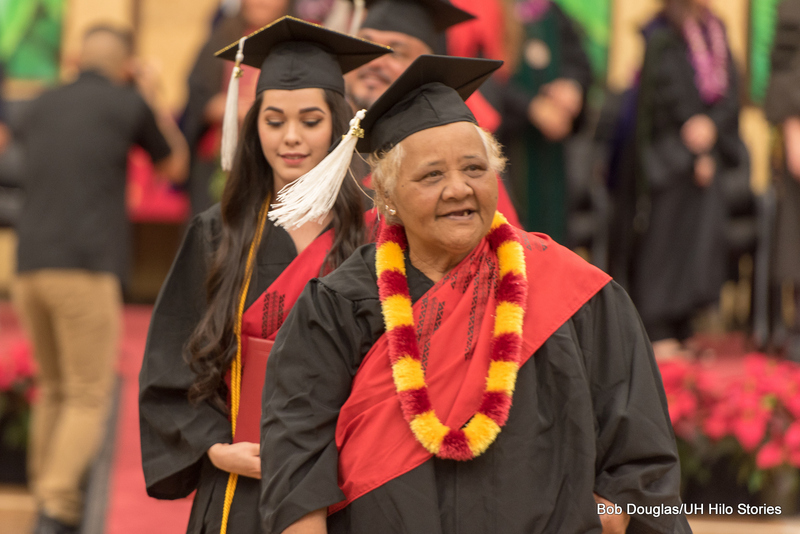 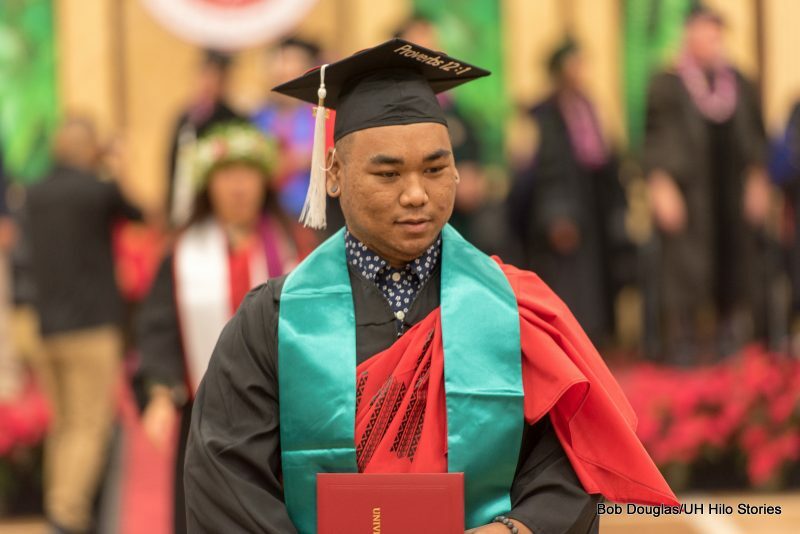 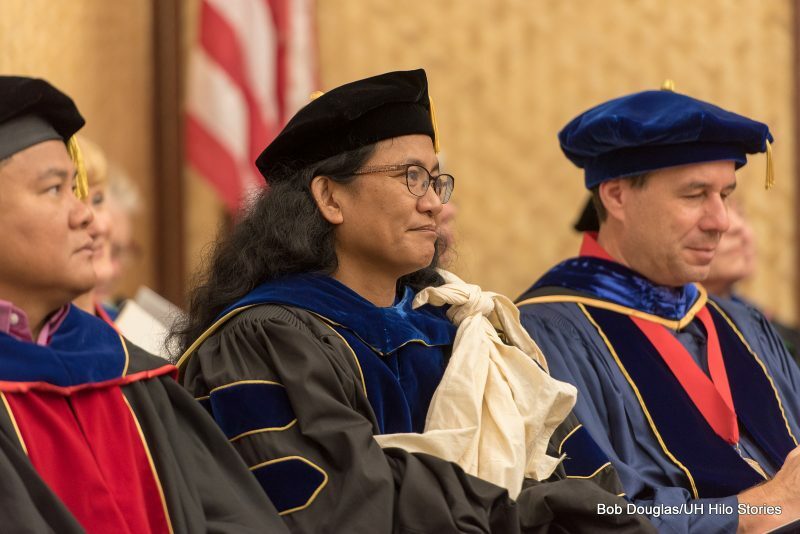 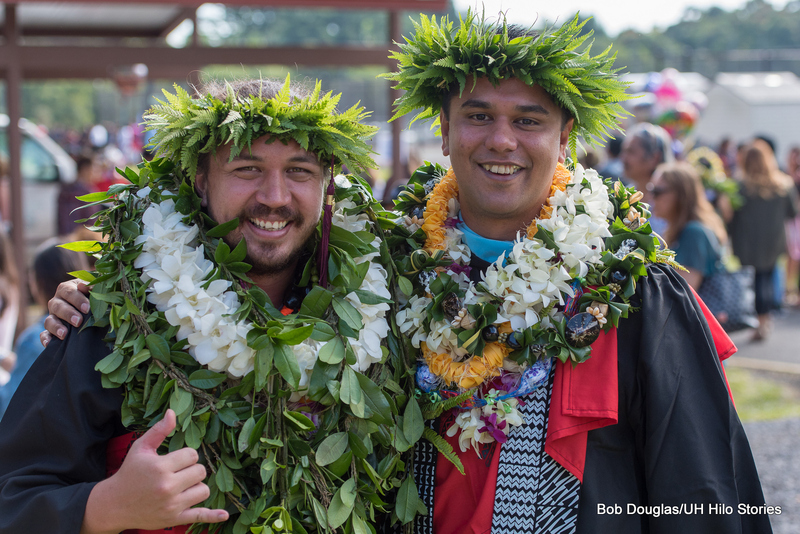 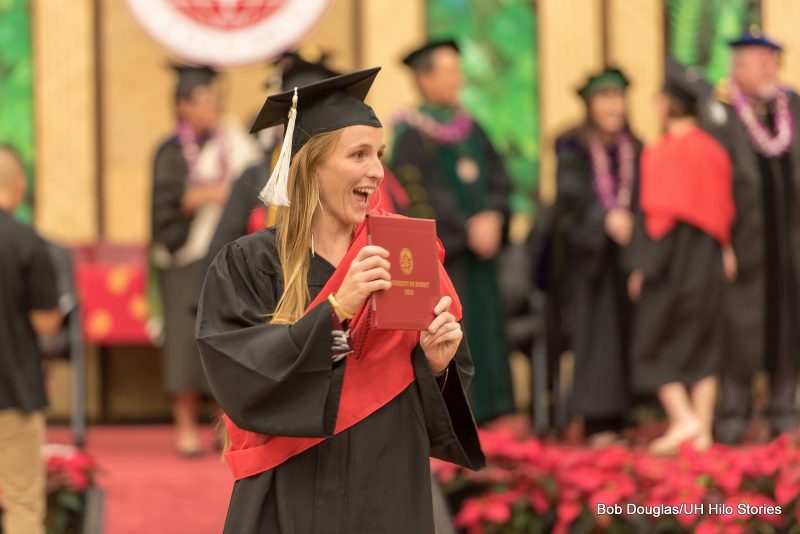 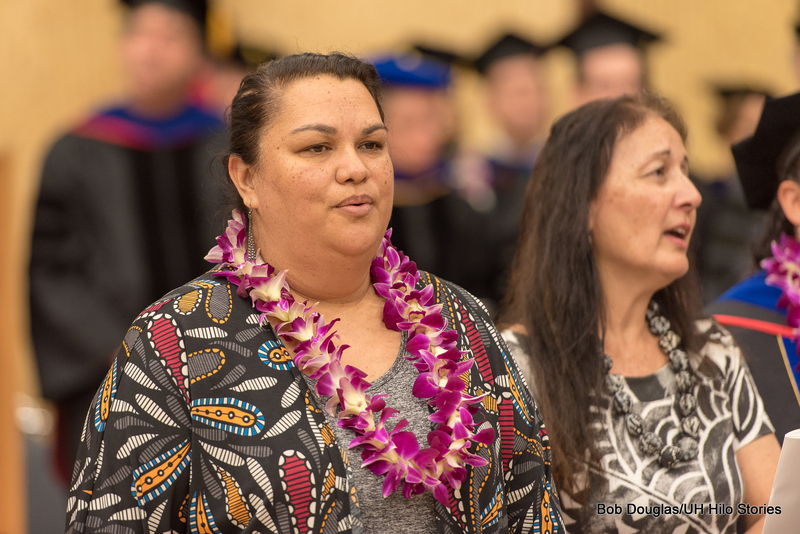 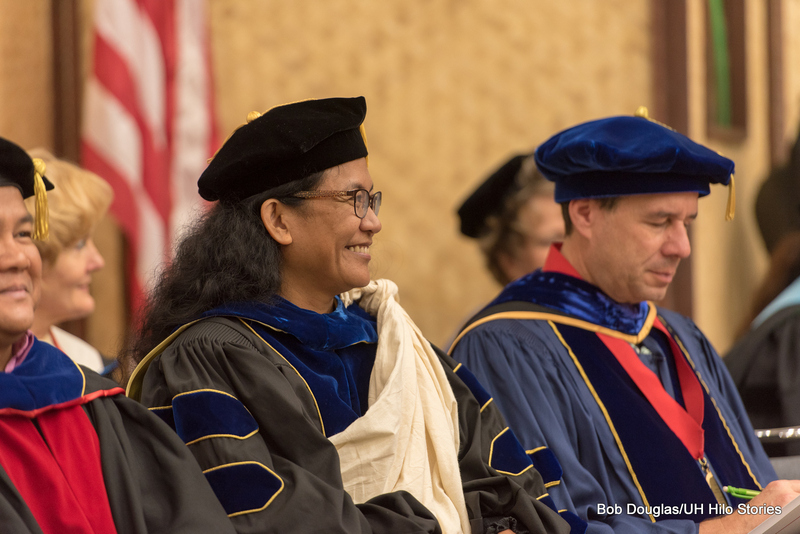 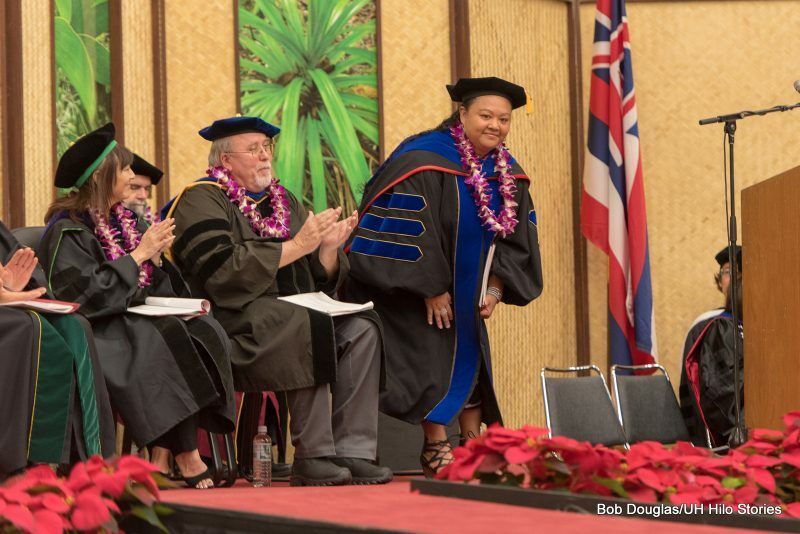 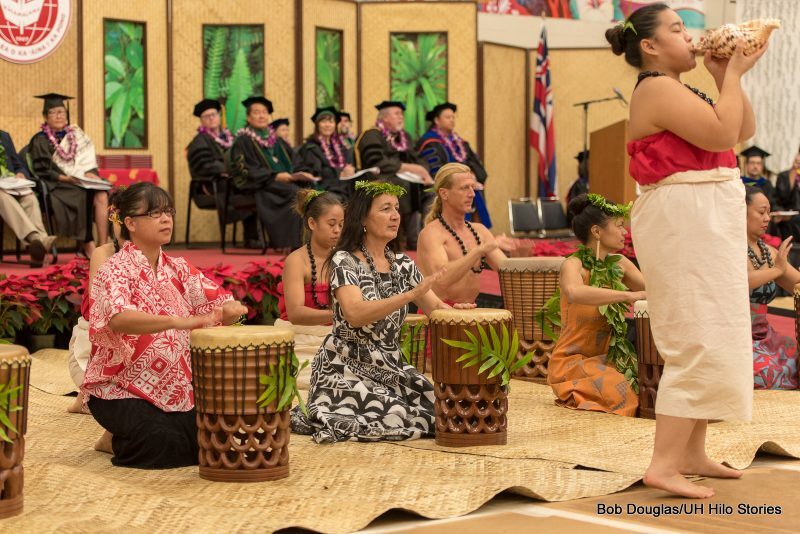 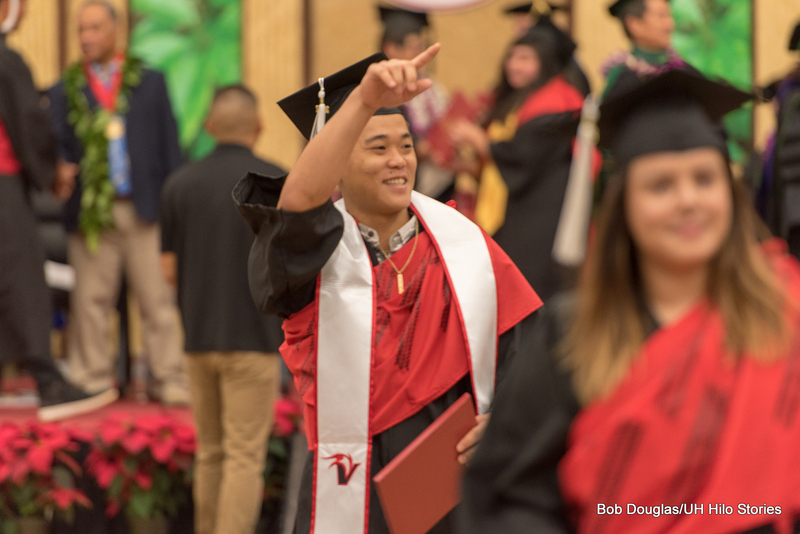 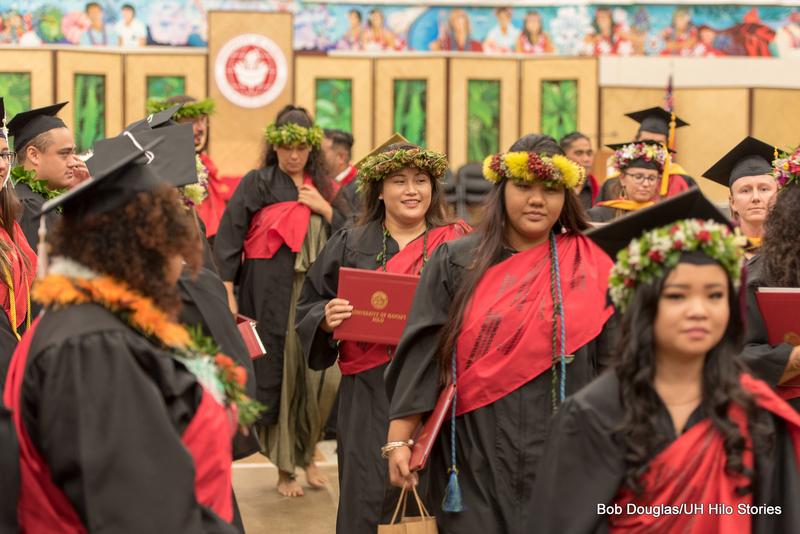 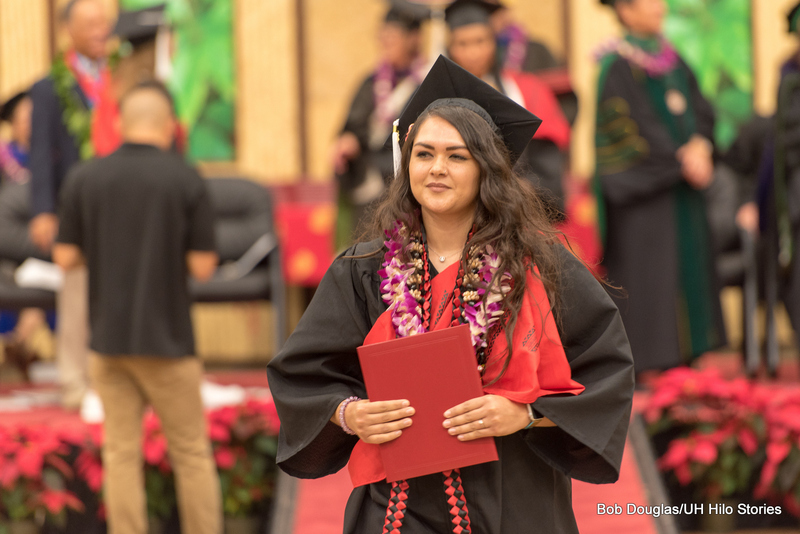 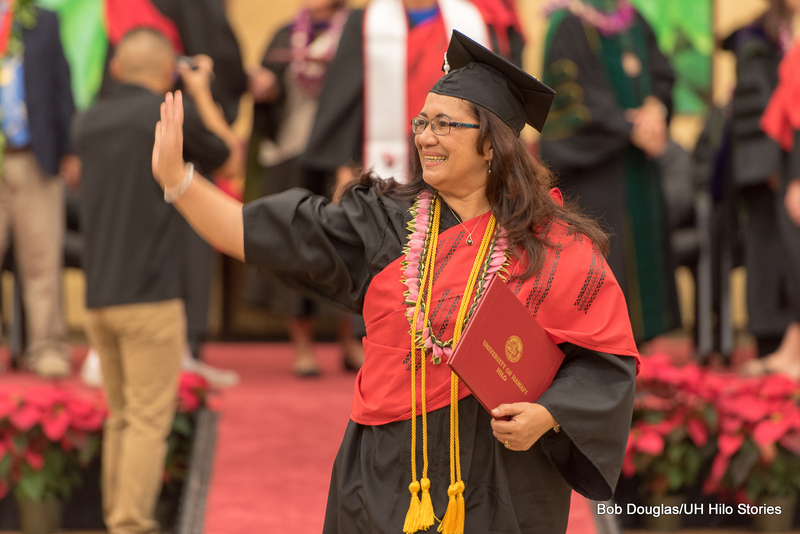 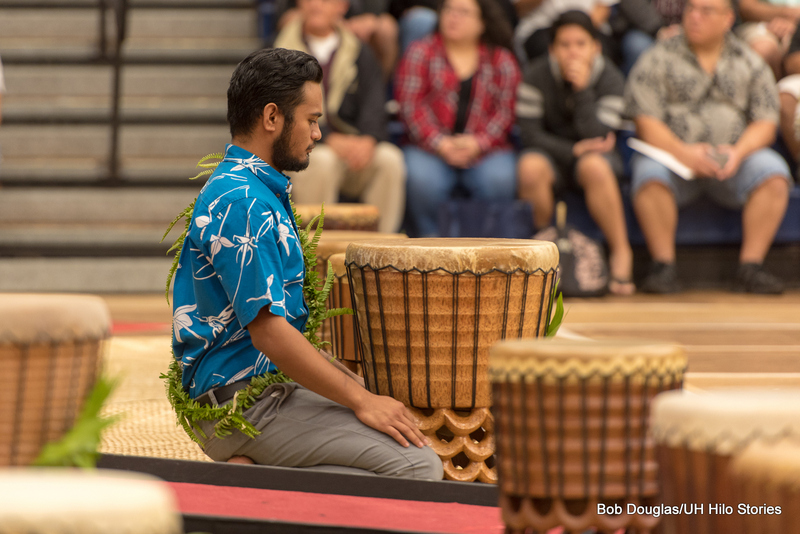 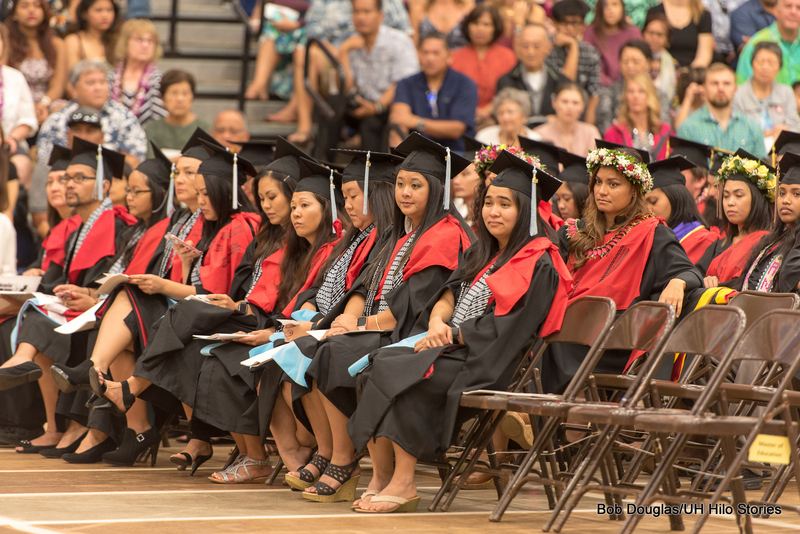 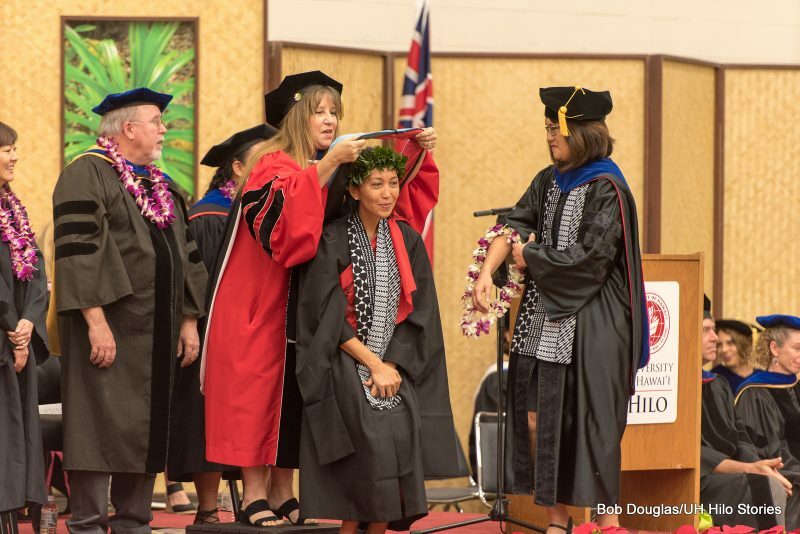 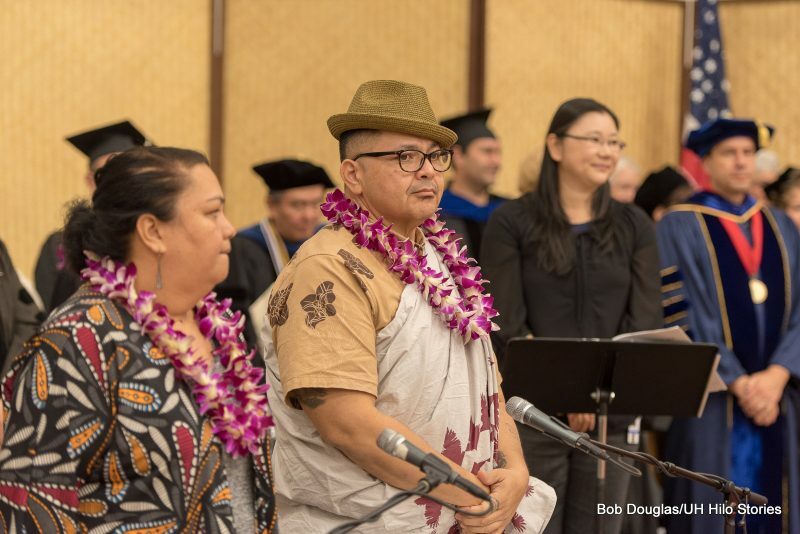 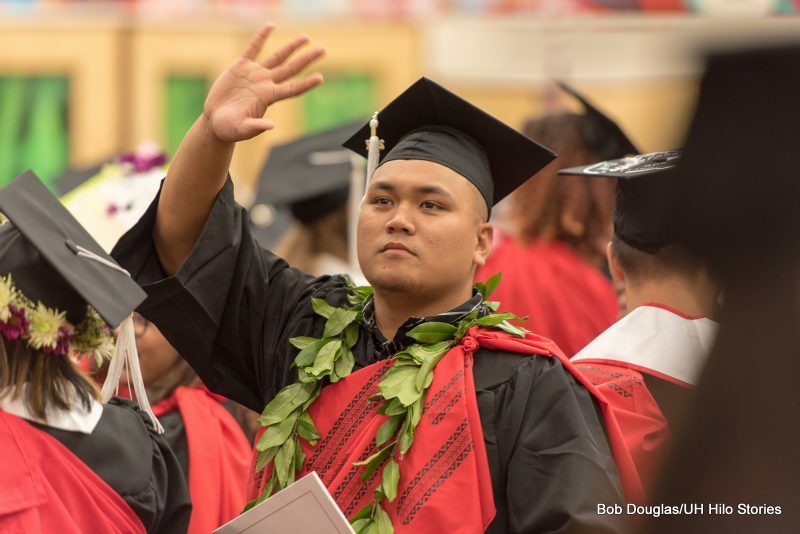 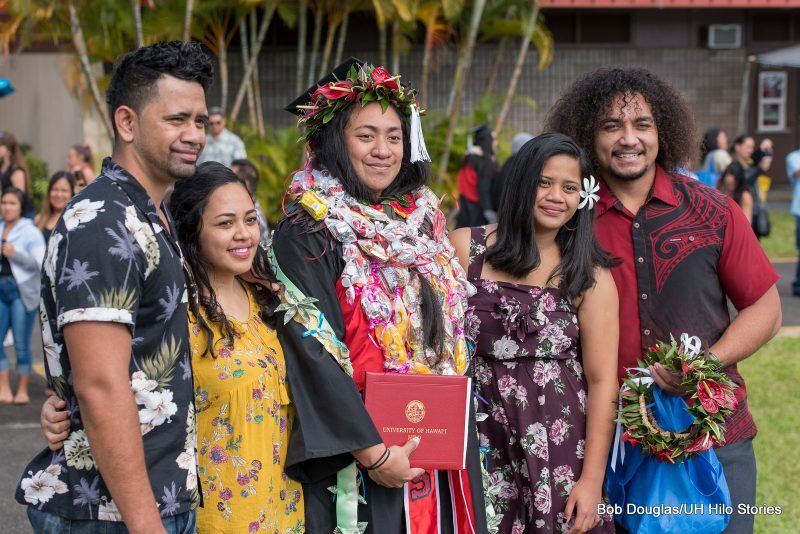 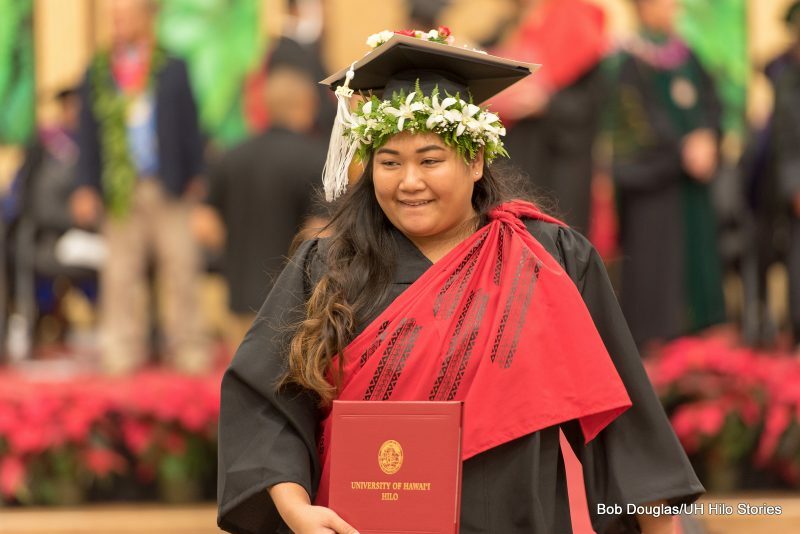 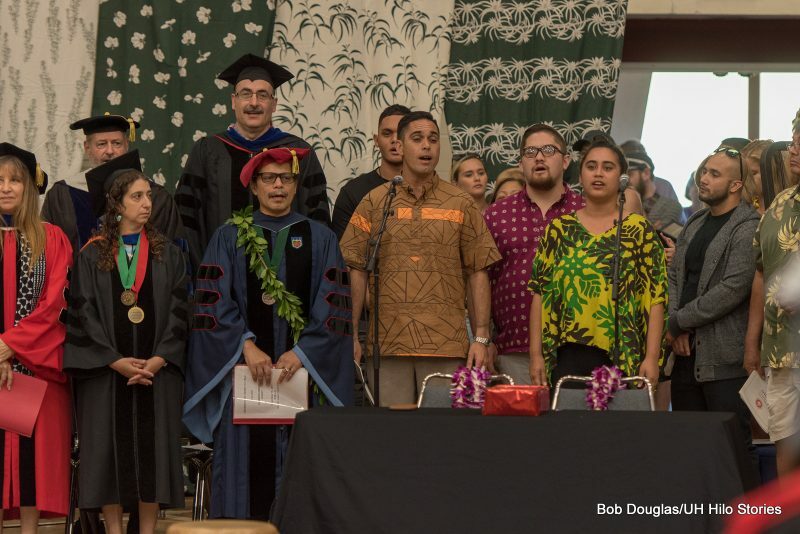 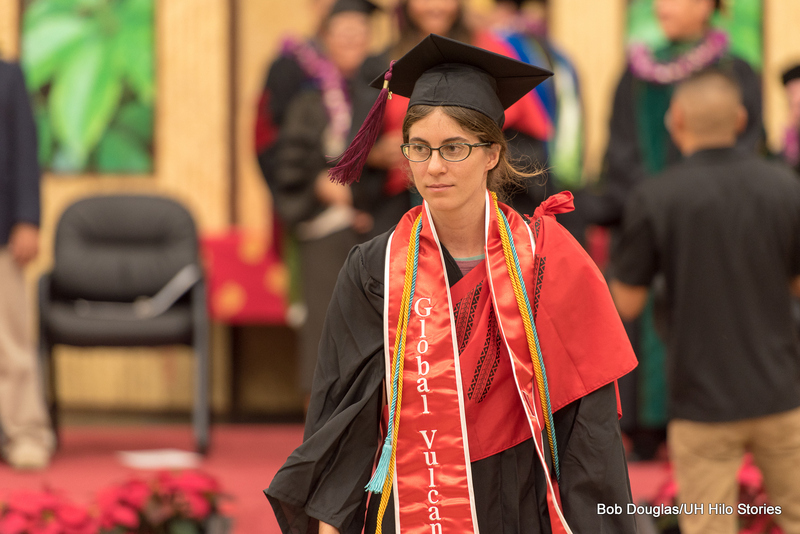 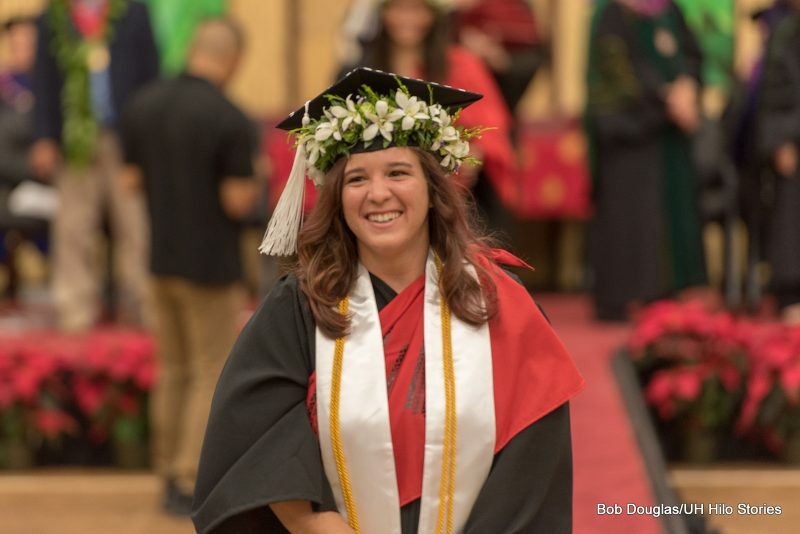 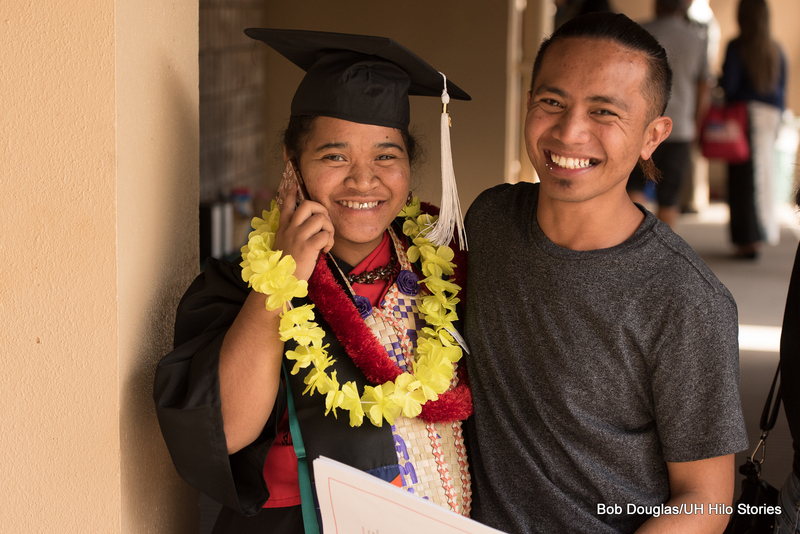 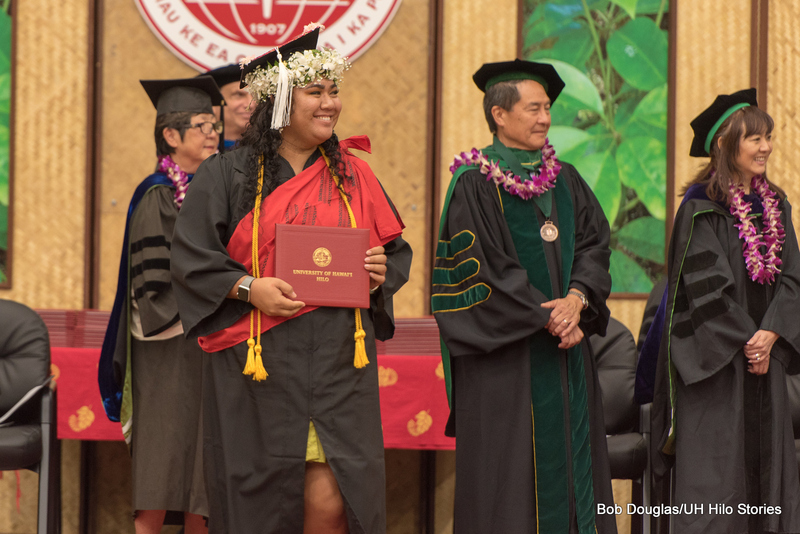 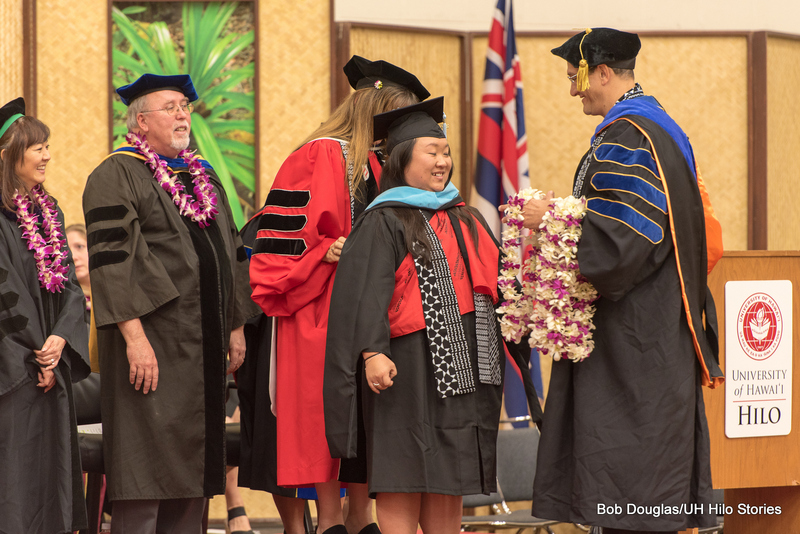 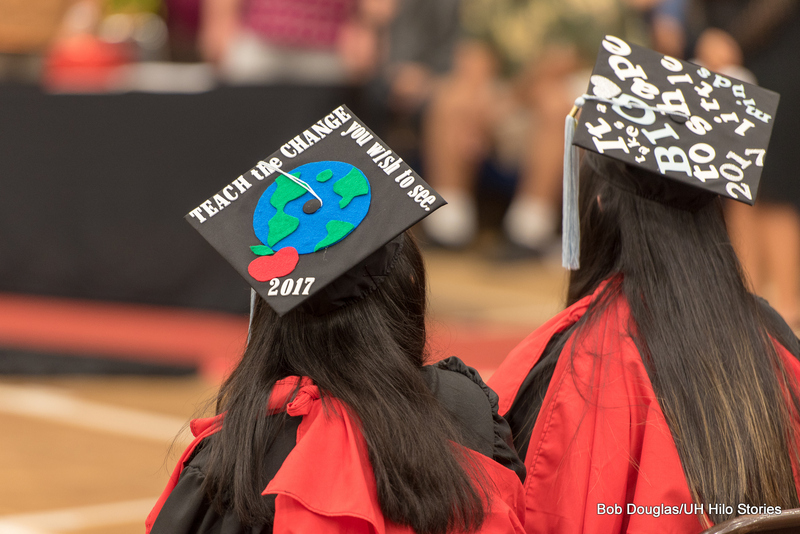 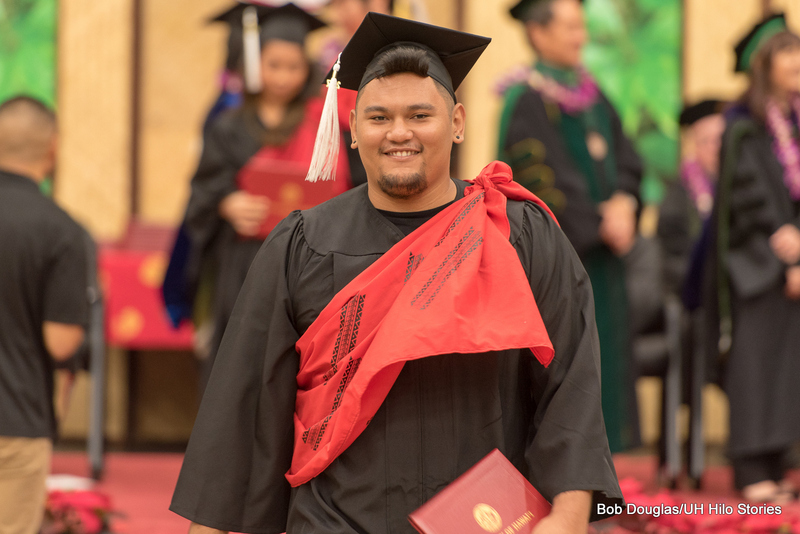 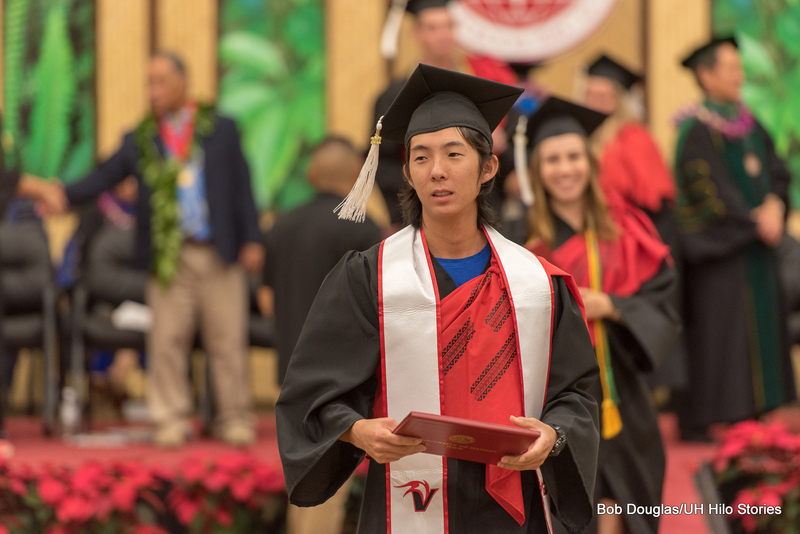 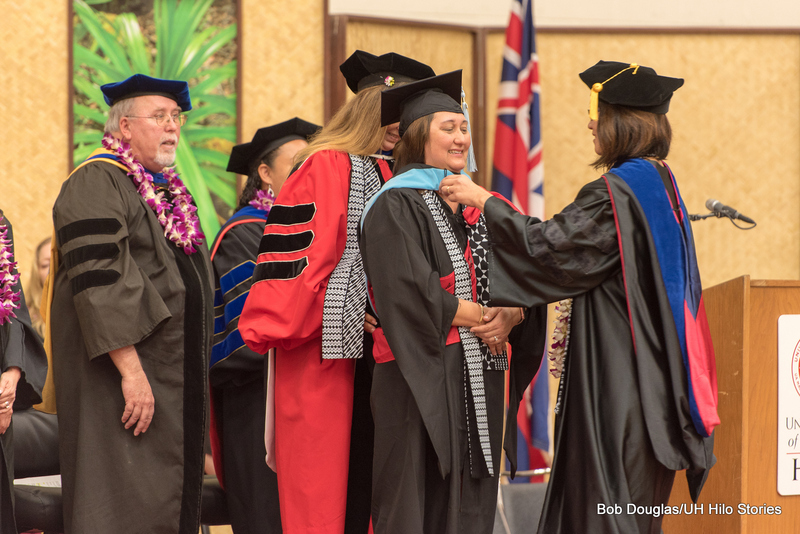 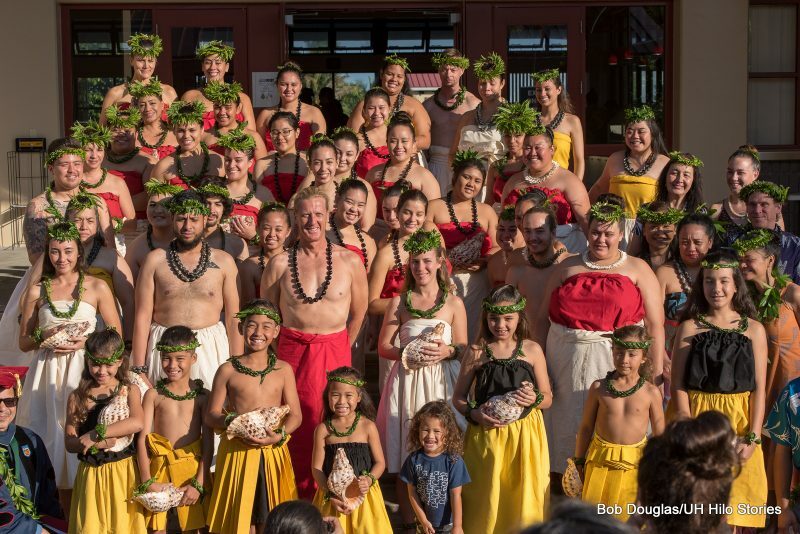 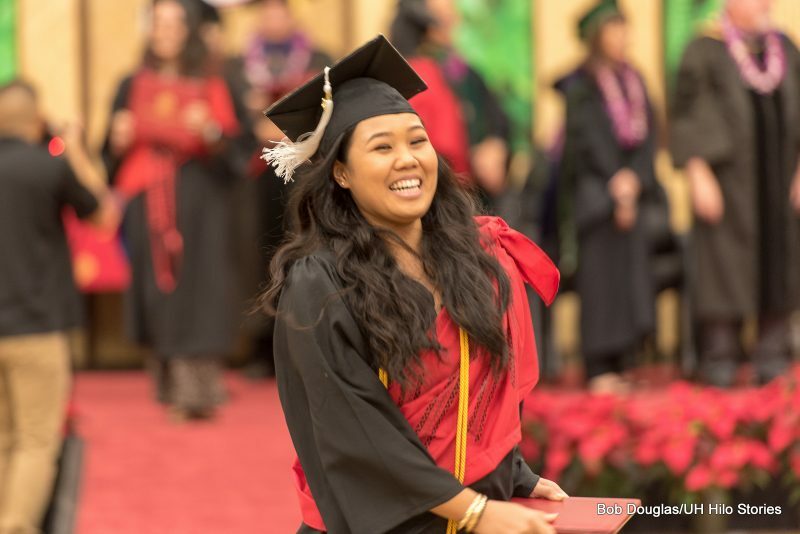 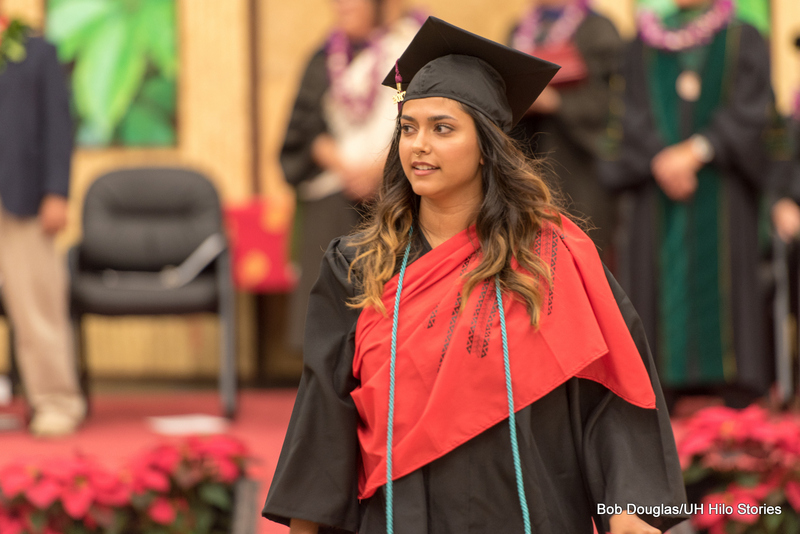 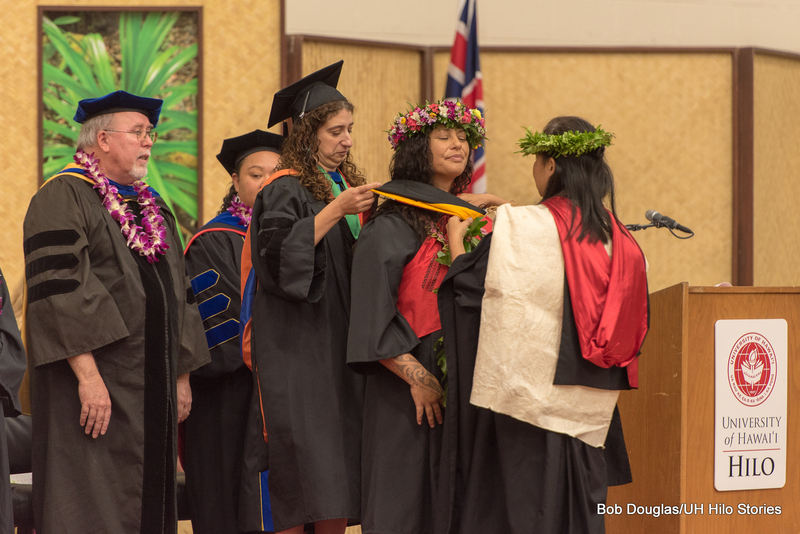 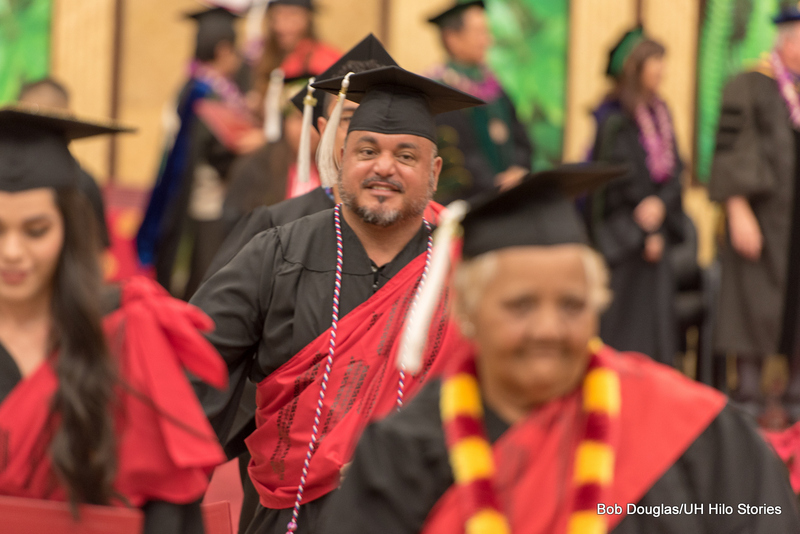 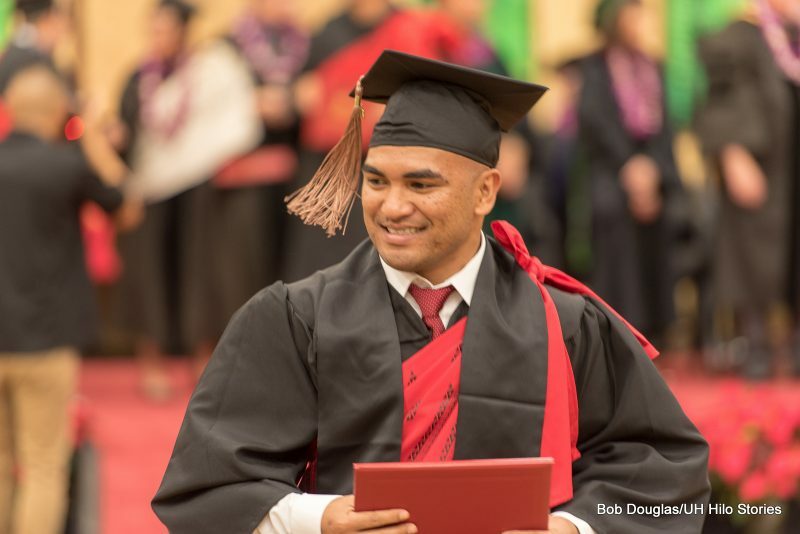 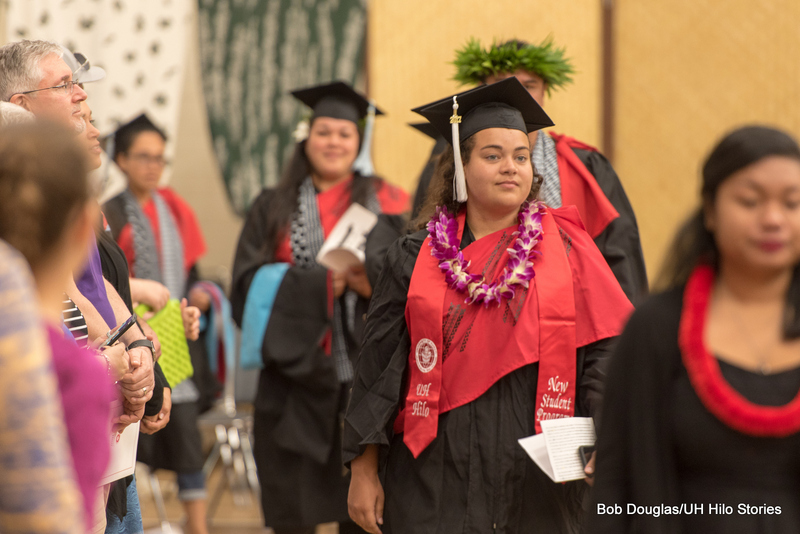 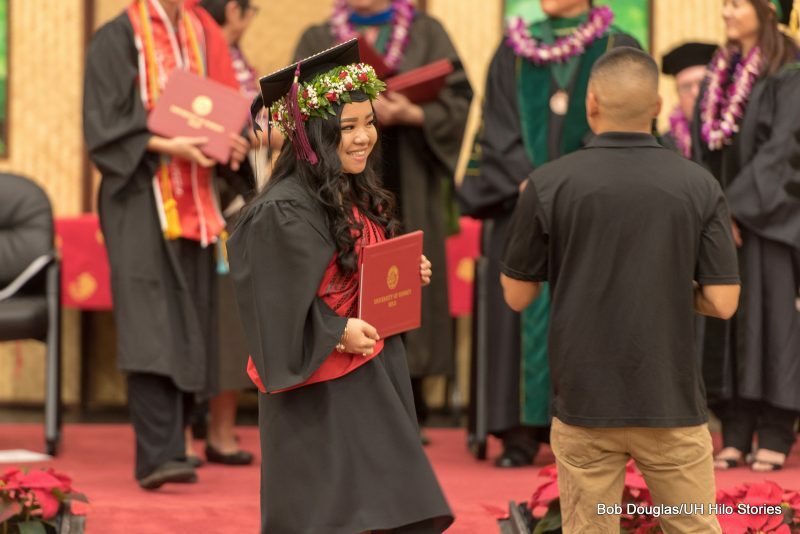 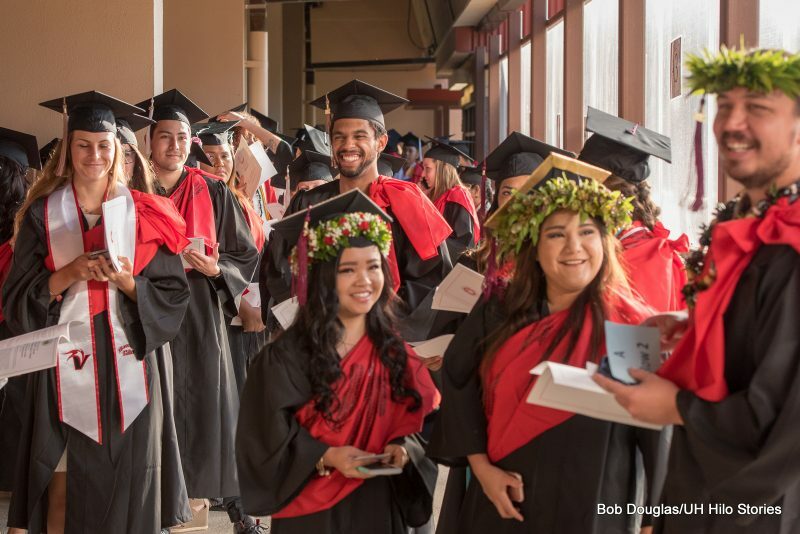 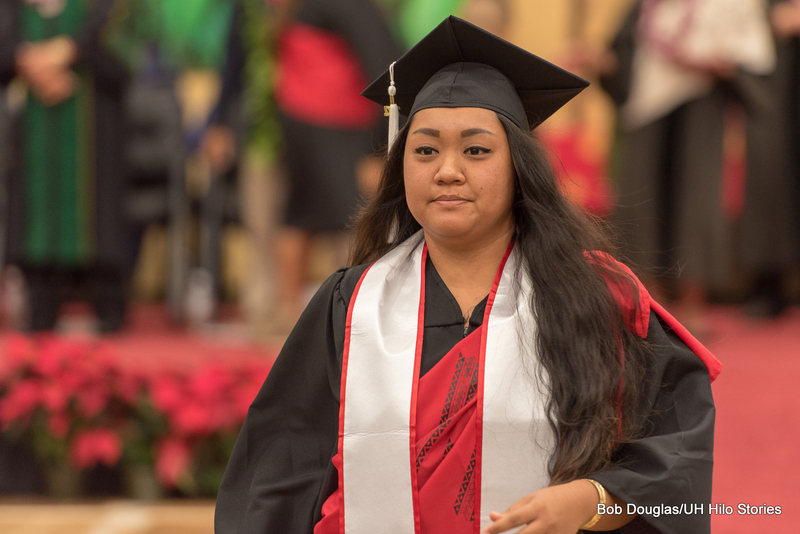 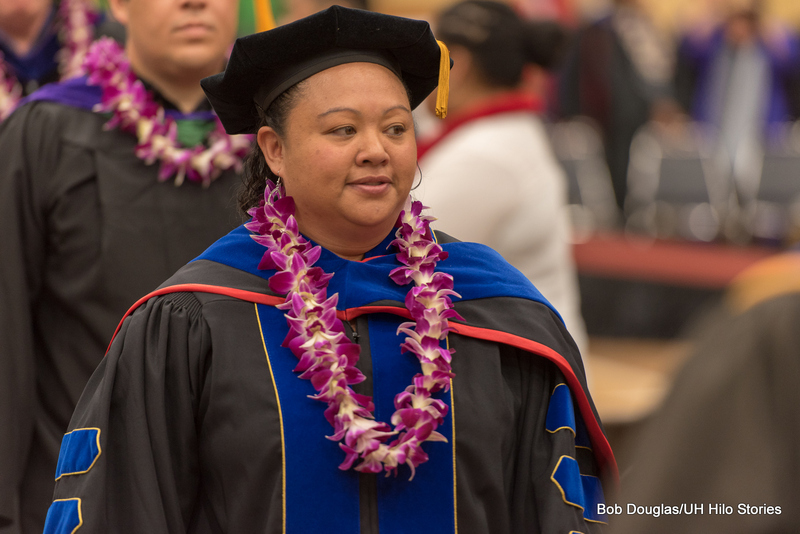 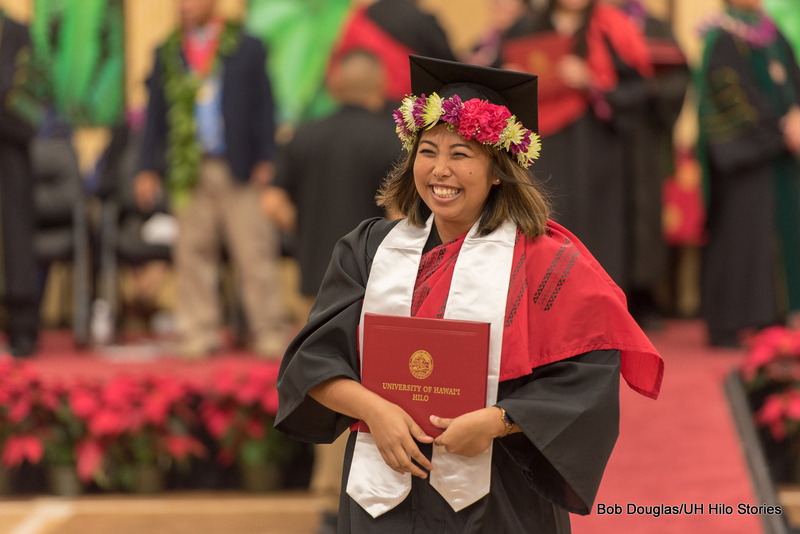 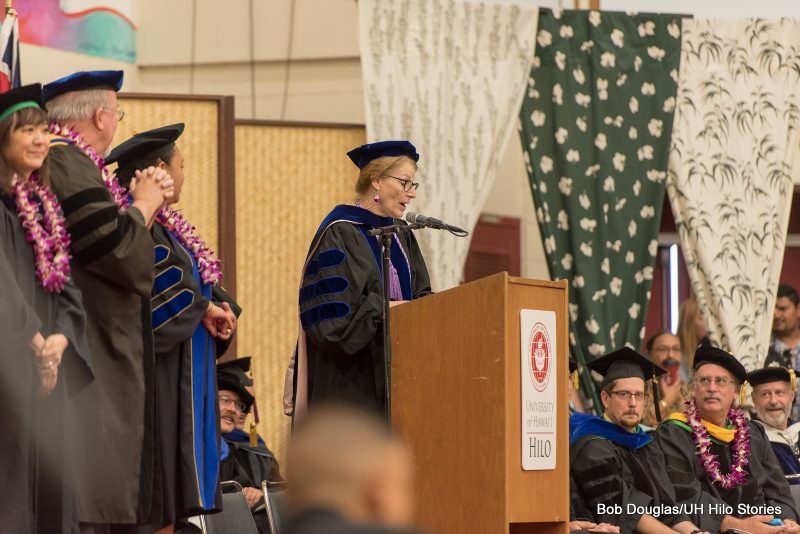 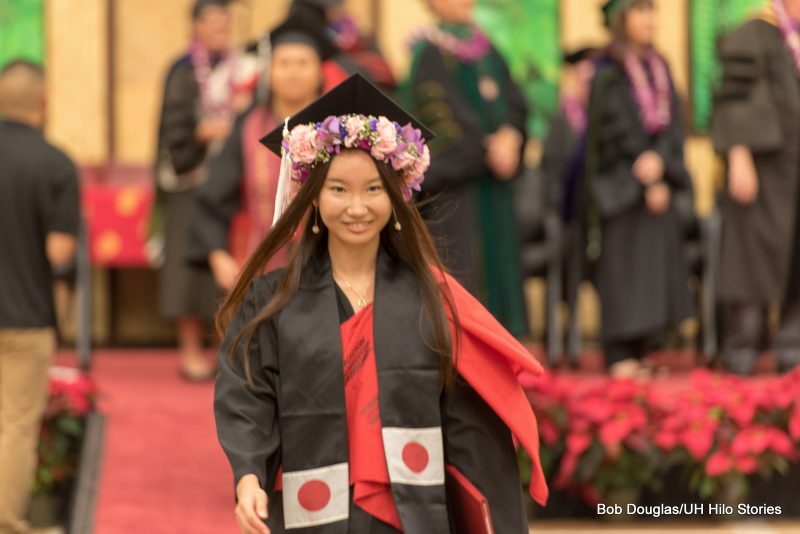 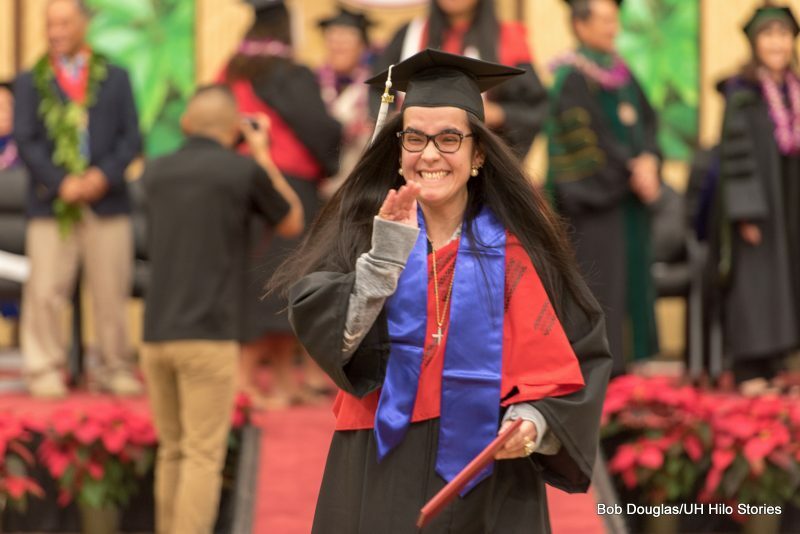 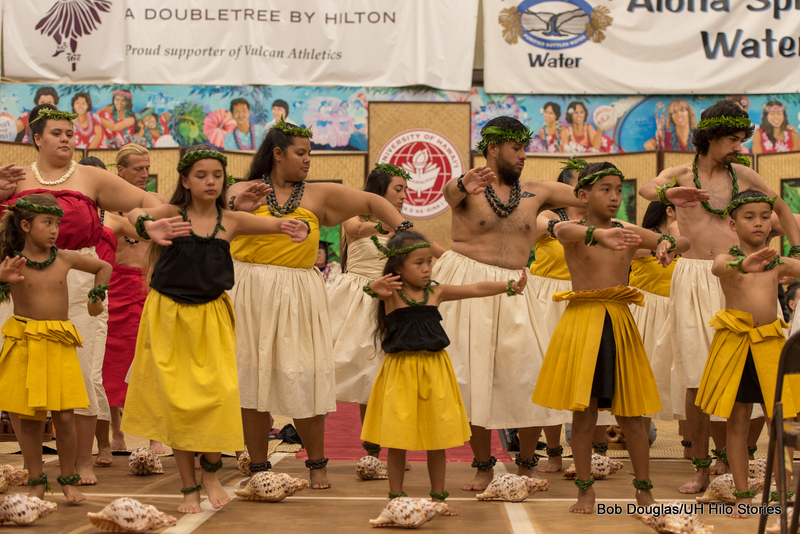 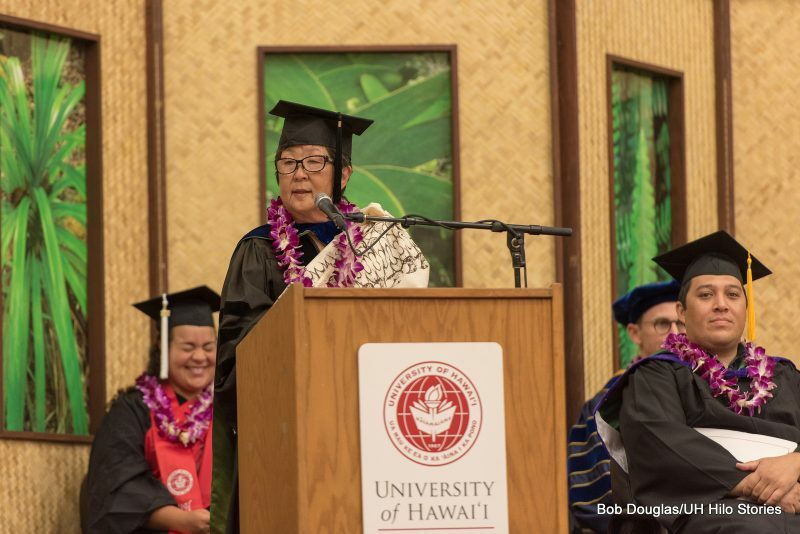 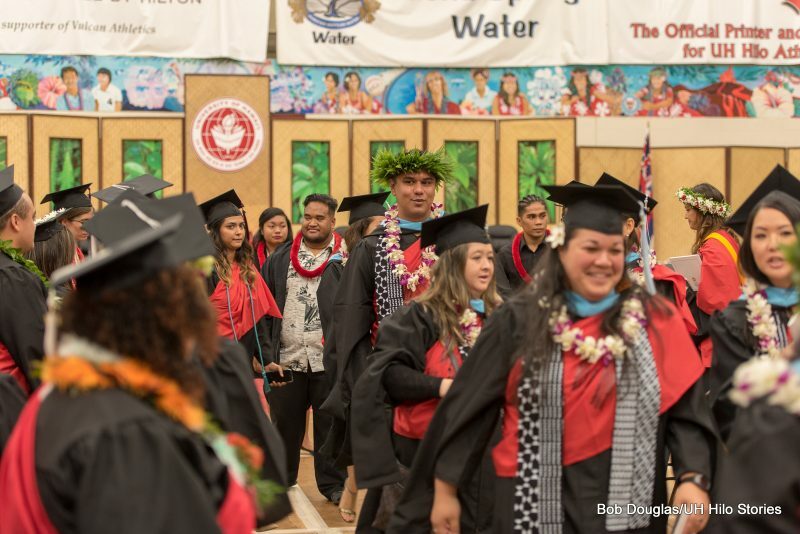 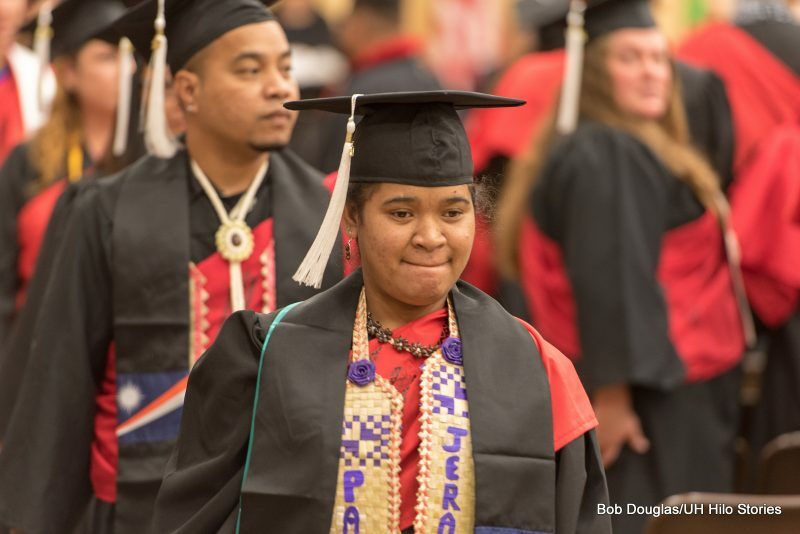 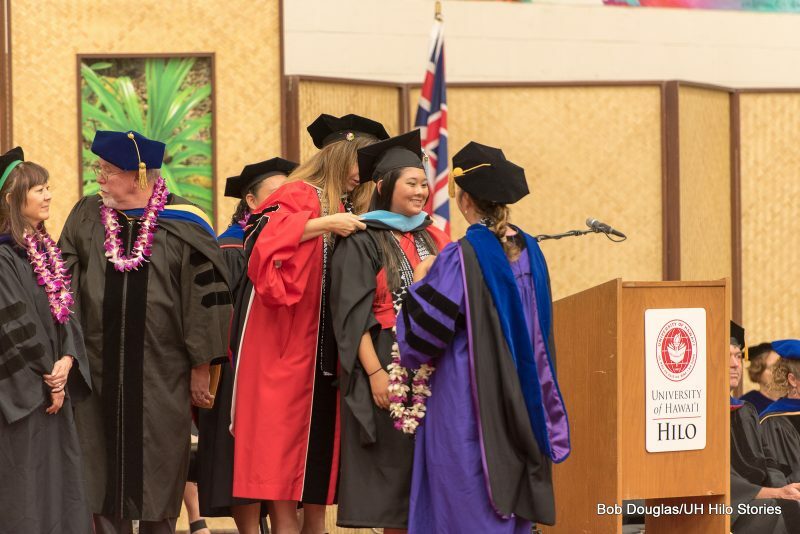 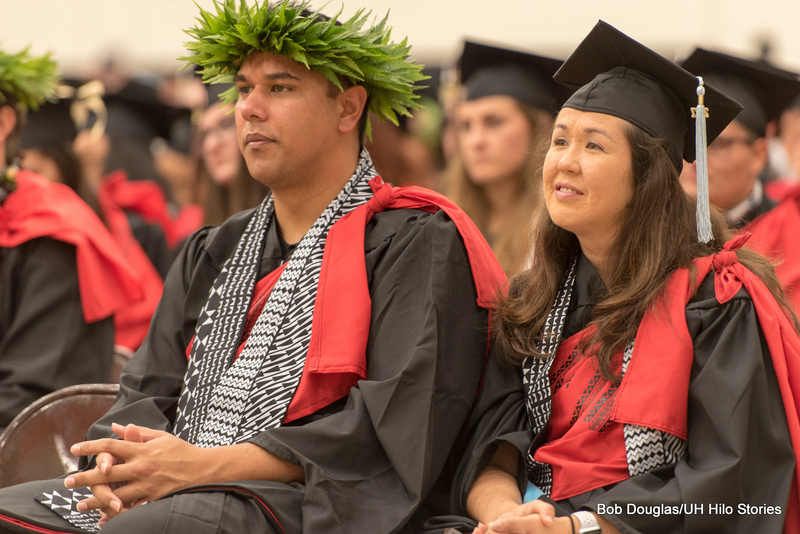 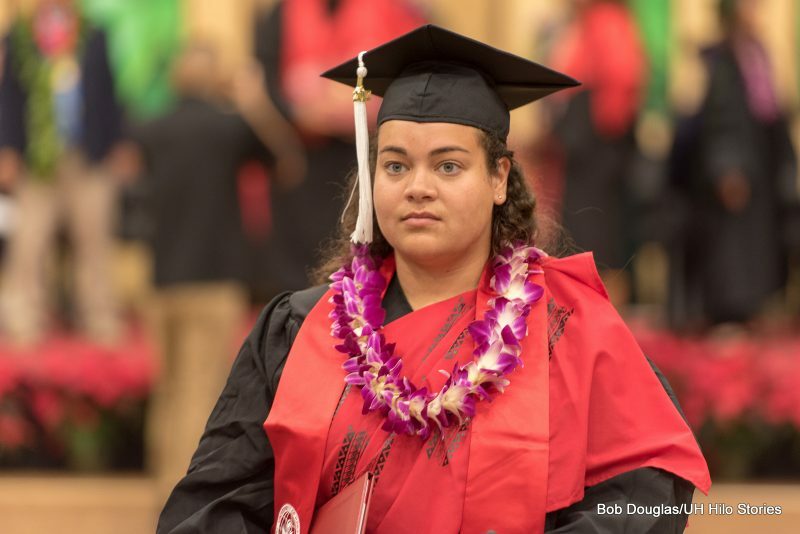 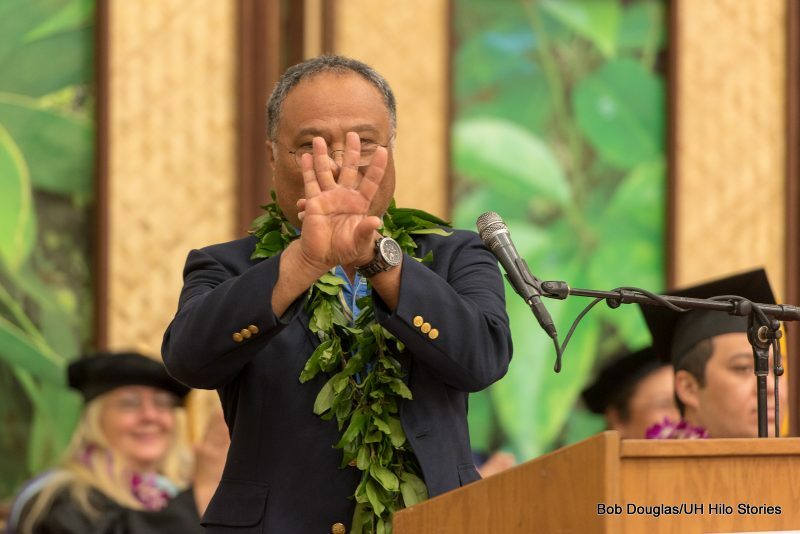 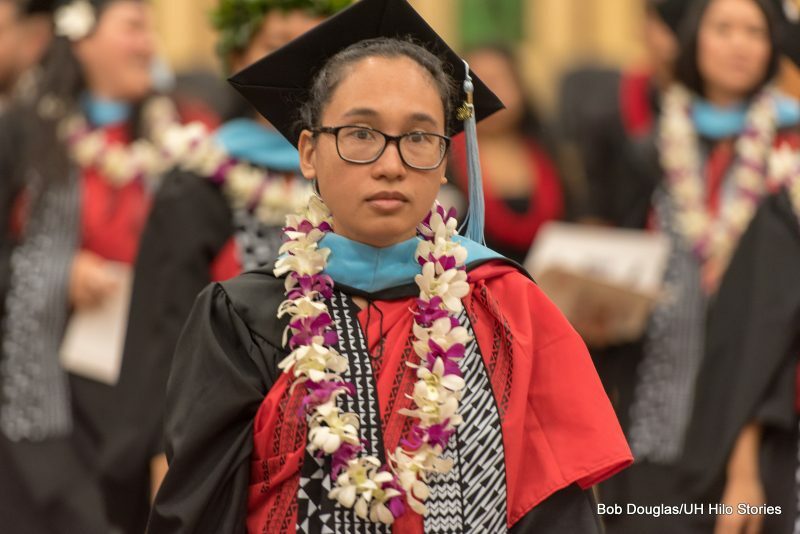 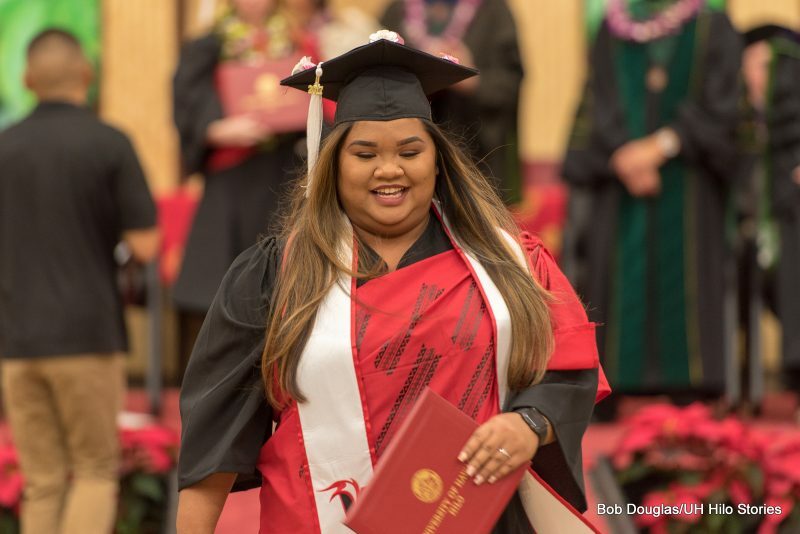 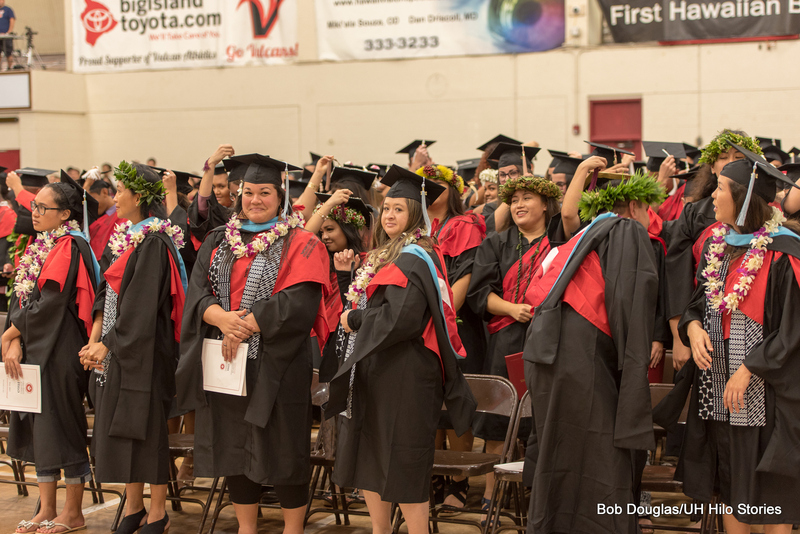 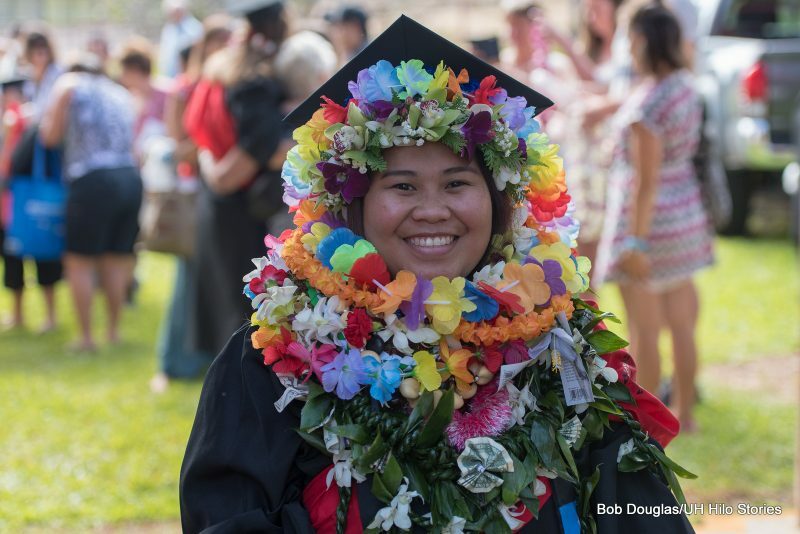 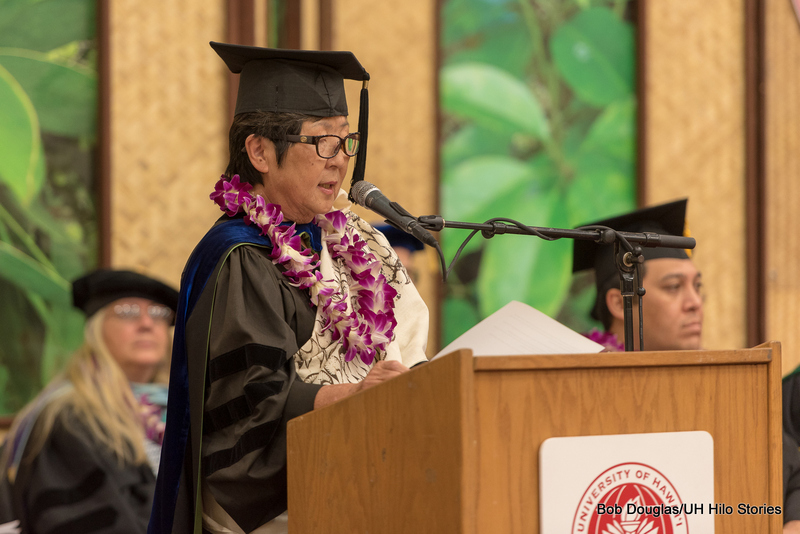 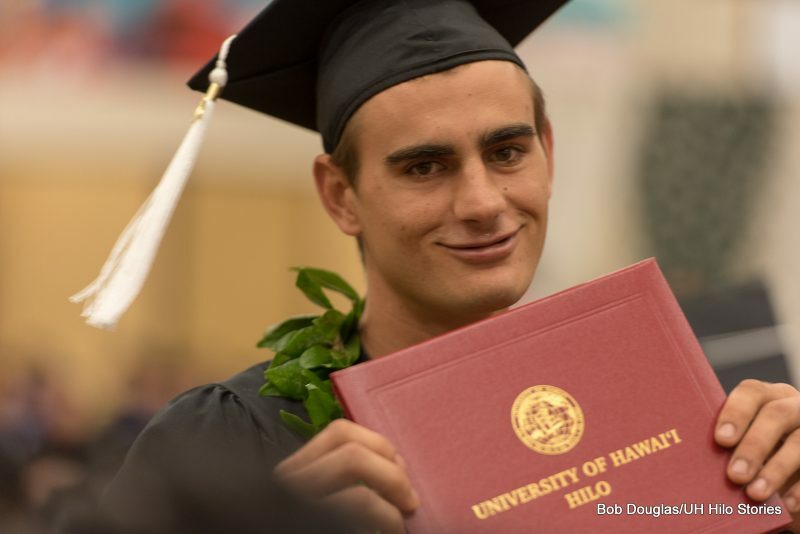 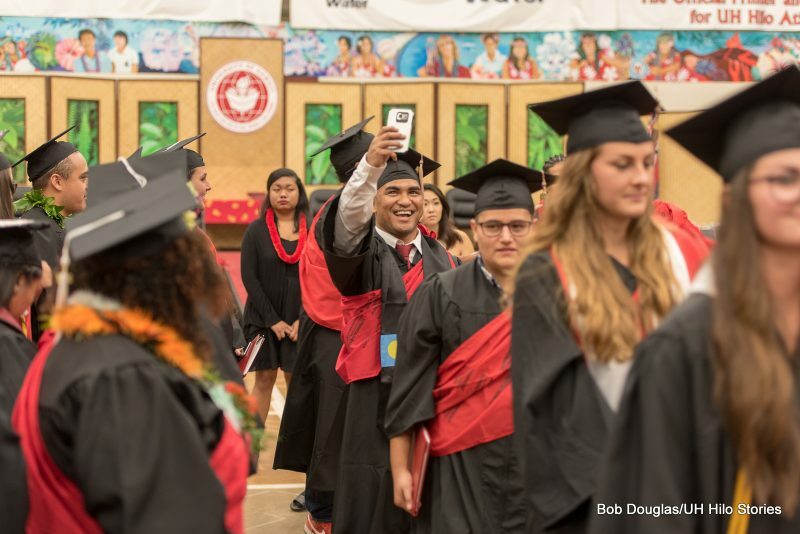 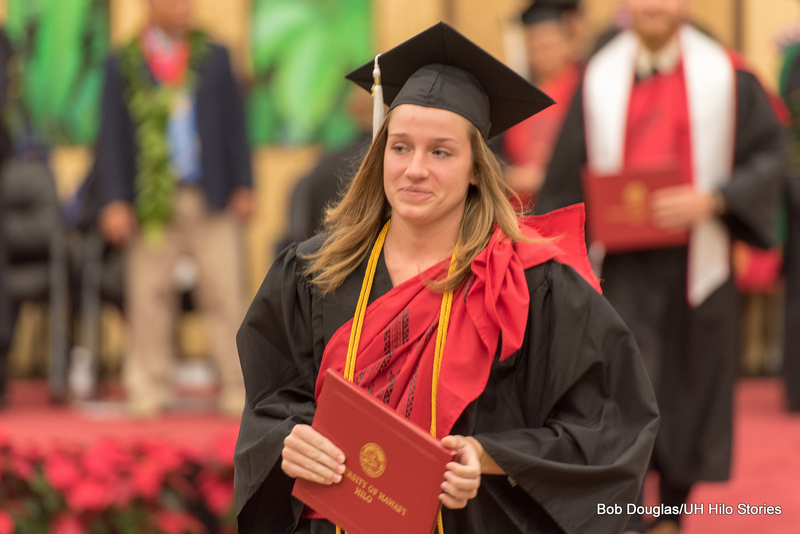 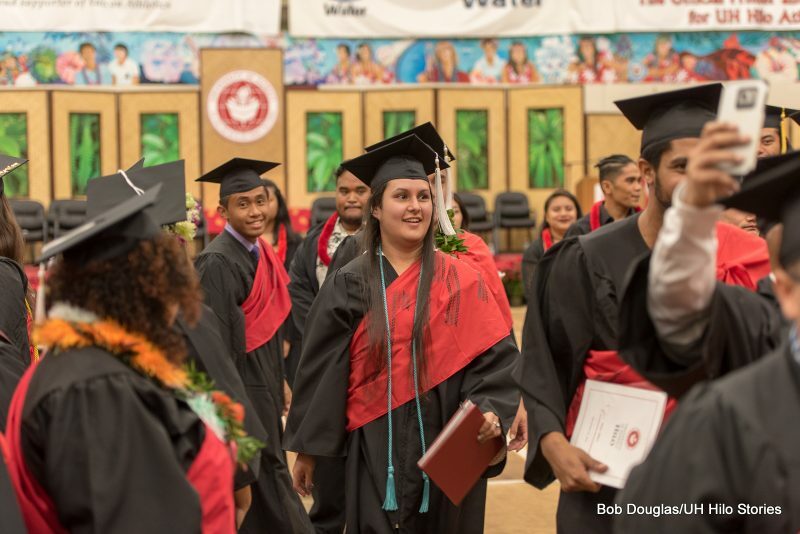 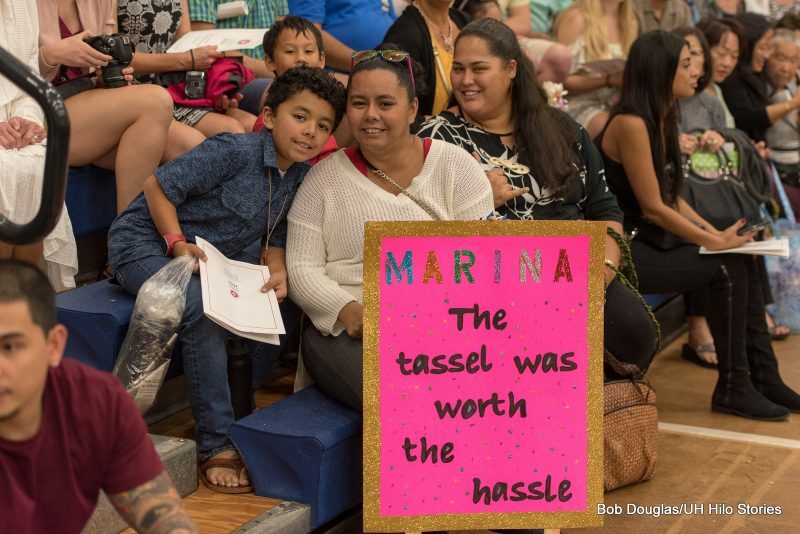 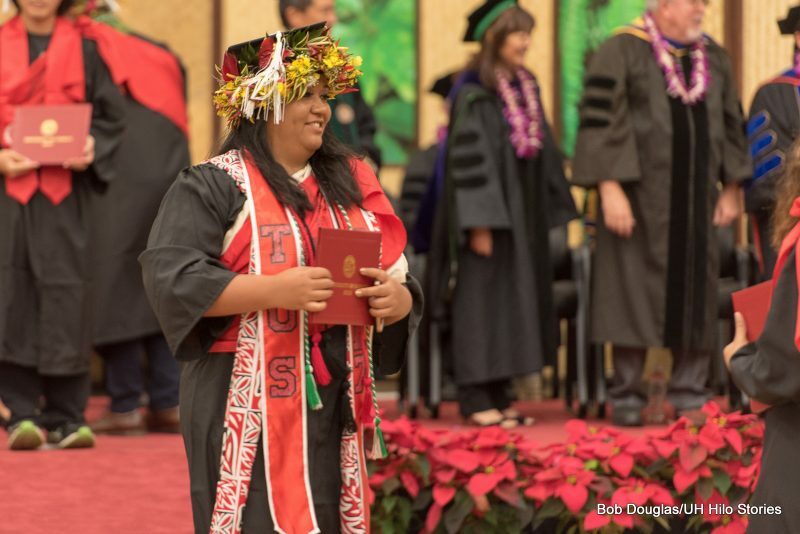 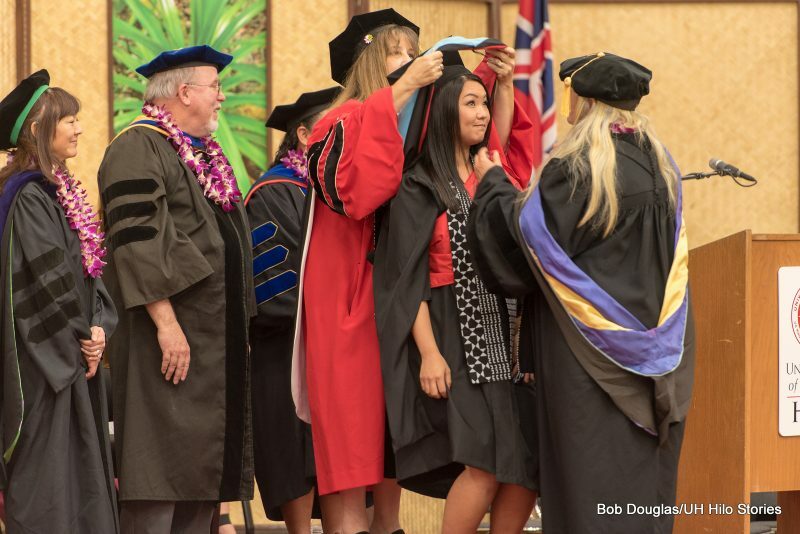 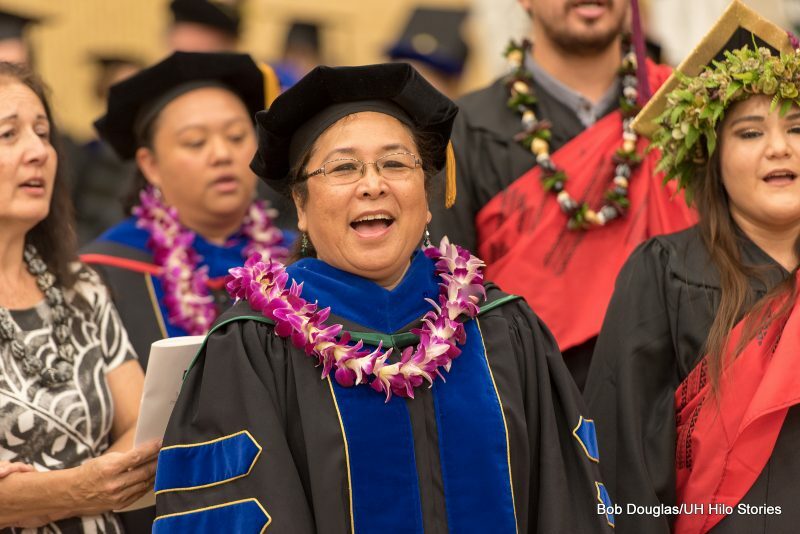 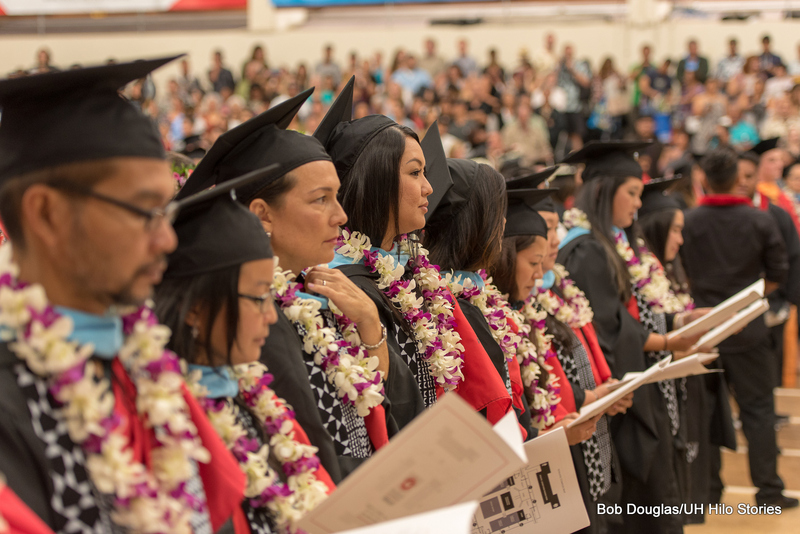 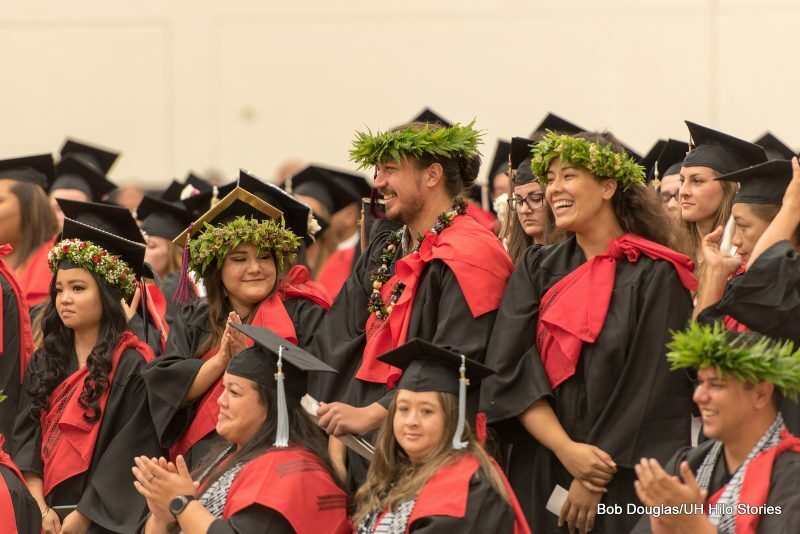 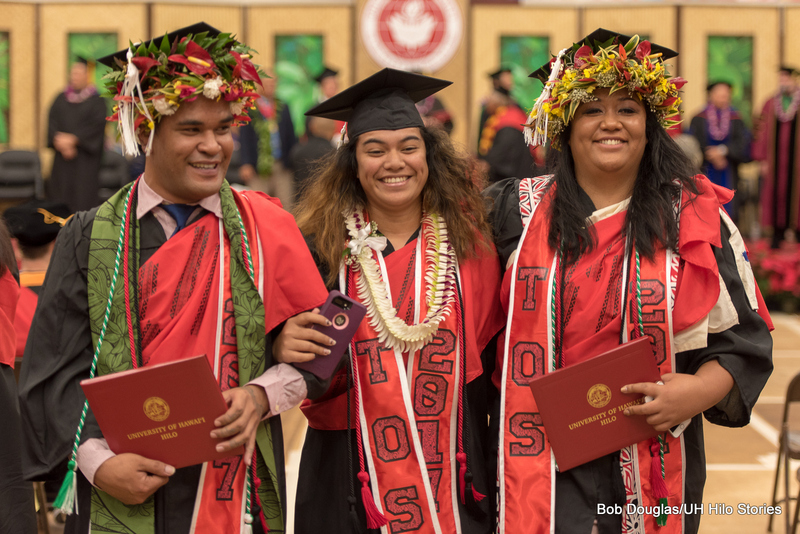 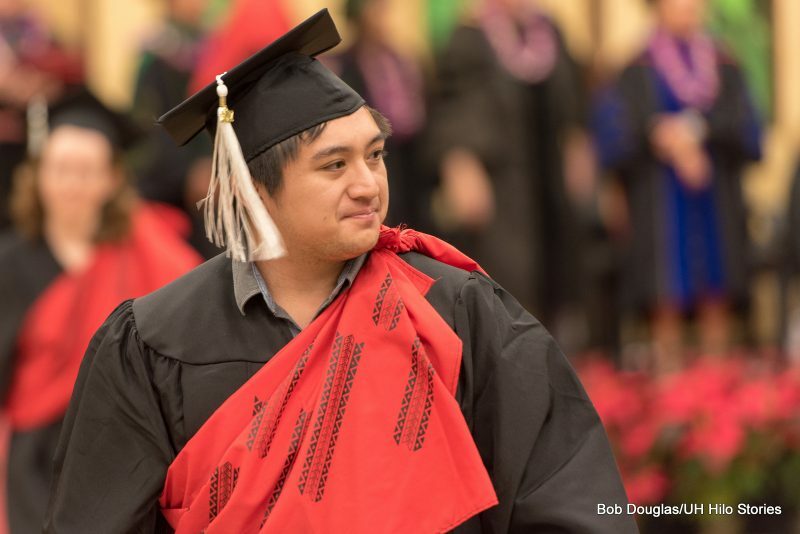 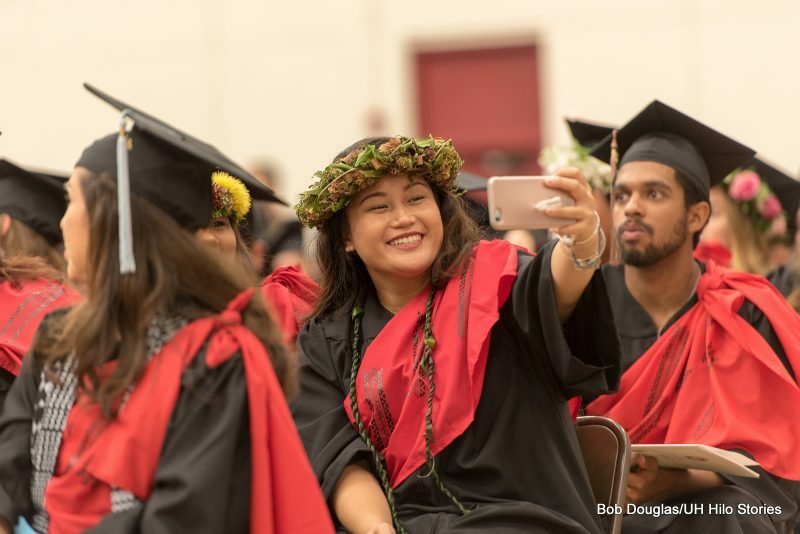 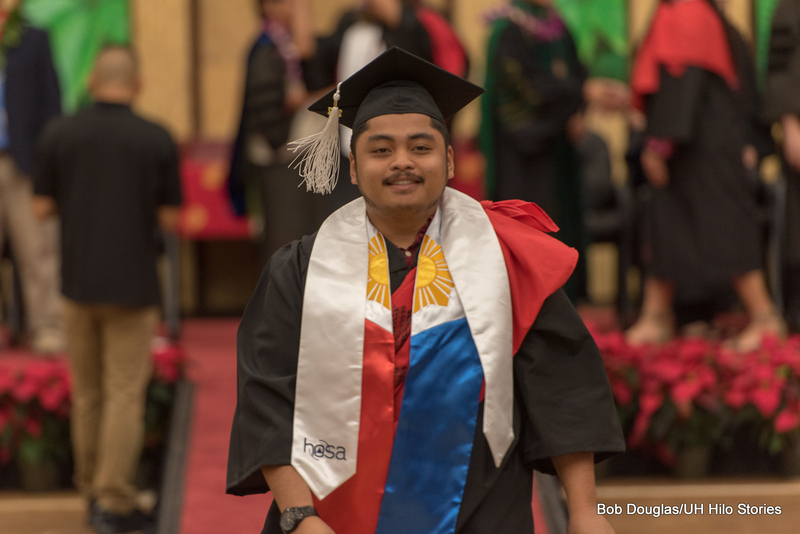 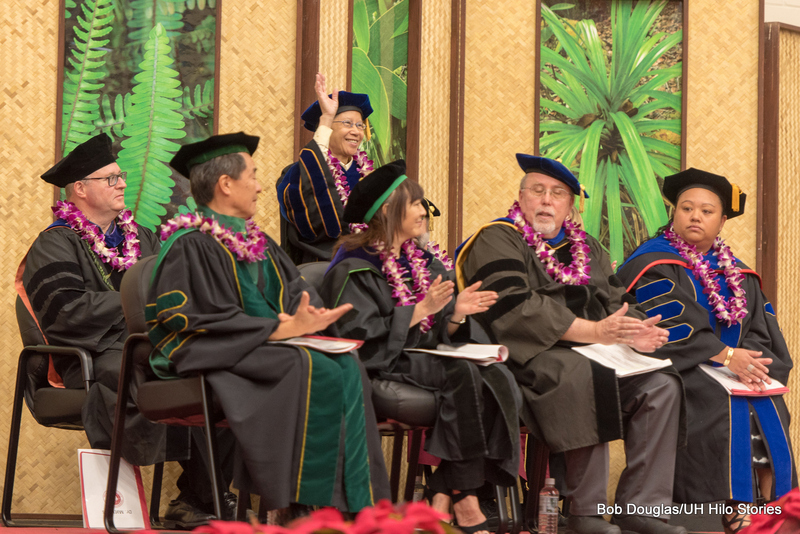 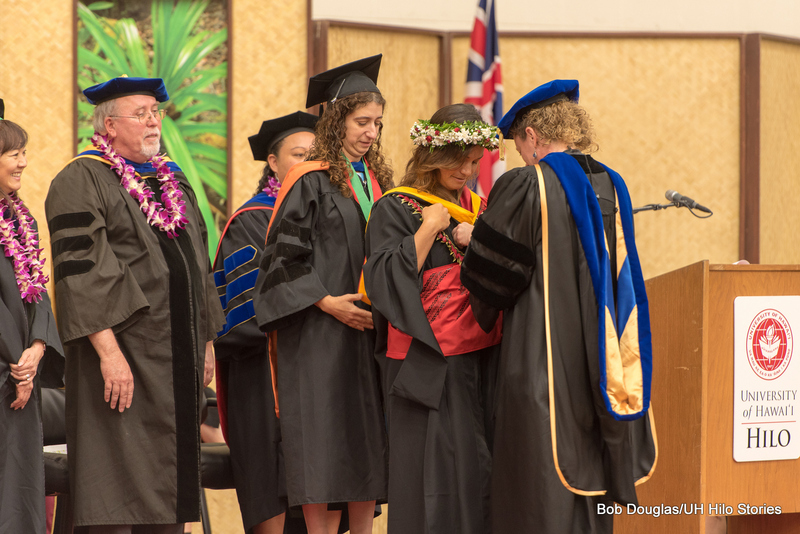 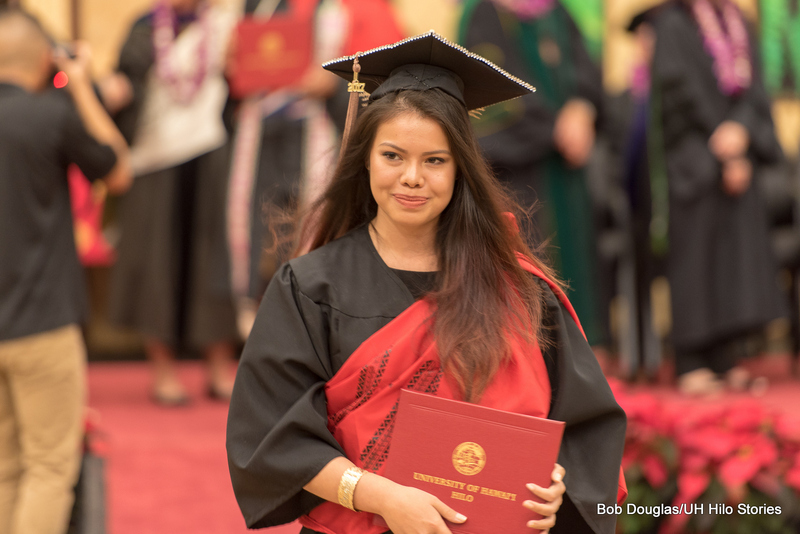 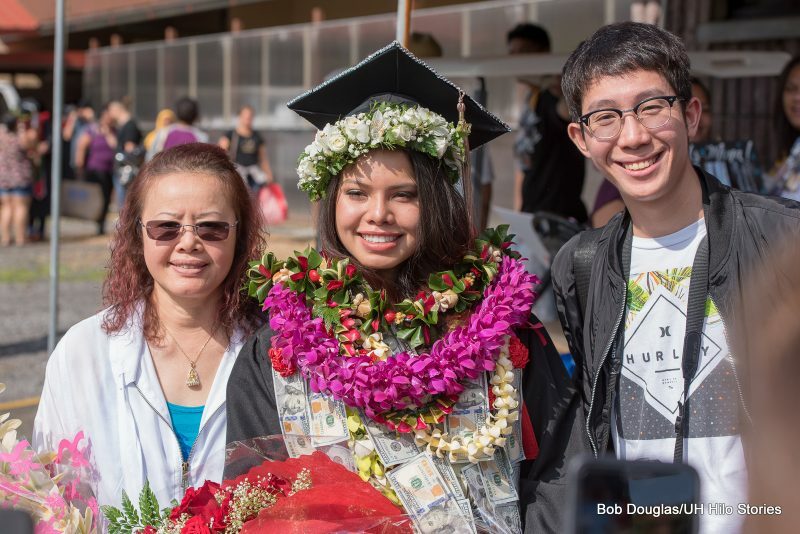 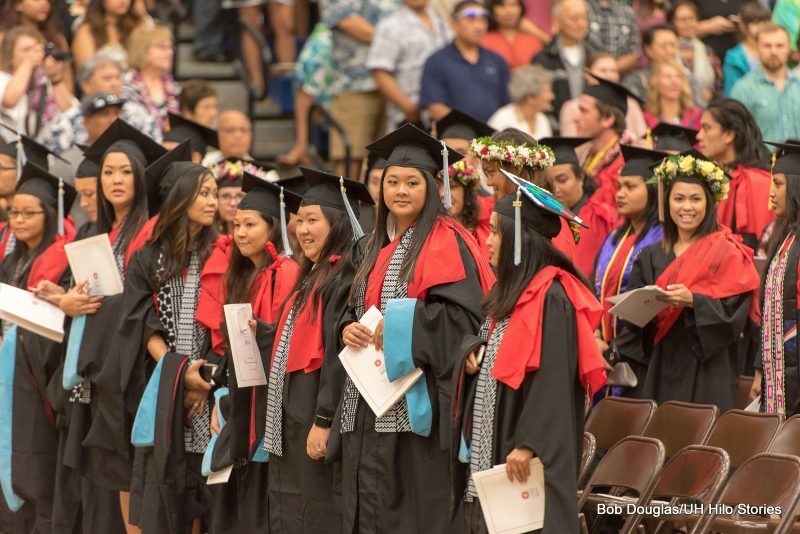 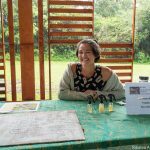 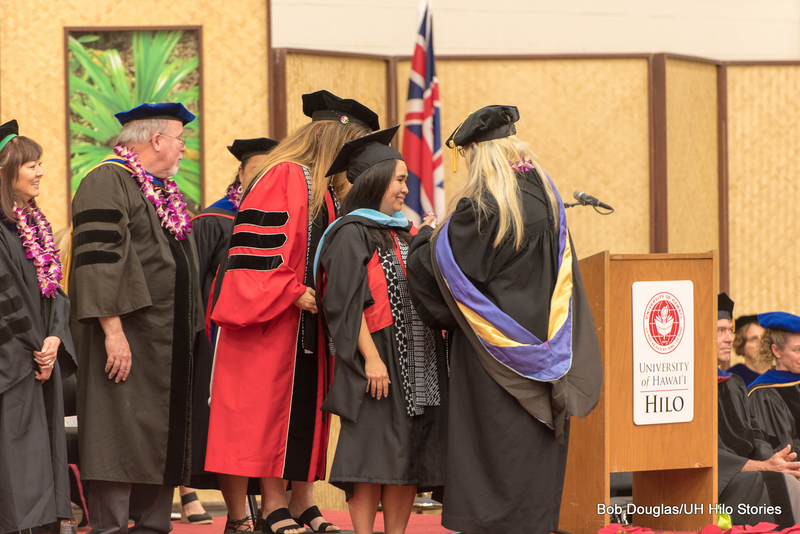 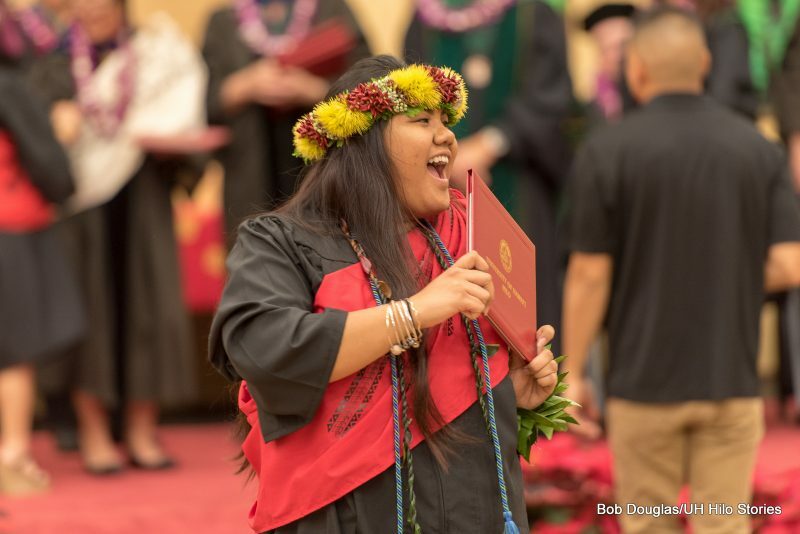 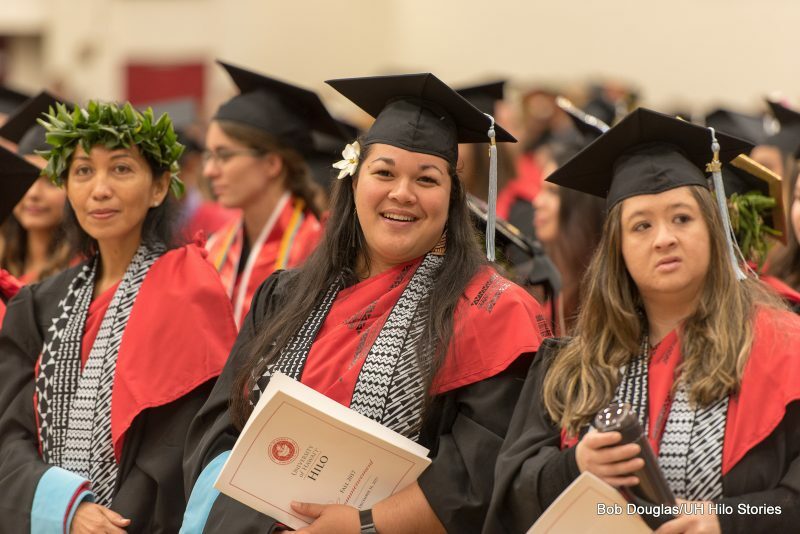 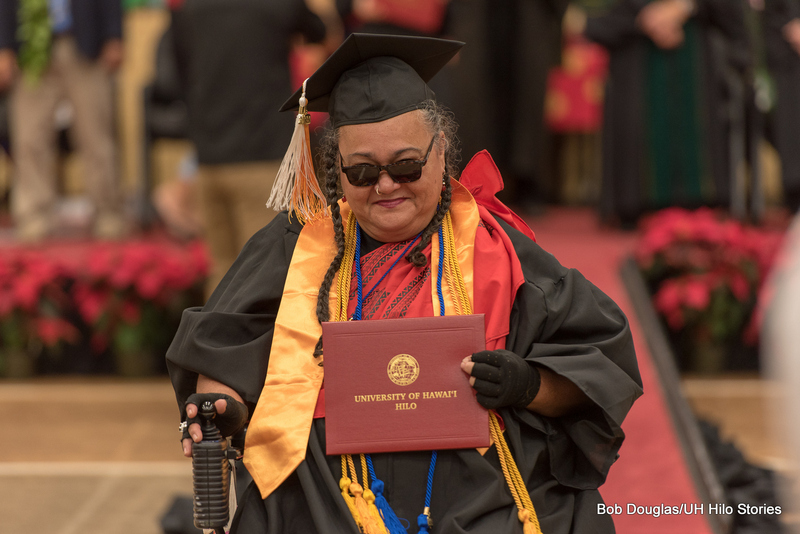 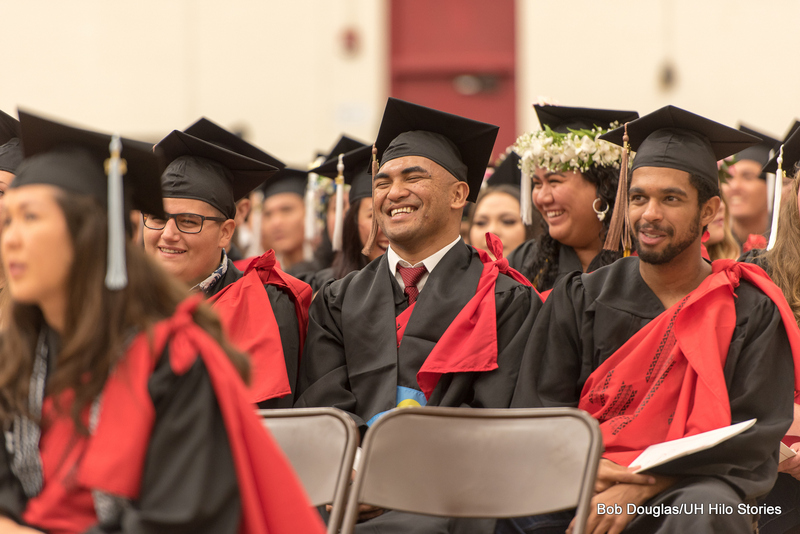 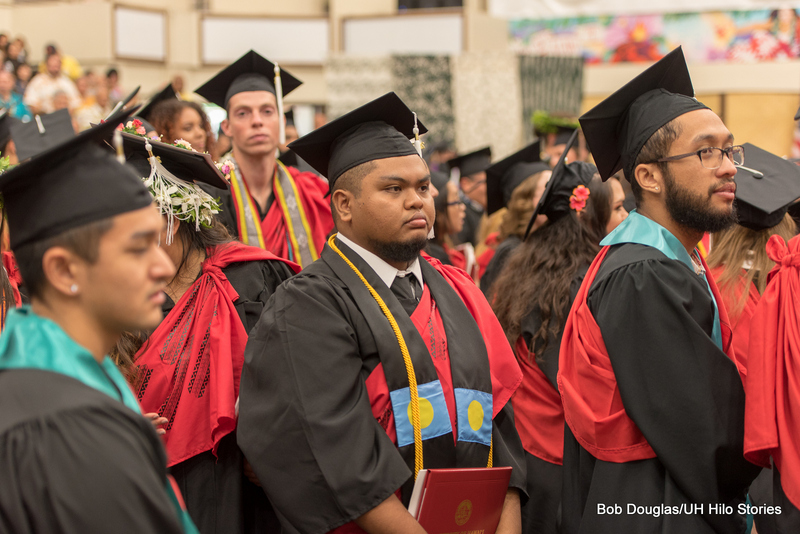 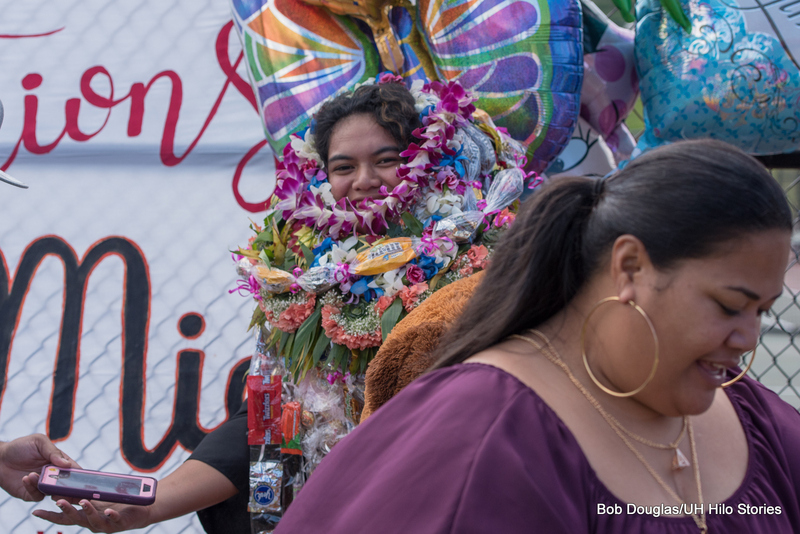 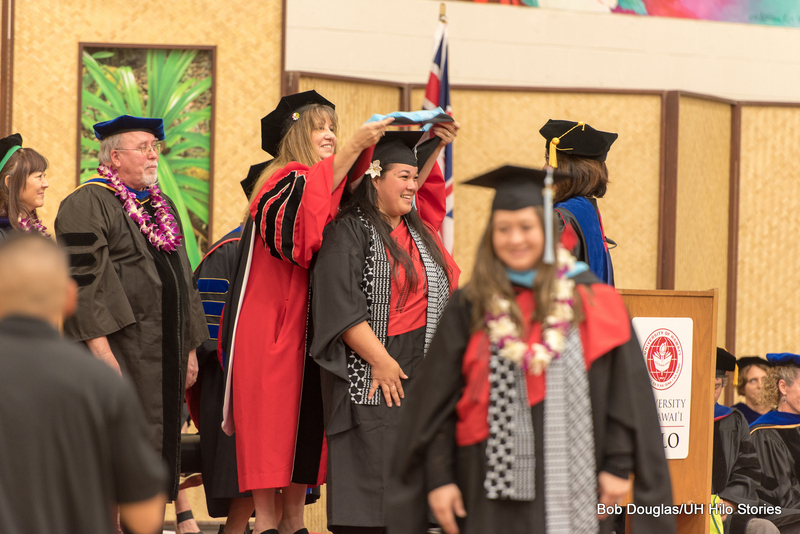 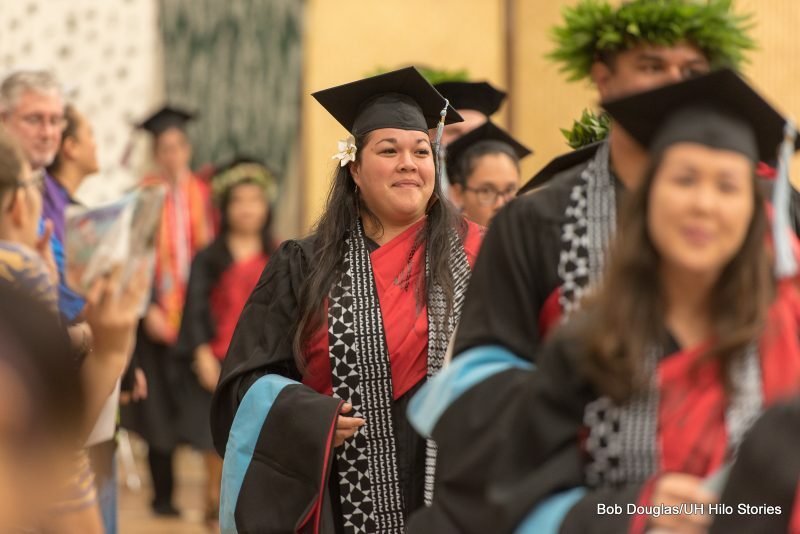 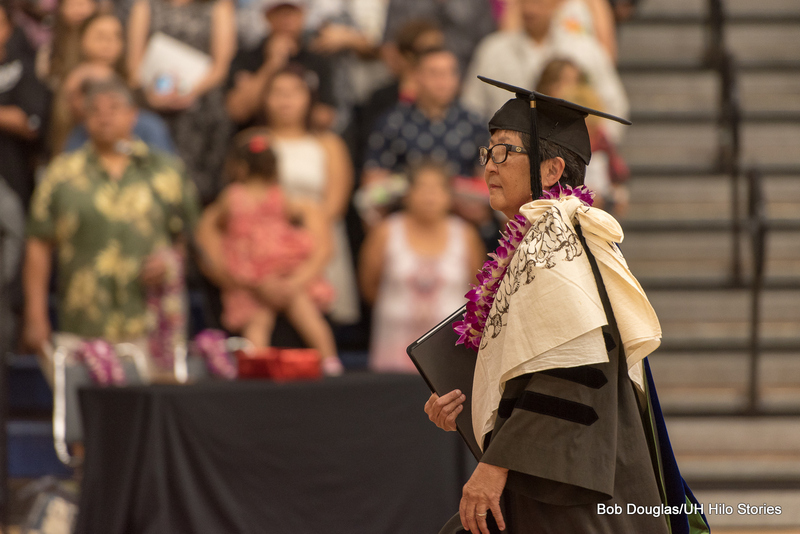 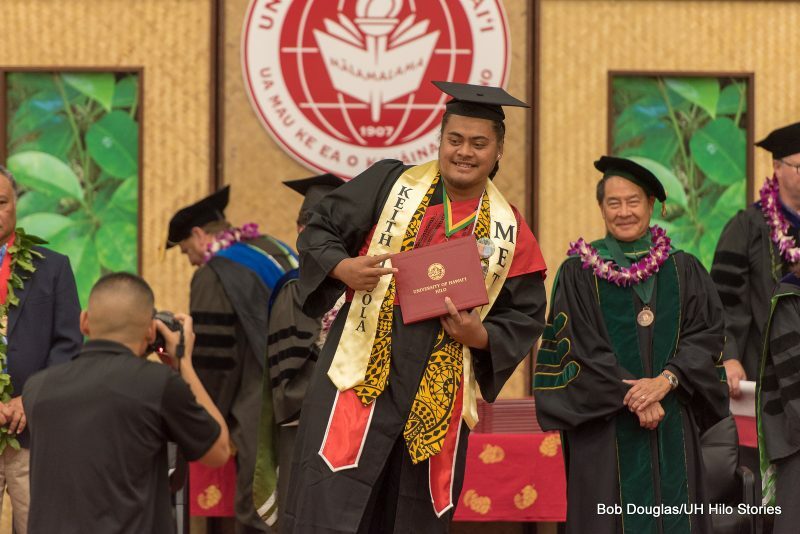 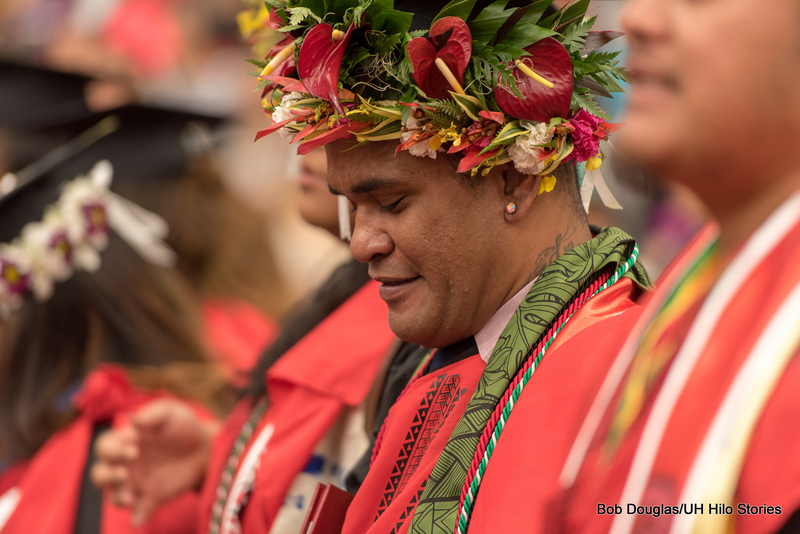 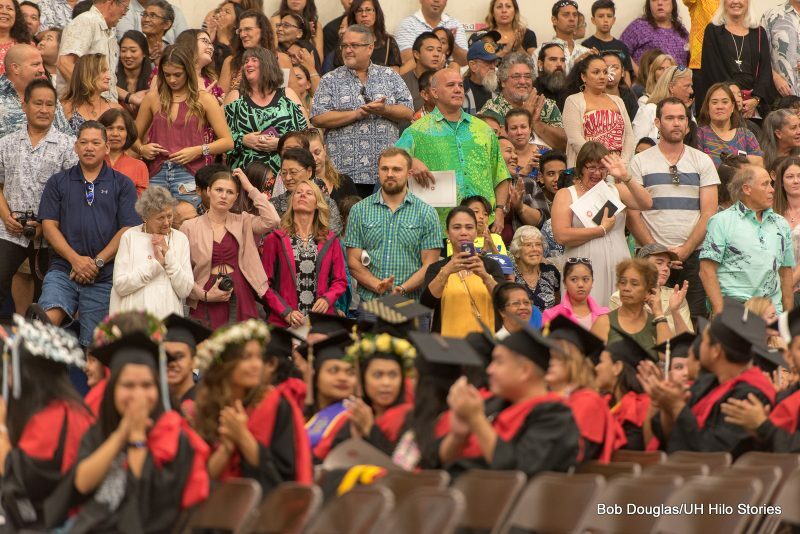 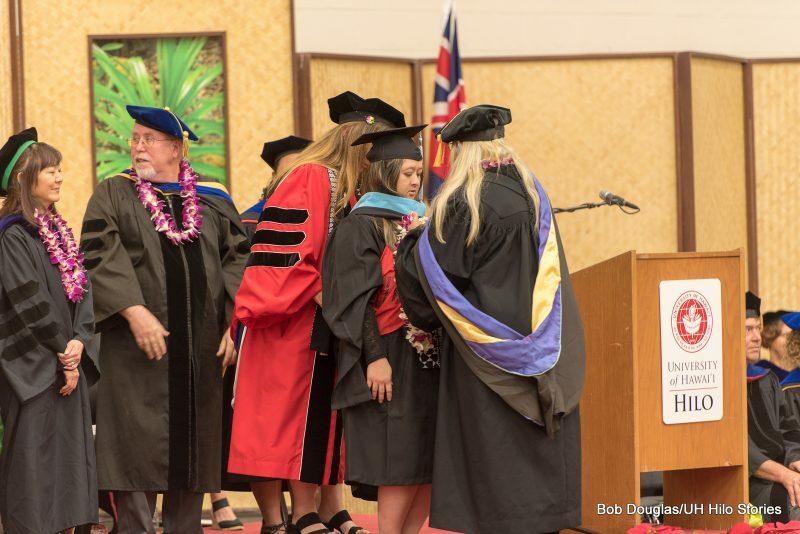 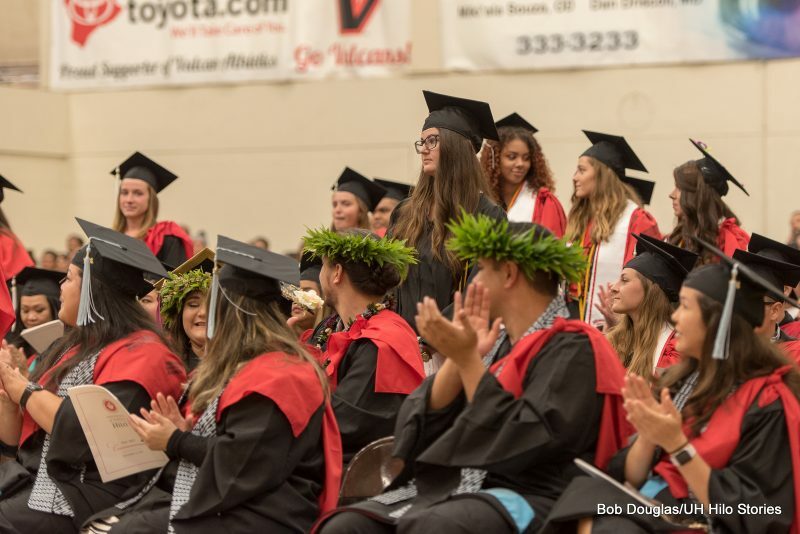 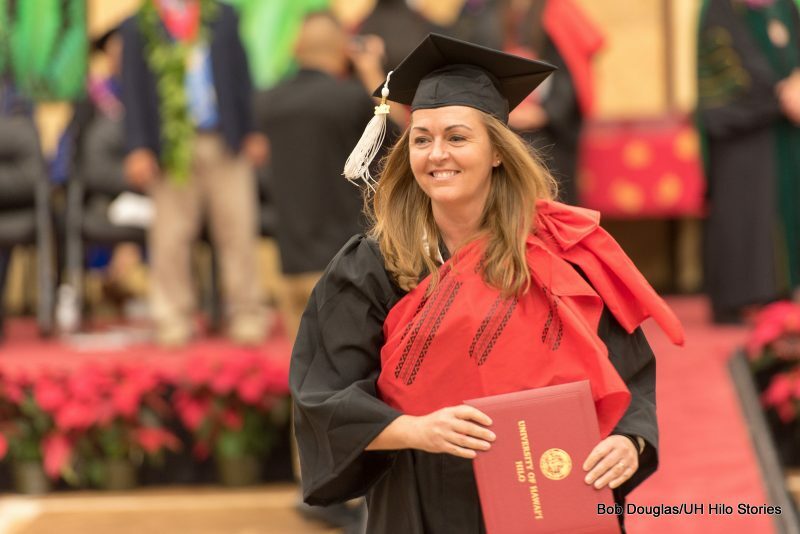 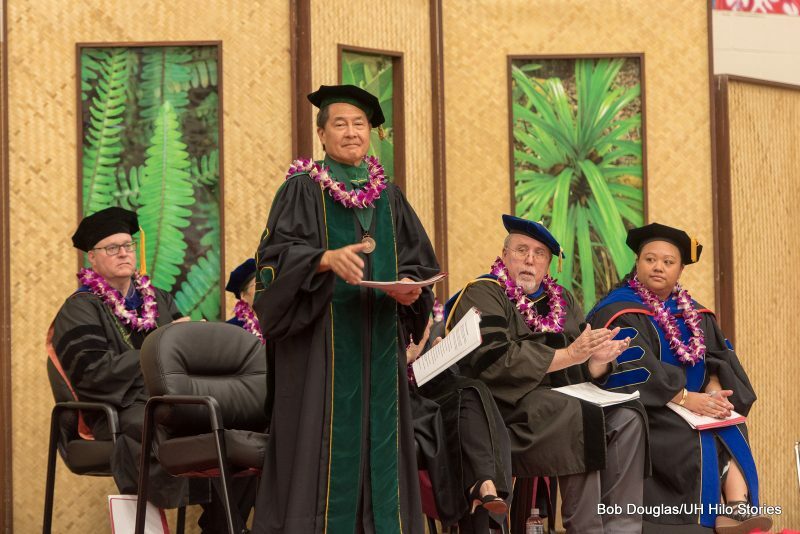 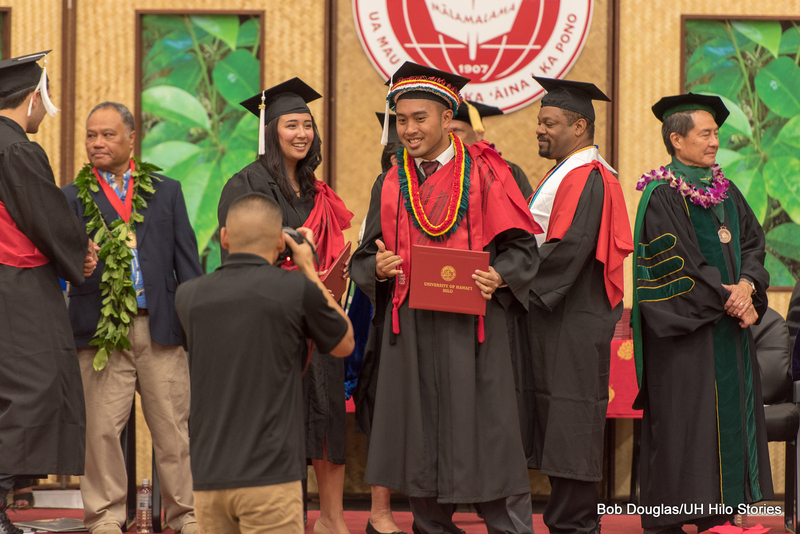 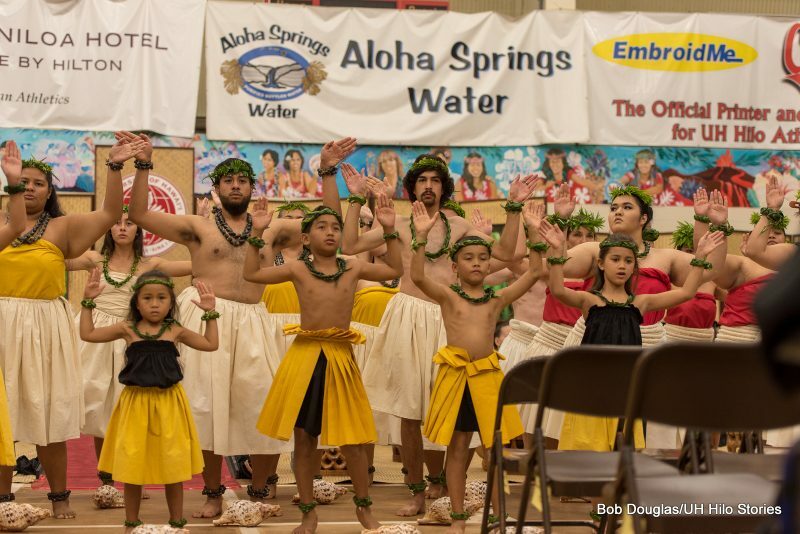 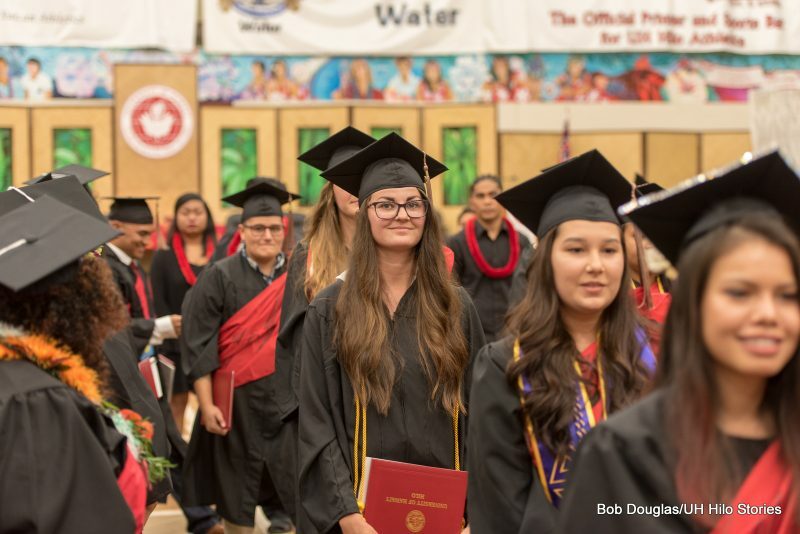 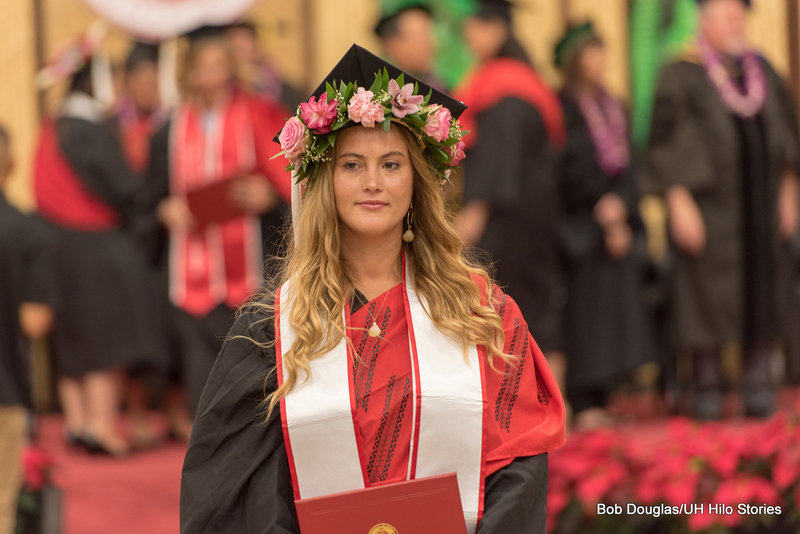 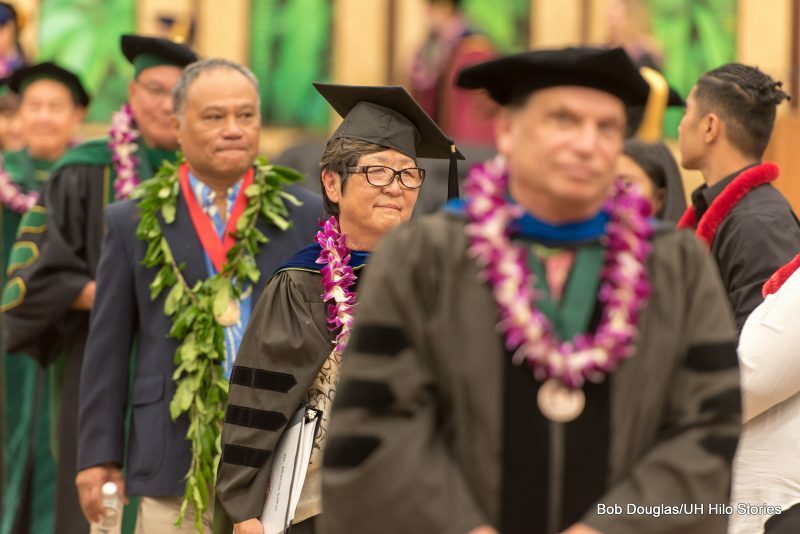 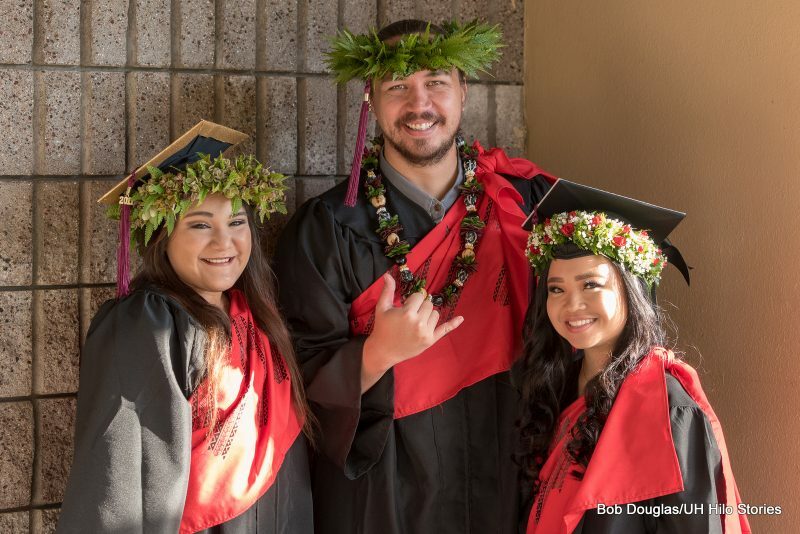 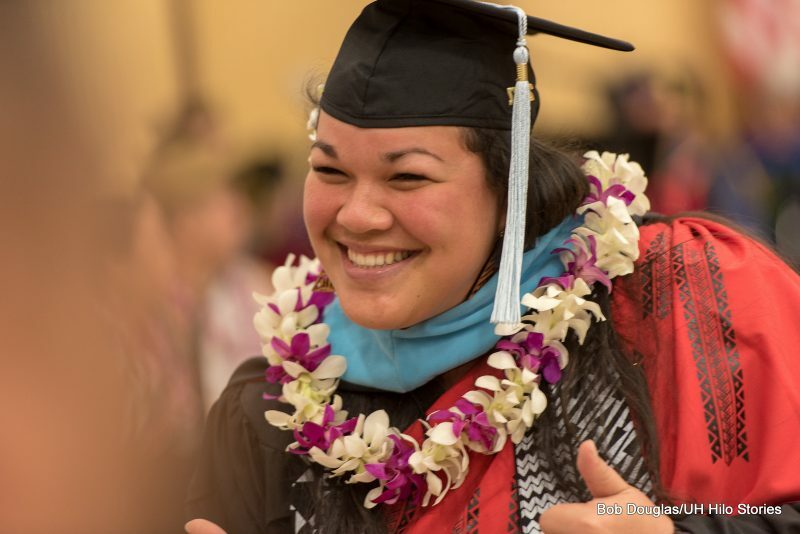 University of Hawai‘i at Hilo held its 2017 Fall Commencement on Dec. 16. 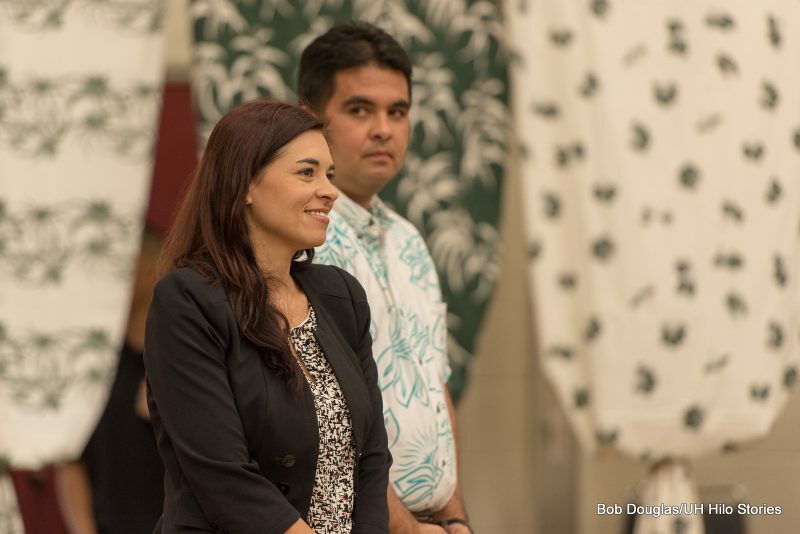 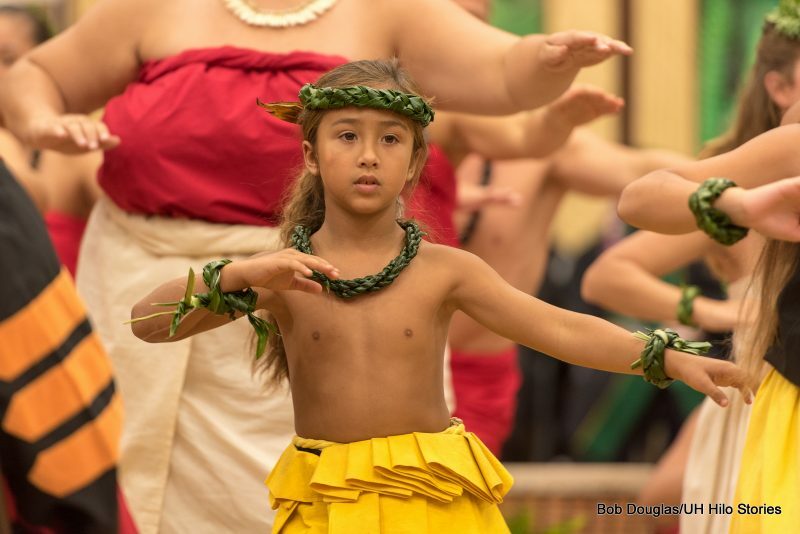 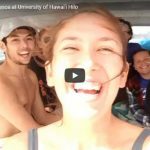 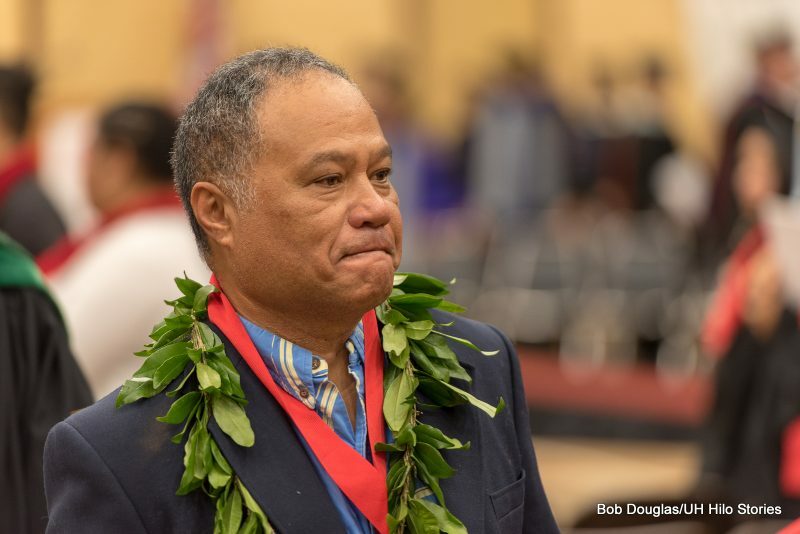 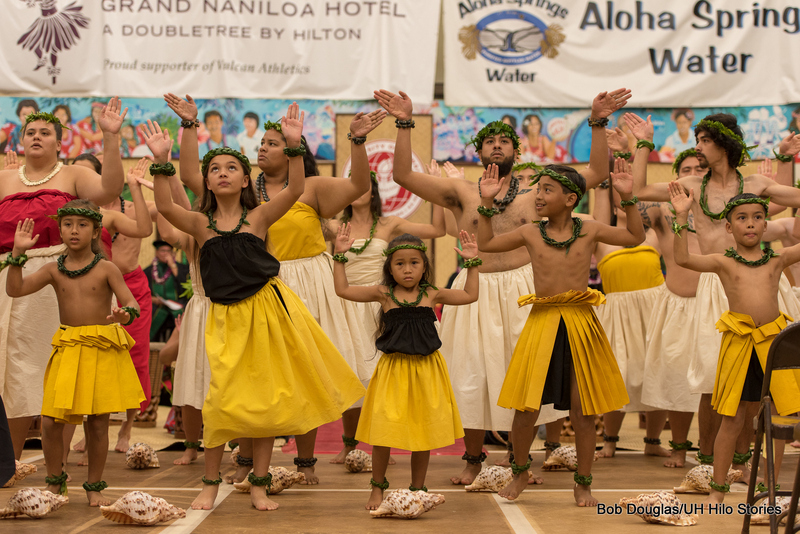 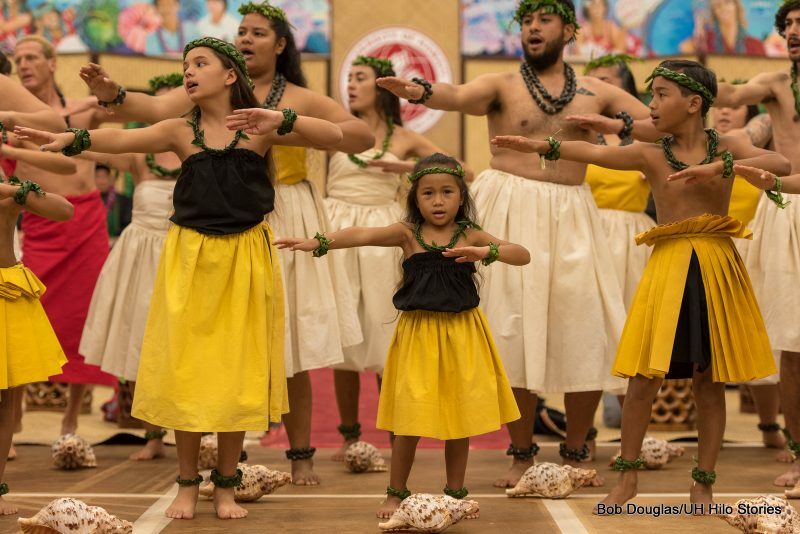 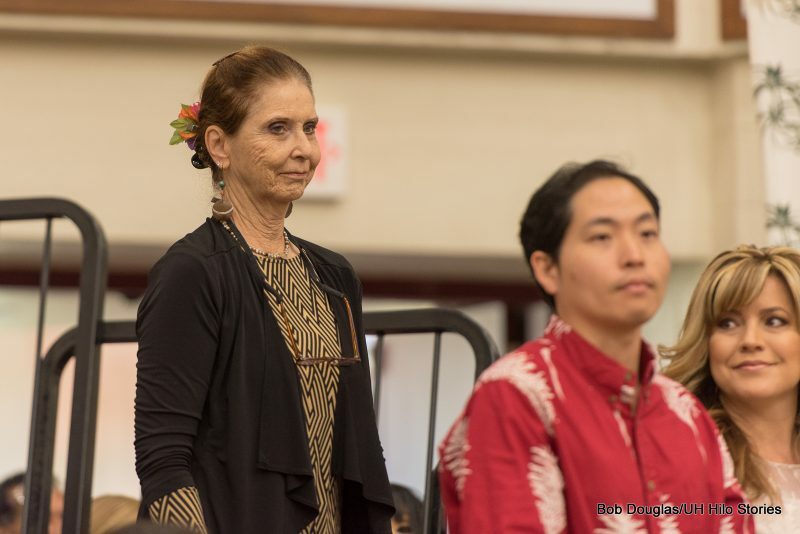 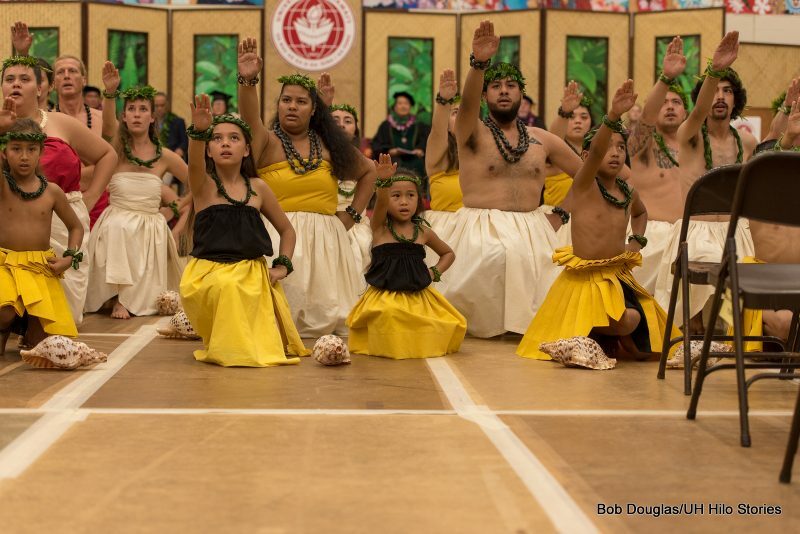 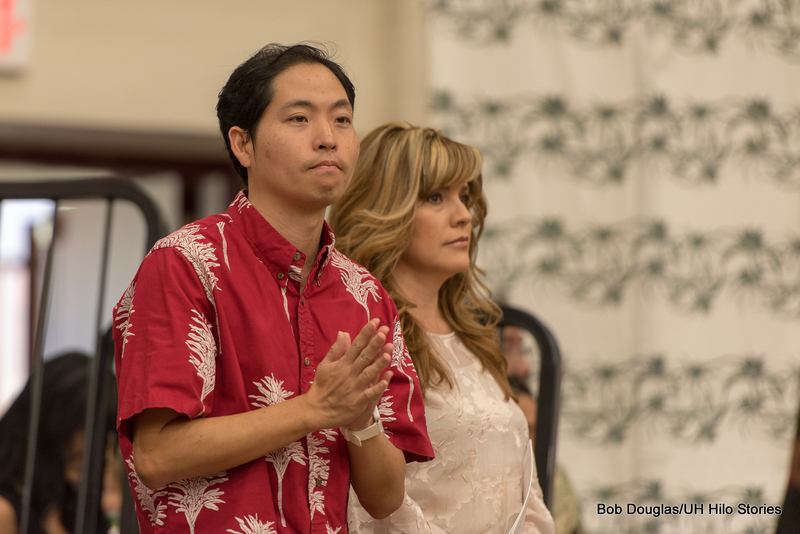 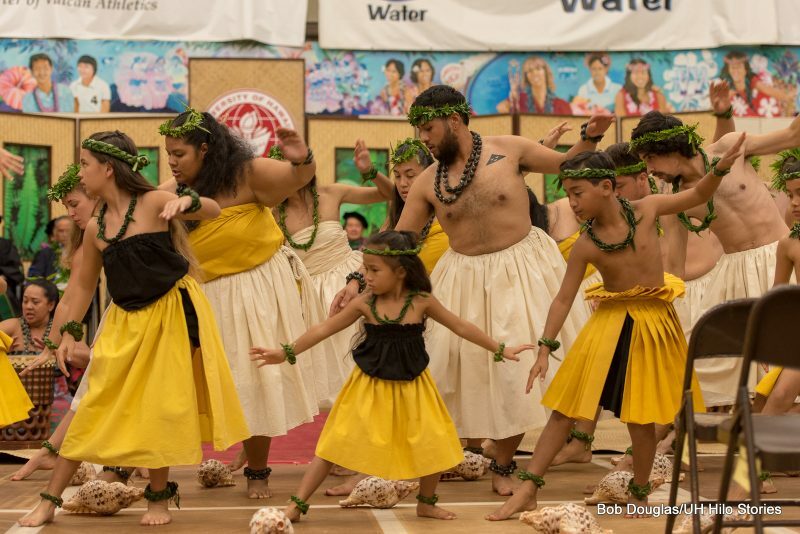 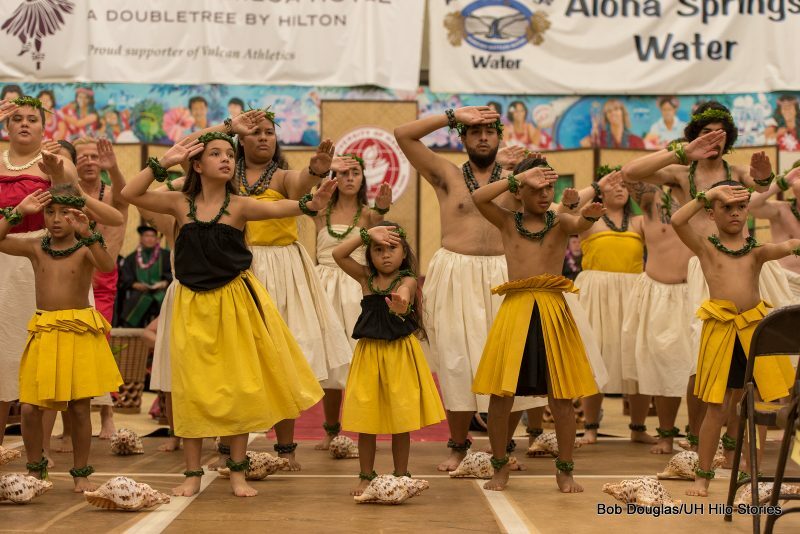 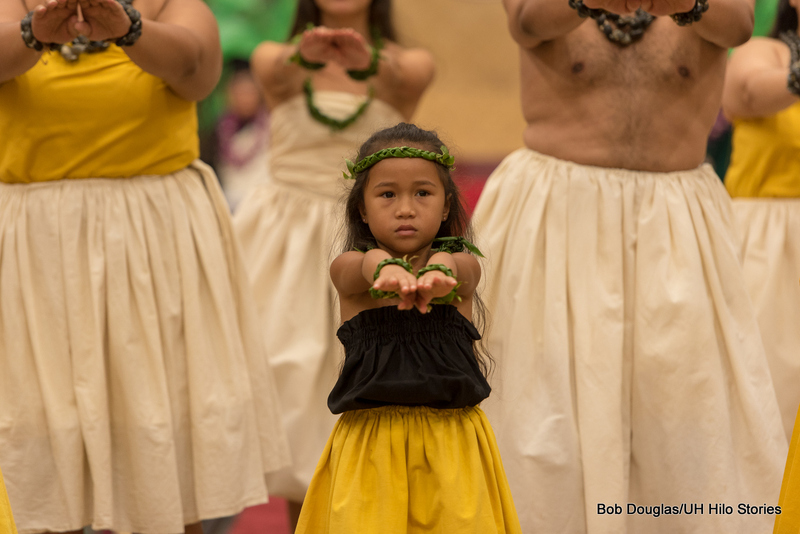 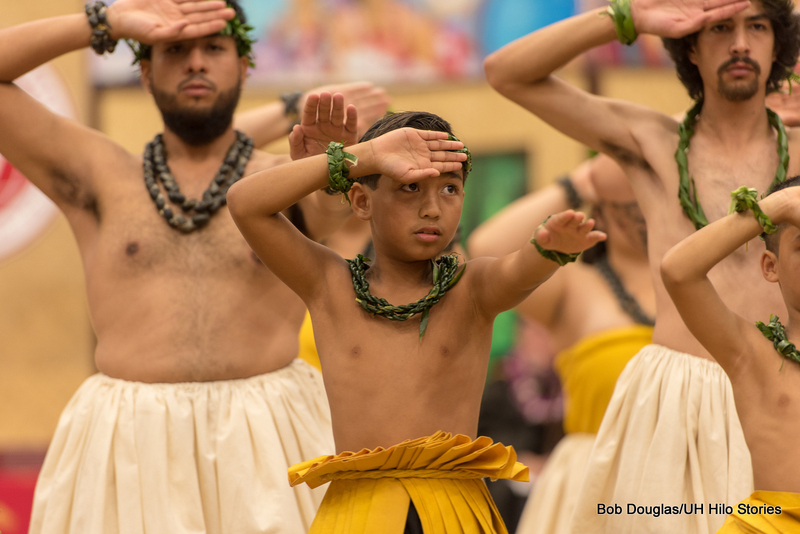 Candidates petitioned for degrees and/or certificates from the College of Agriculture, Forestry and Natural Resource Management (17); College of Arts and Sciences (255); College of Business and Economics (33); College of Pharmacy (1); Ka Haka ‘Ula O Ke‘elikōlani College of Hawaiian Language (9); and also various post-graduate credentials (14). 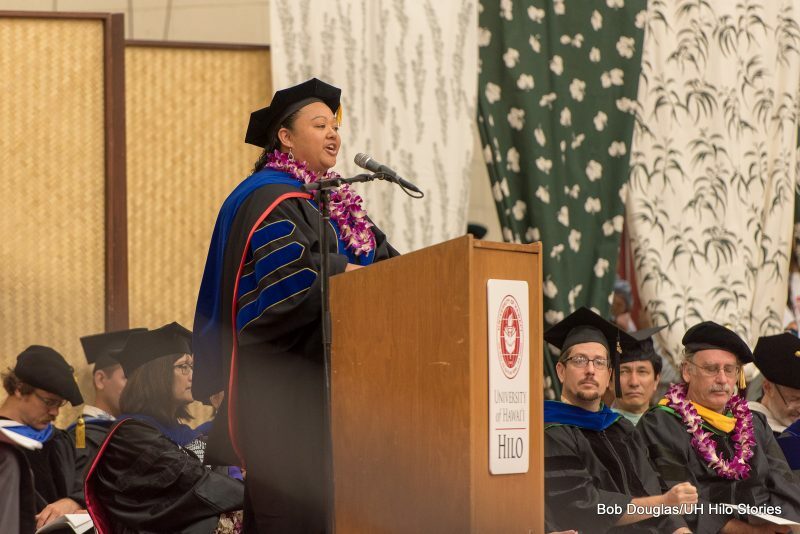 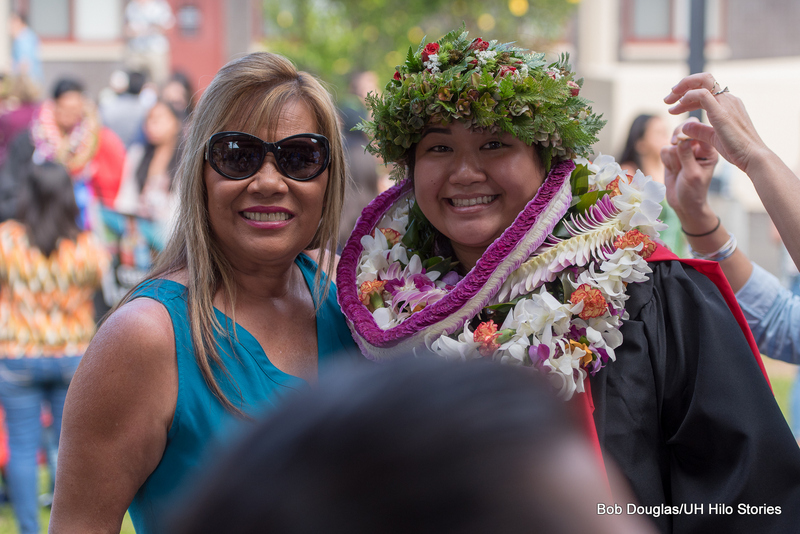 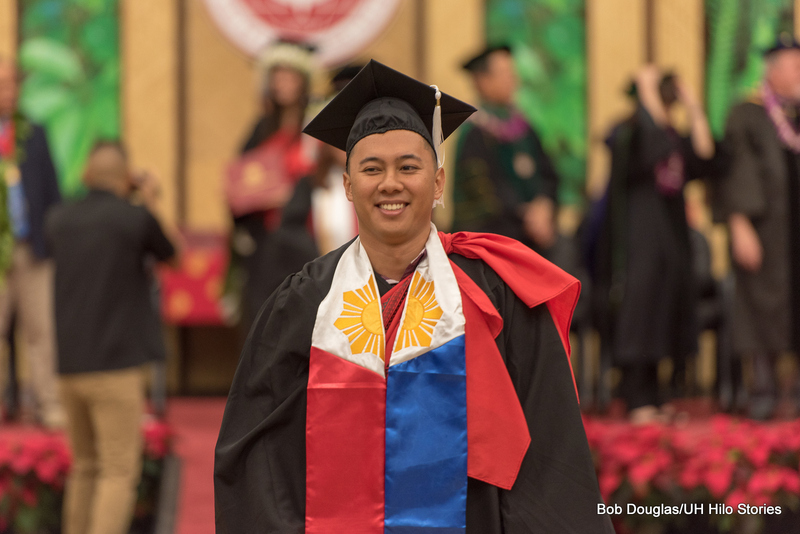 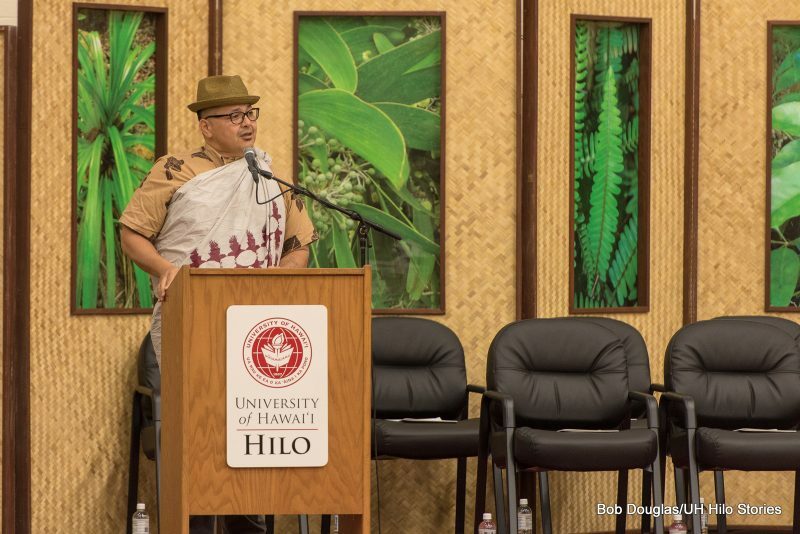 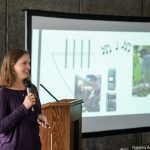 Keynote speaker was Master Navigator Kālepa Baybayan and student speaker was communication major Anne Rivera. 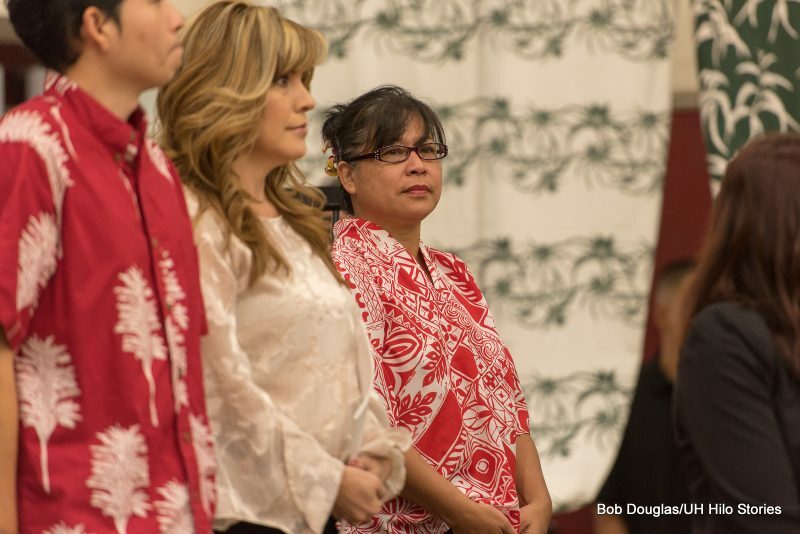 Three candidates before the opening procession. 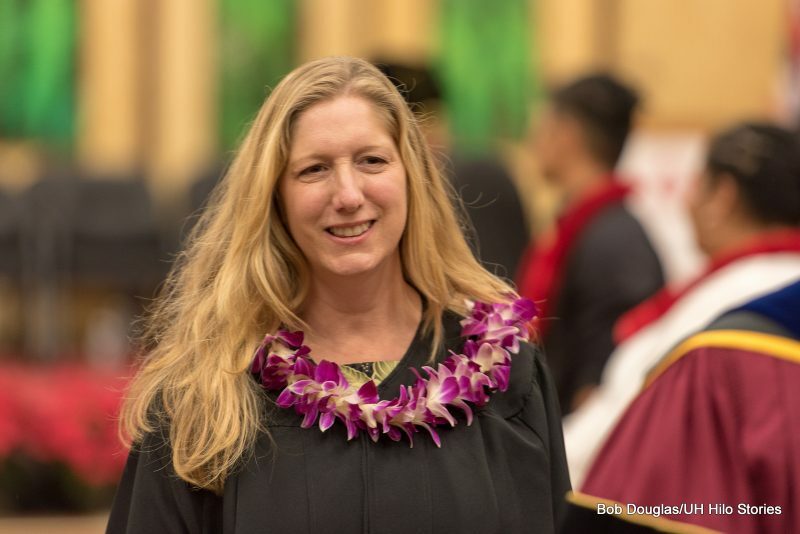 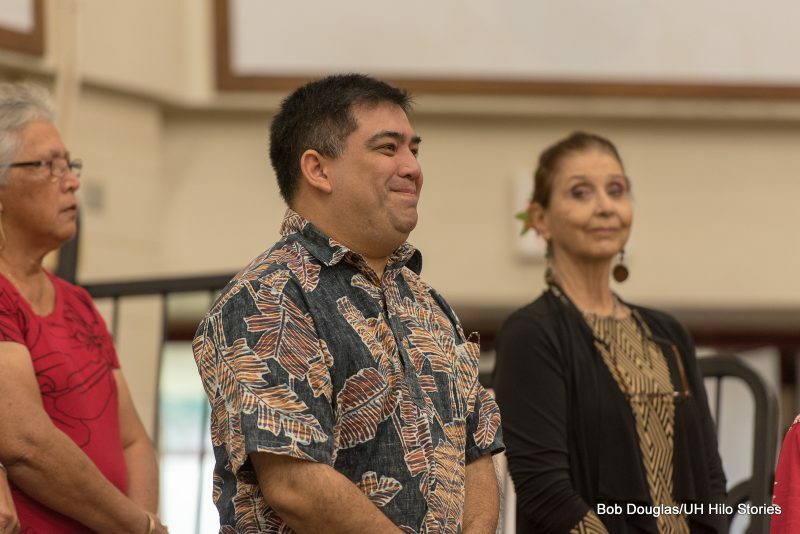 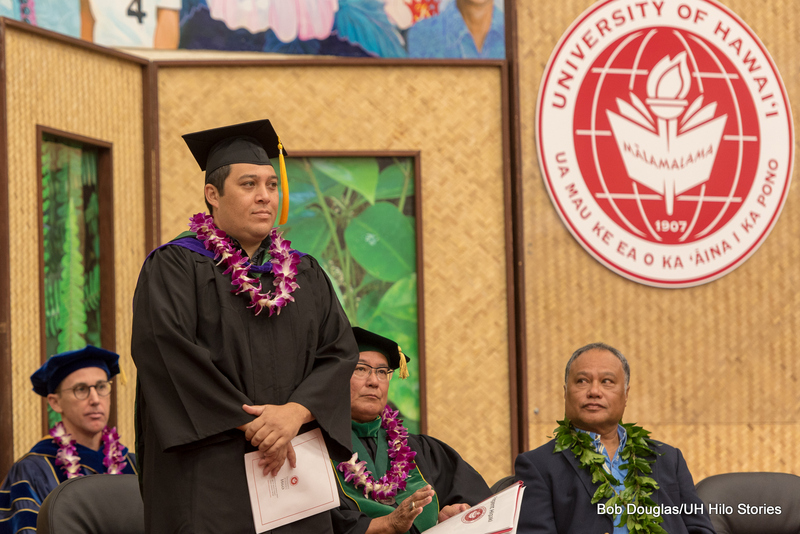 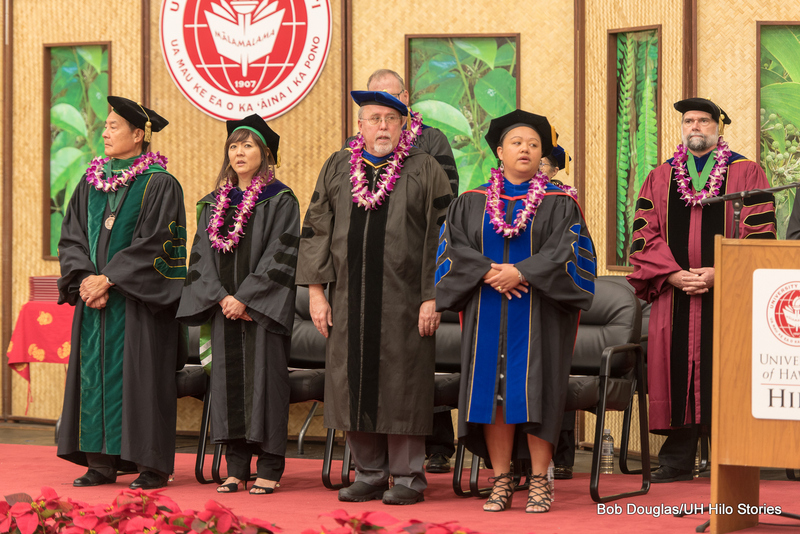 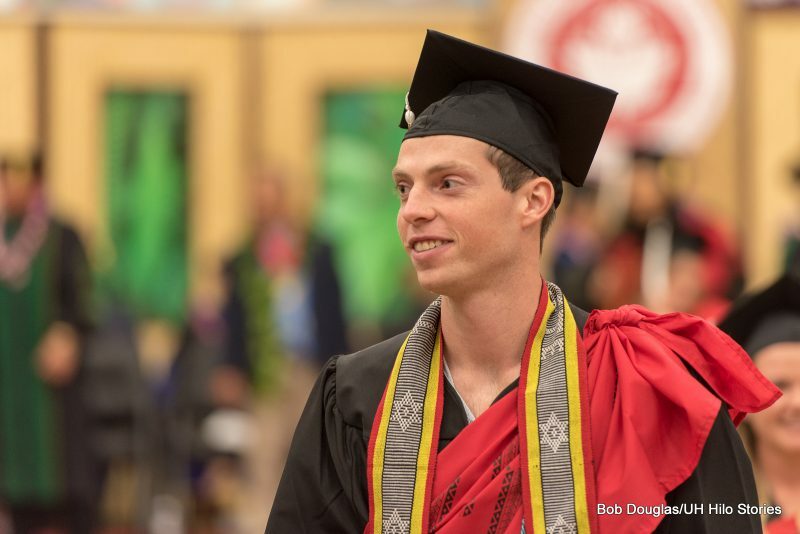 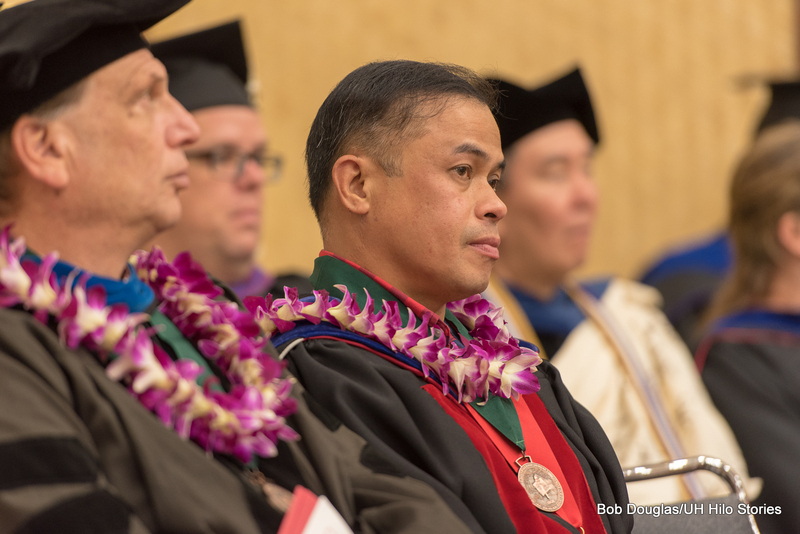 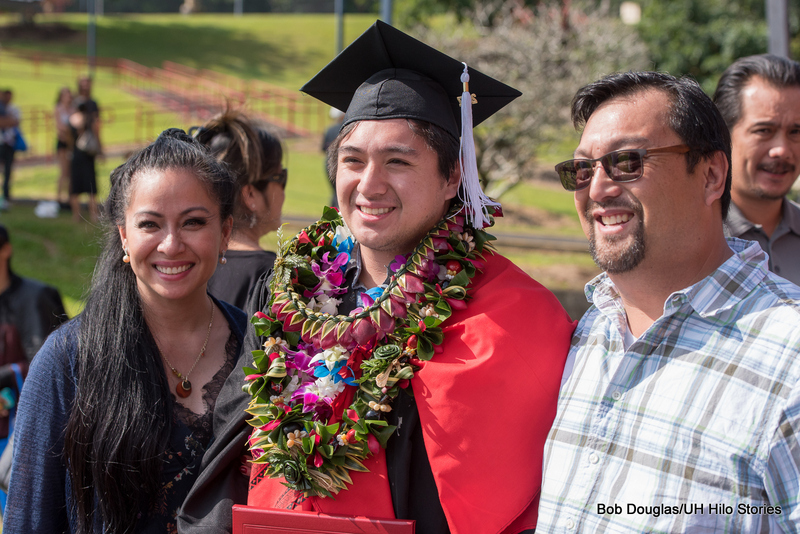 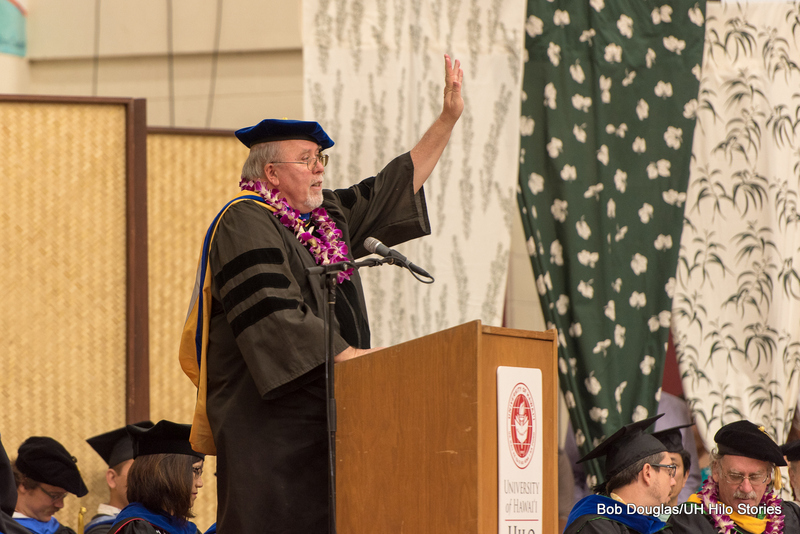 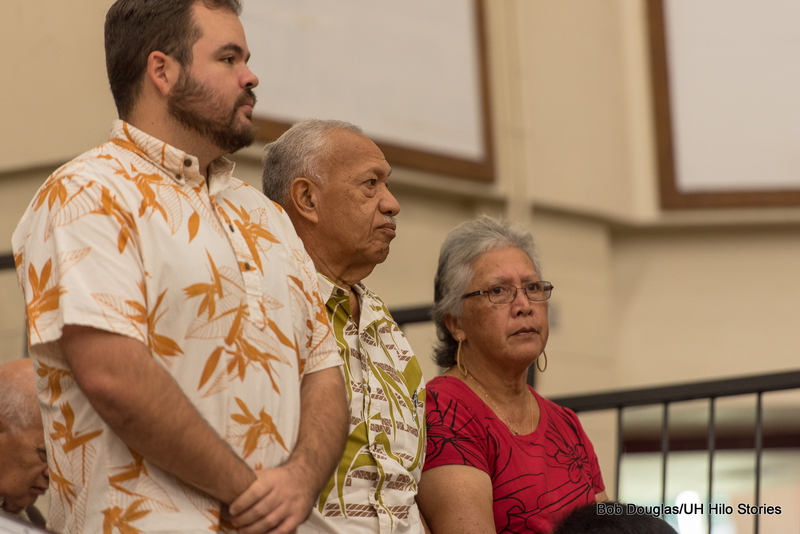 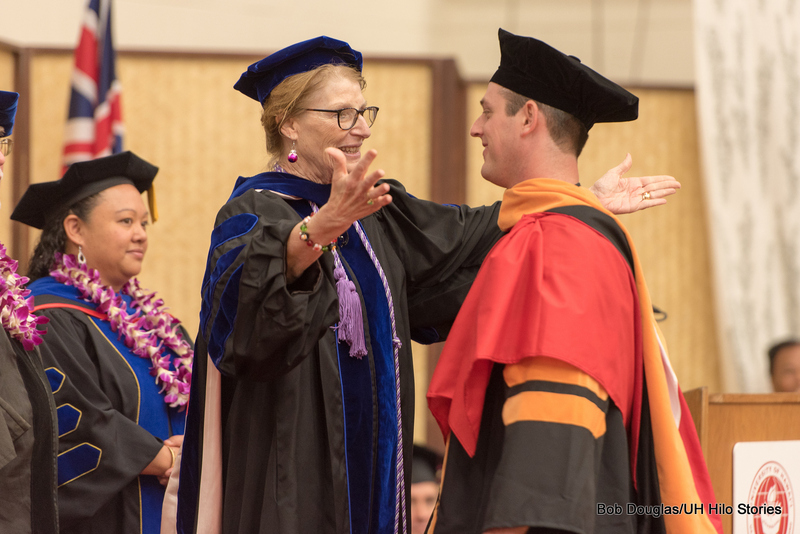 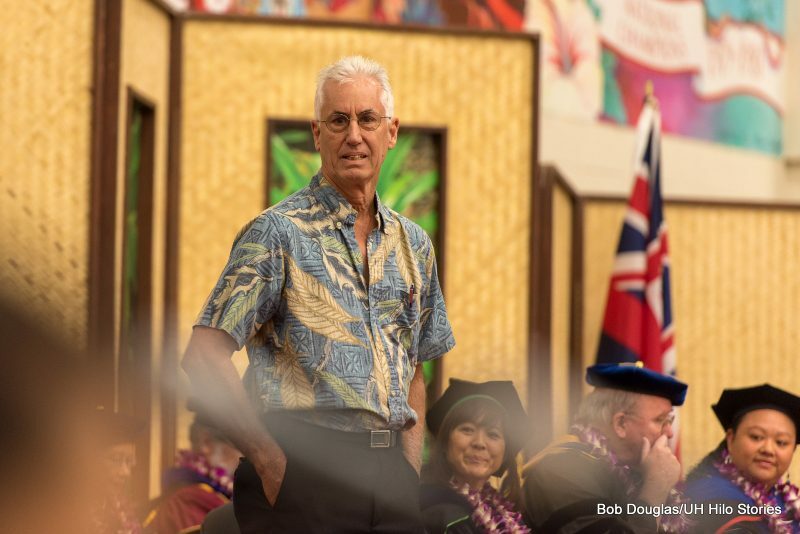 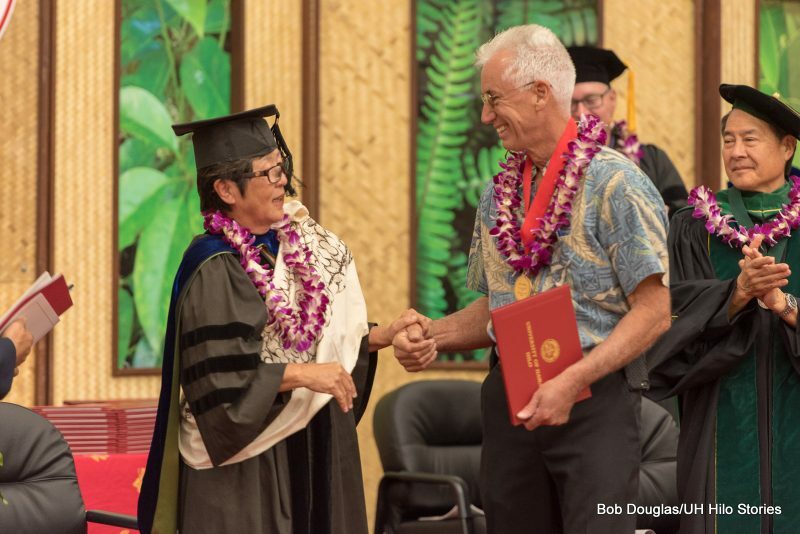 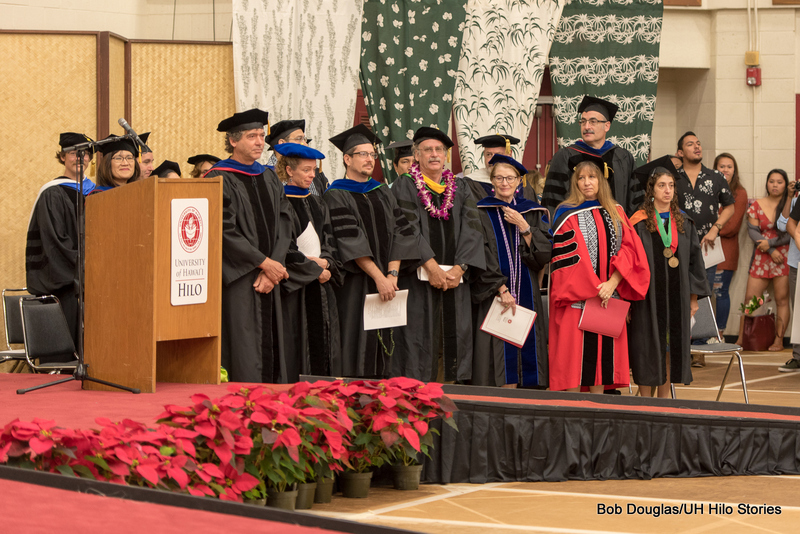 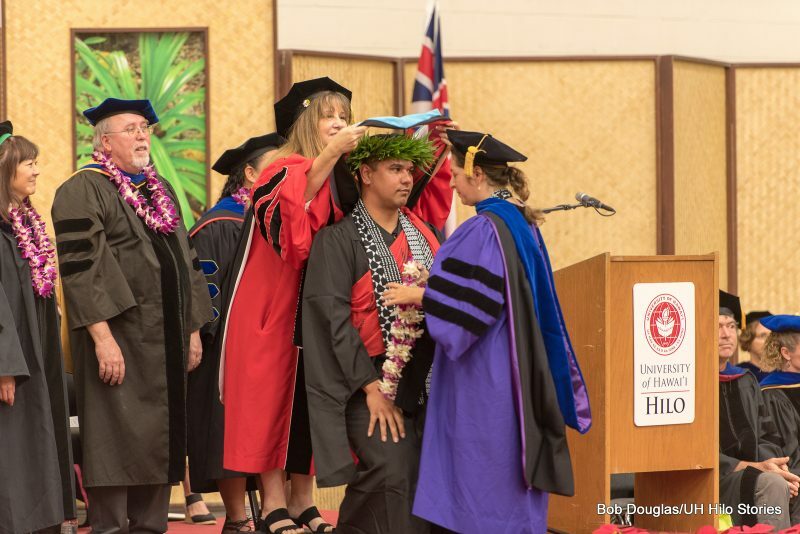 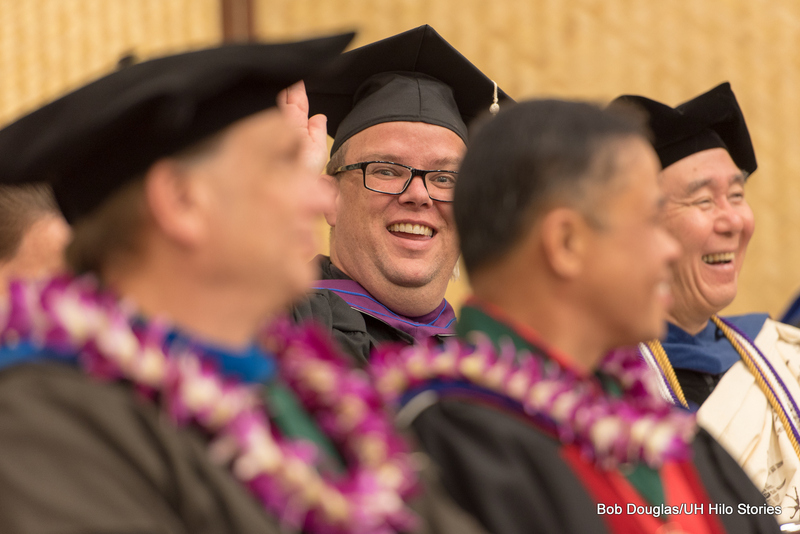 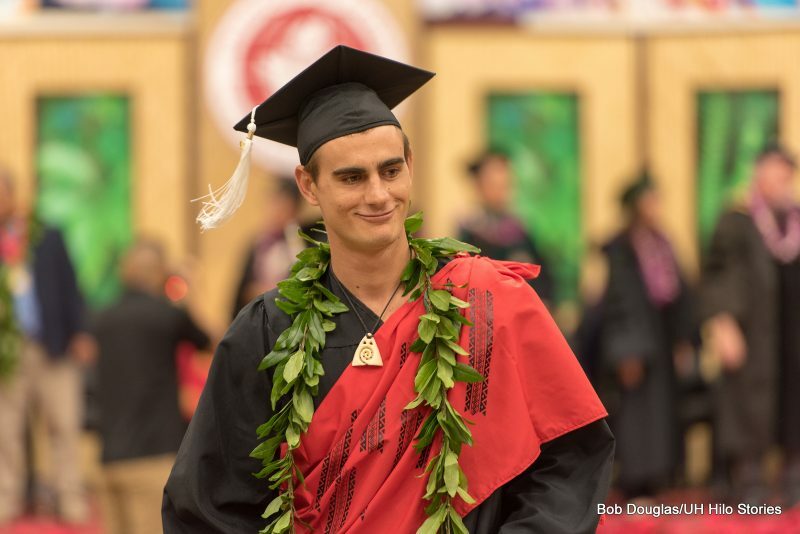 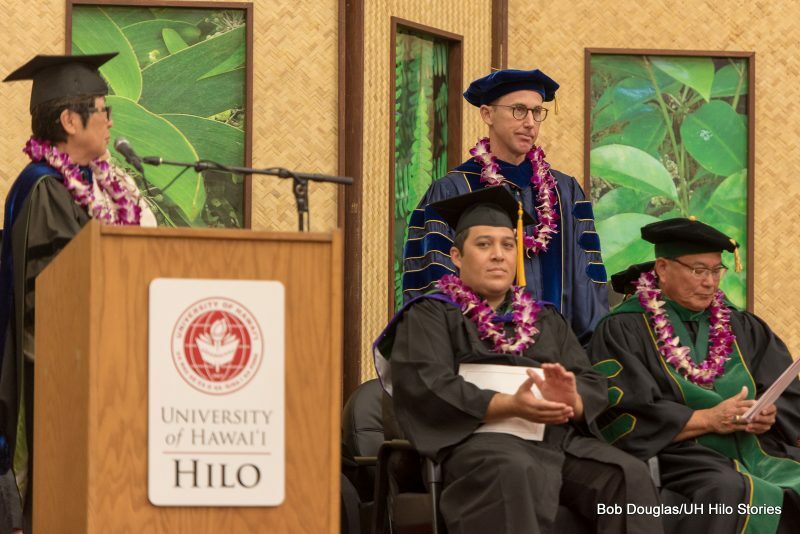 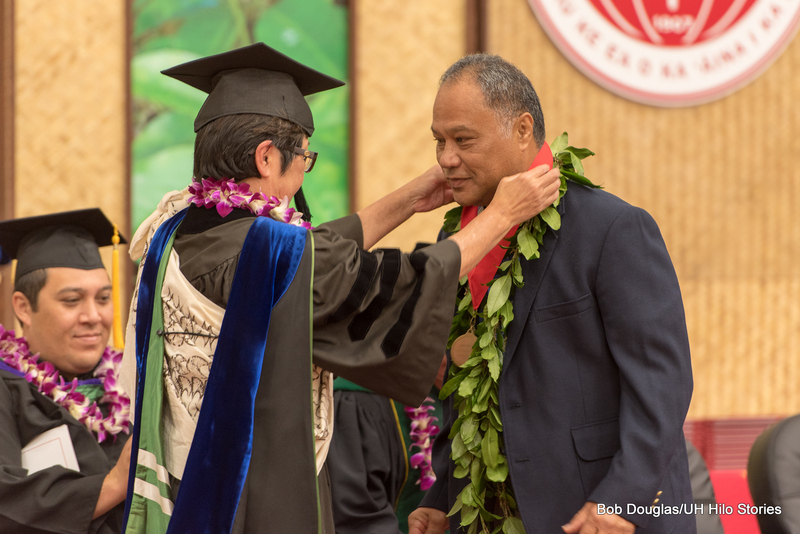 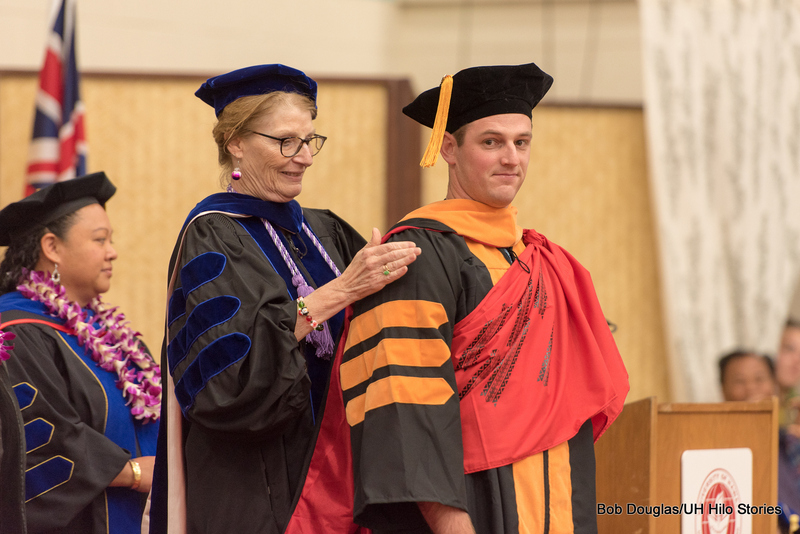 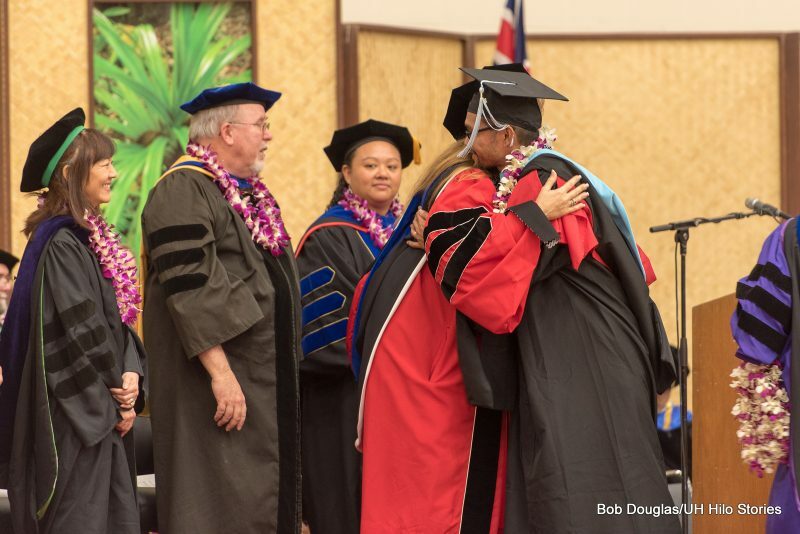 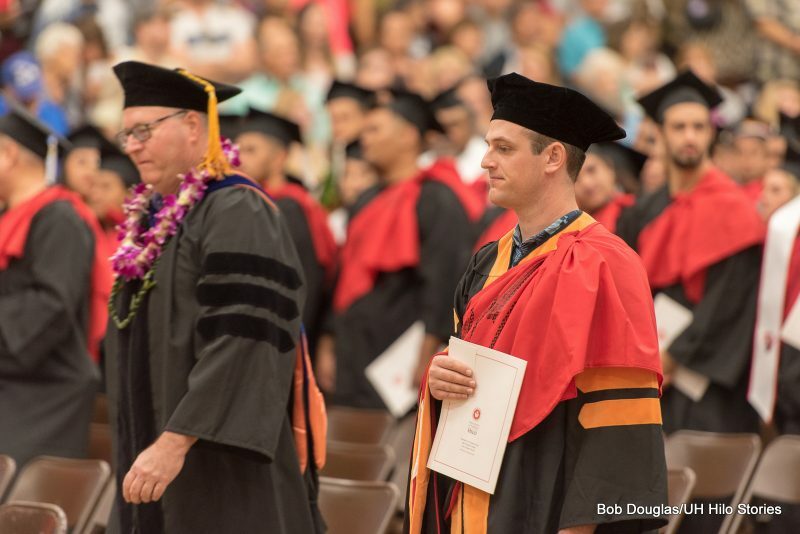 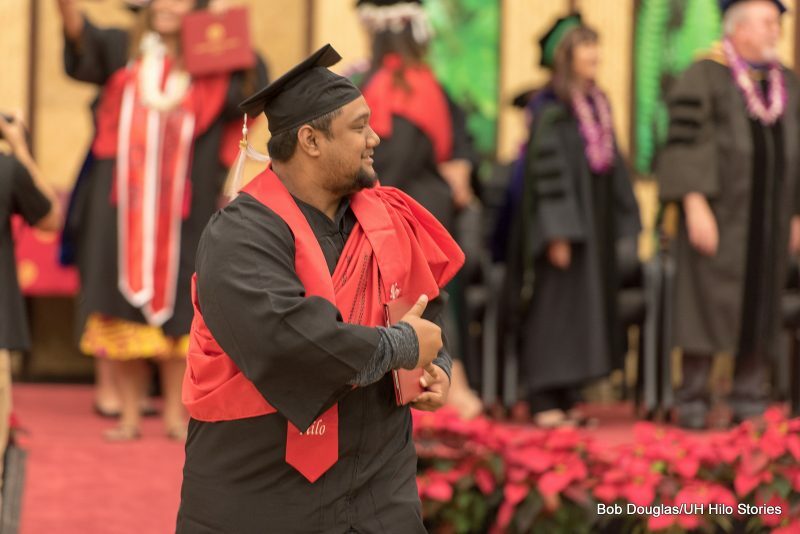 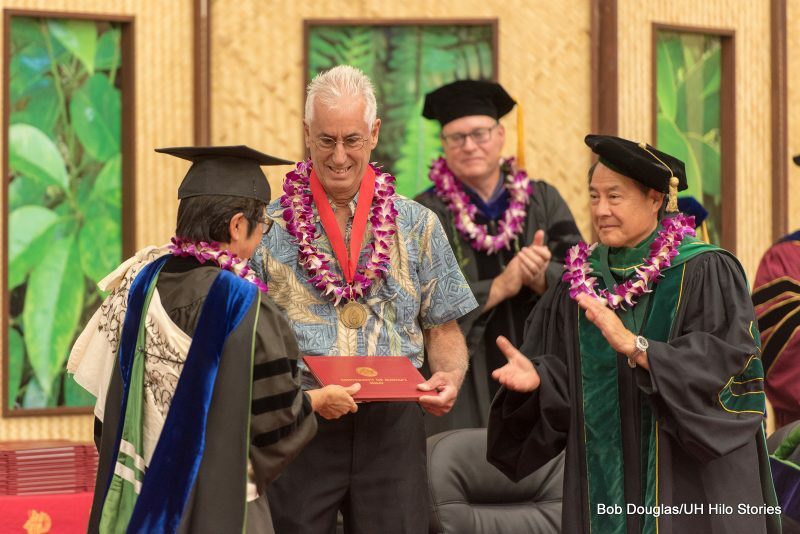 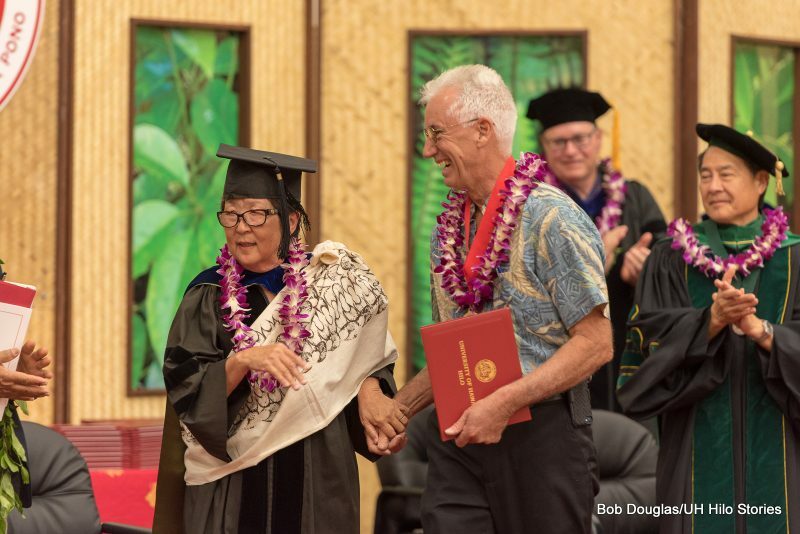 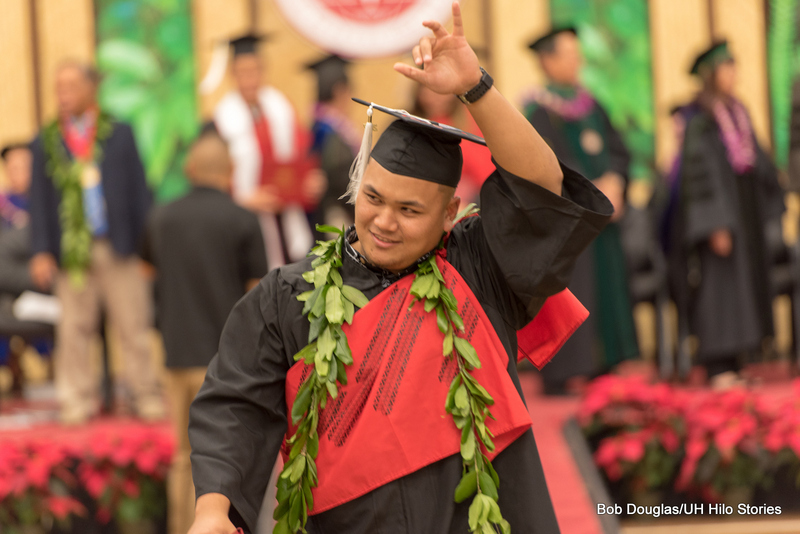 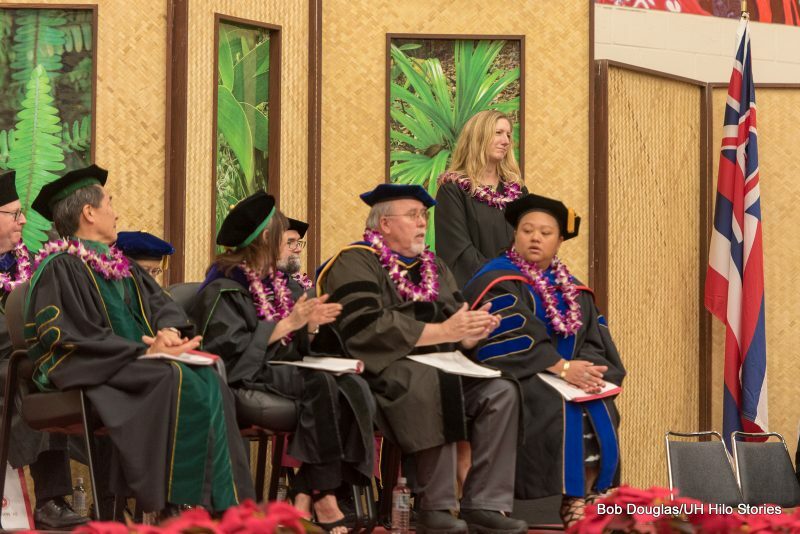 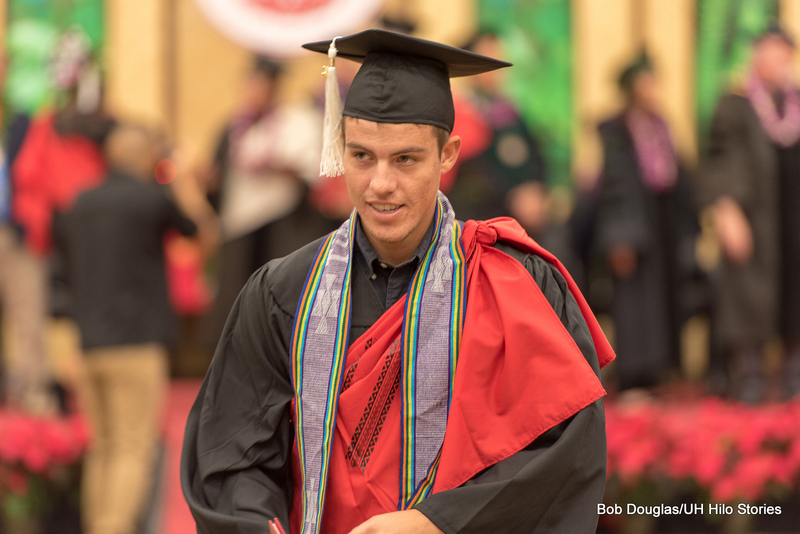 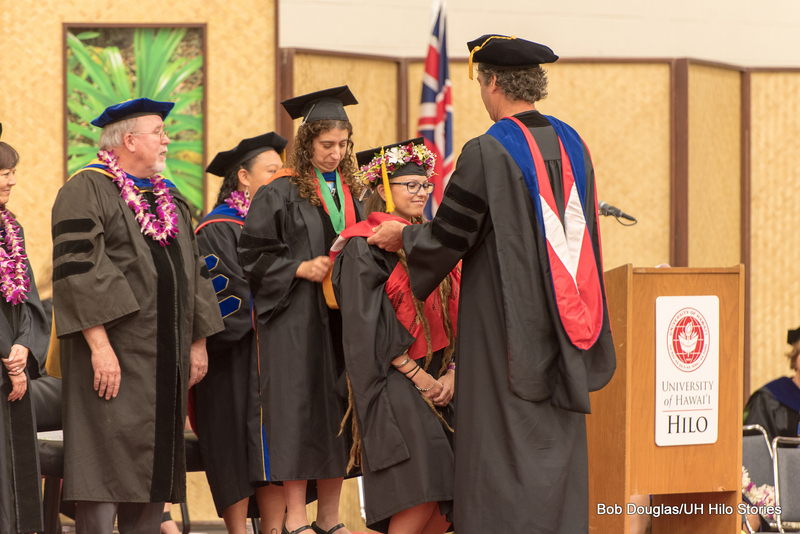 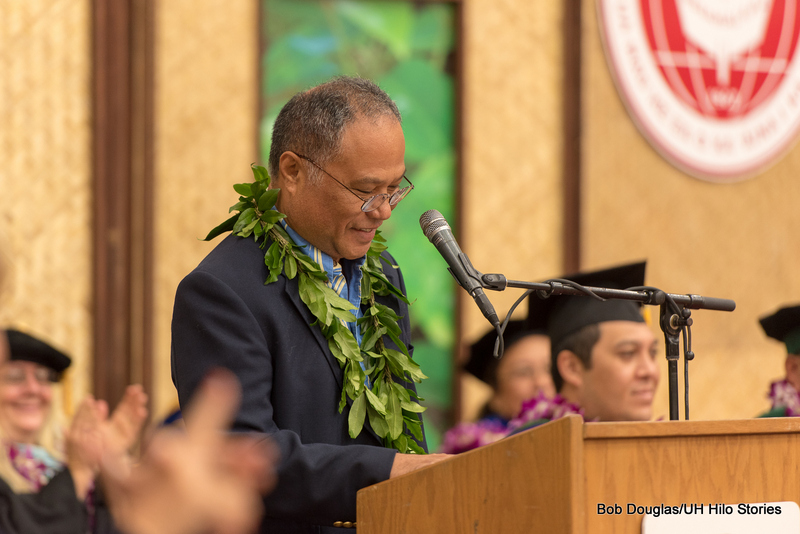 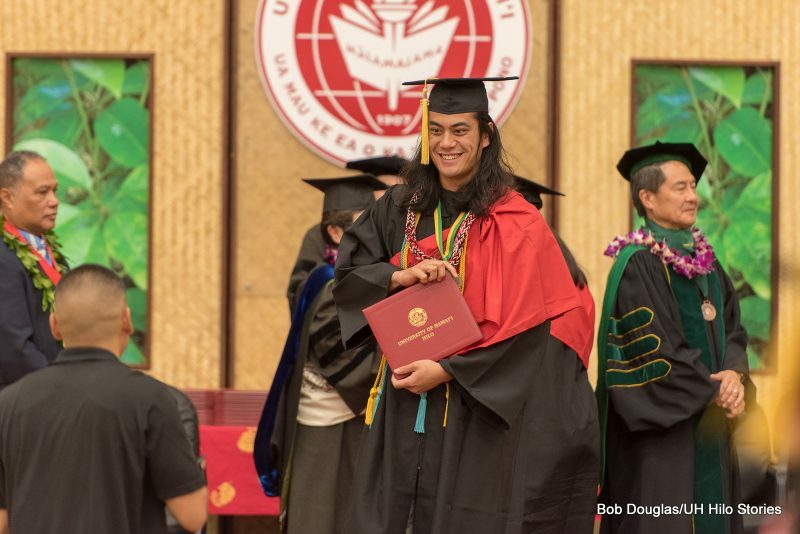 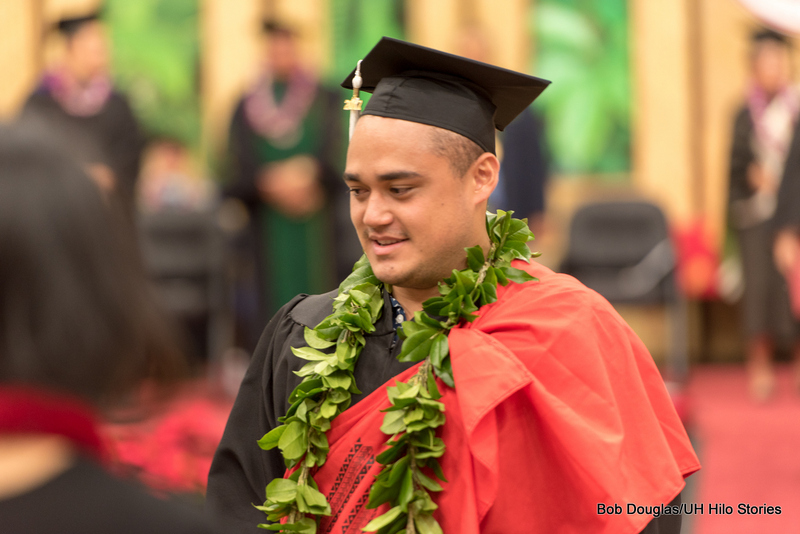 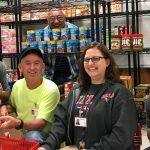 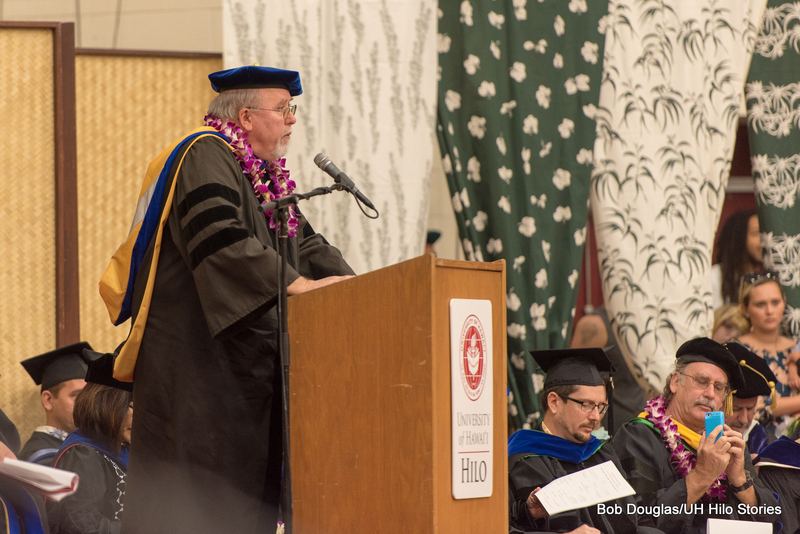 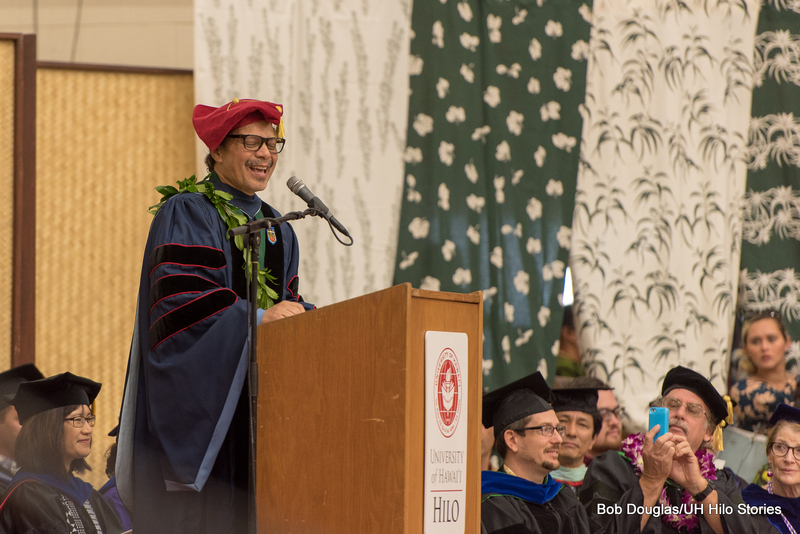 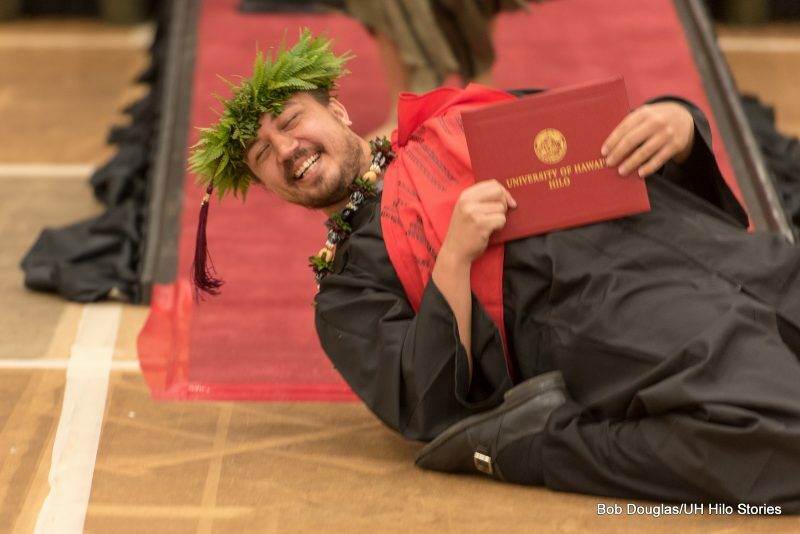 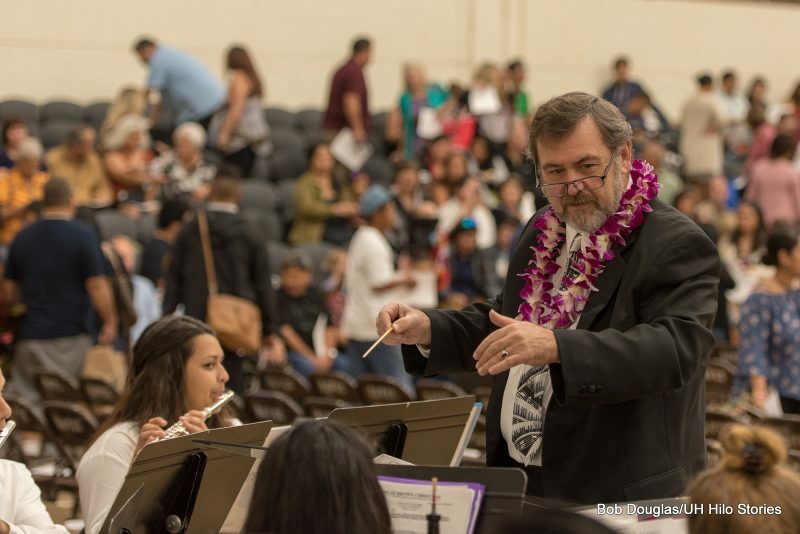 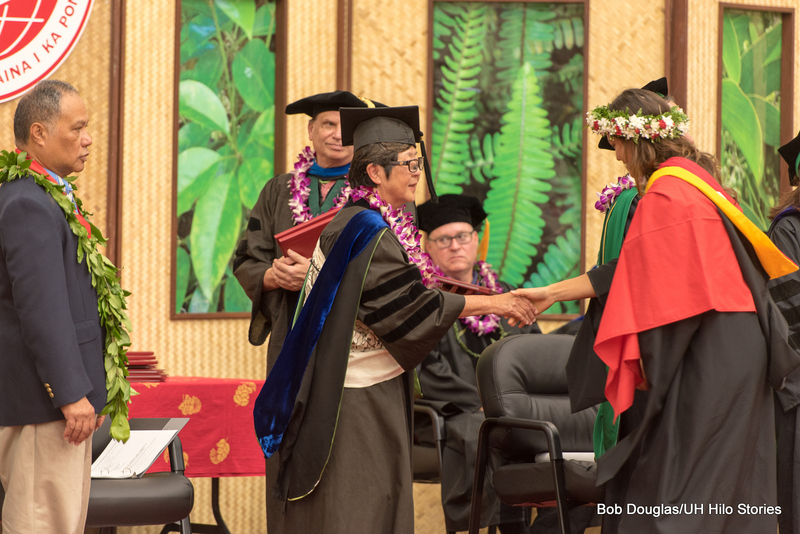 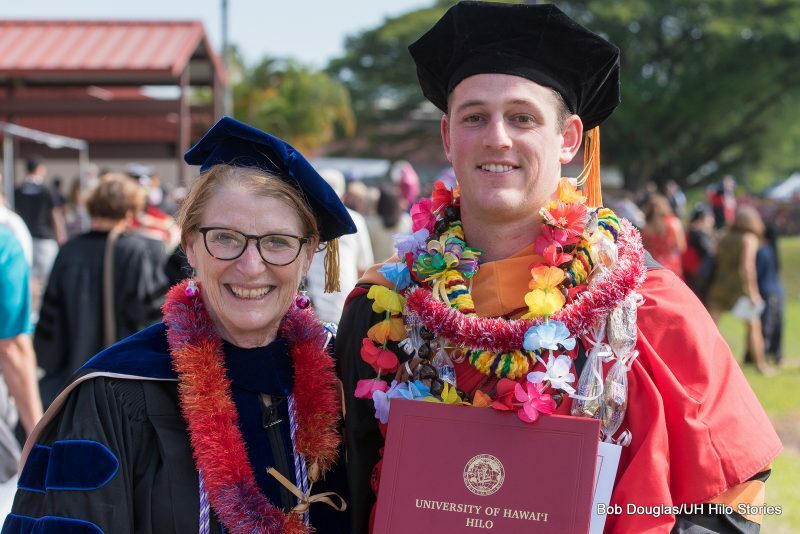 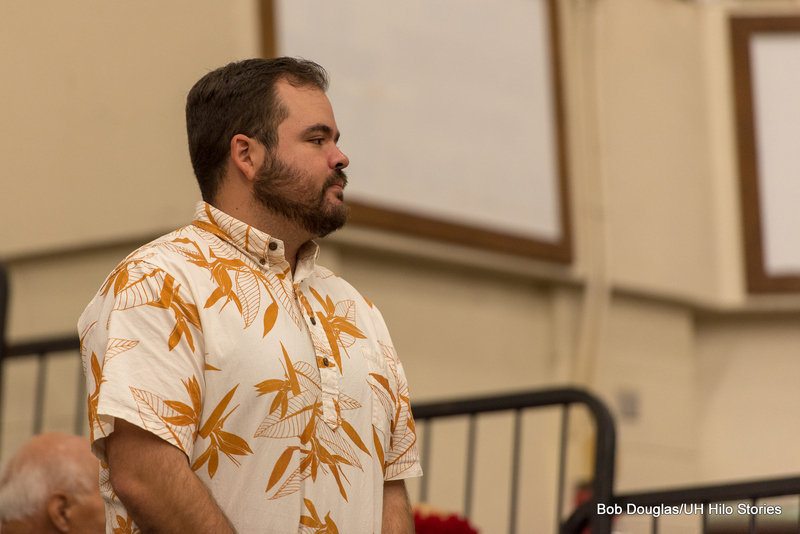 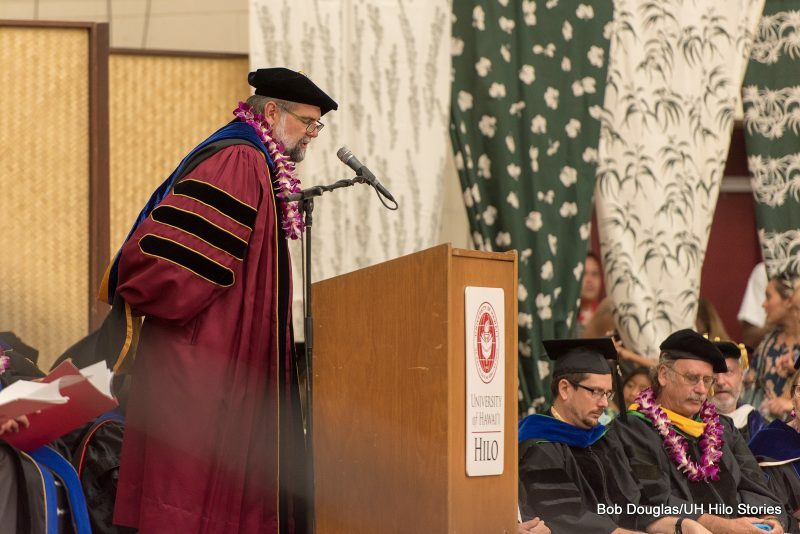 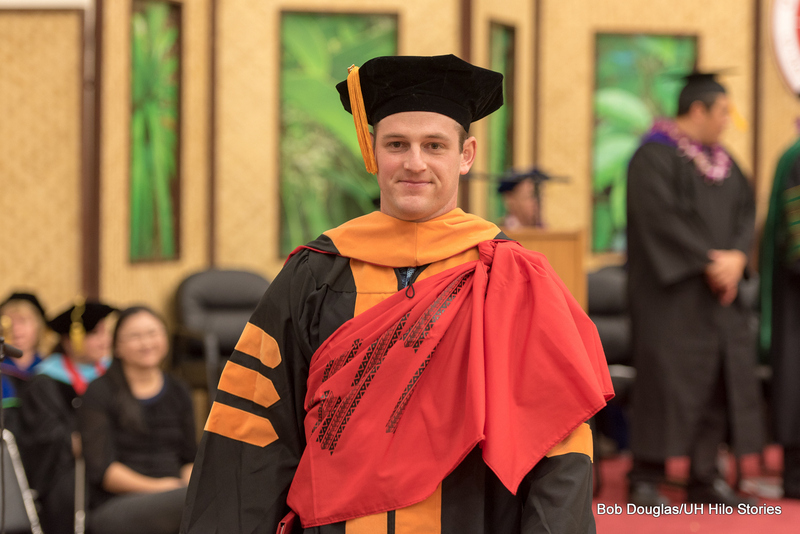 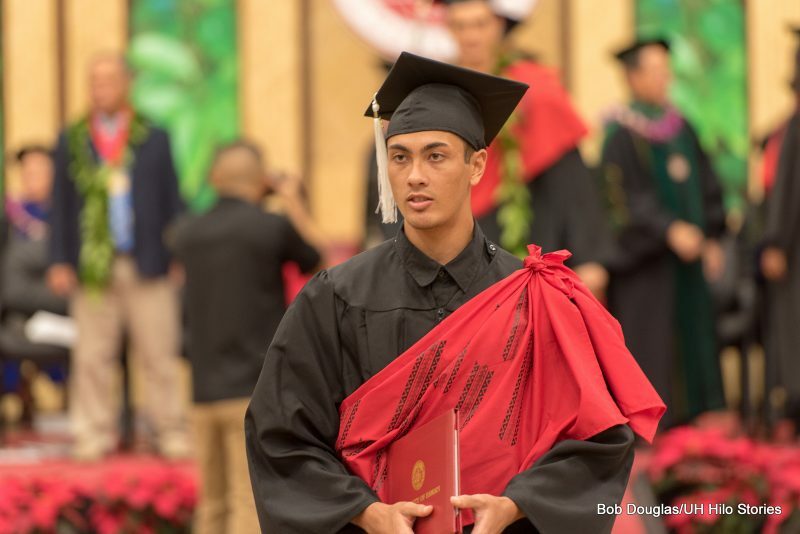 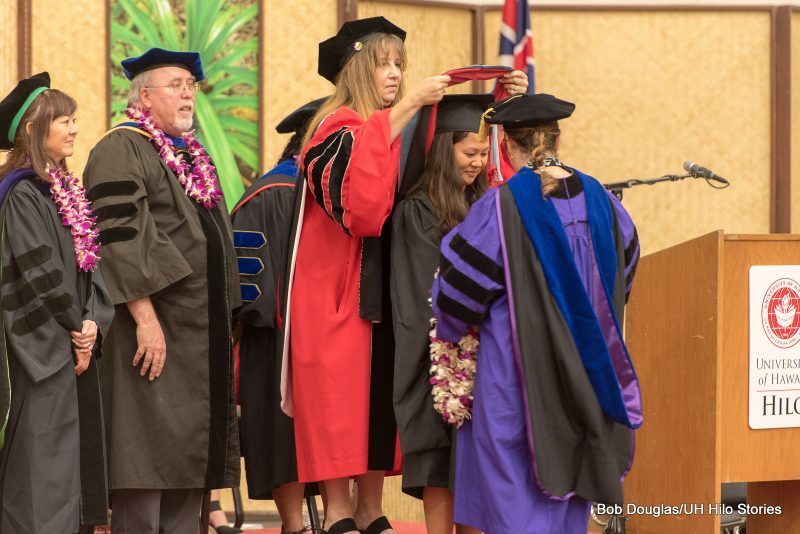 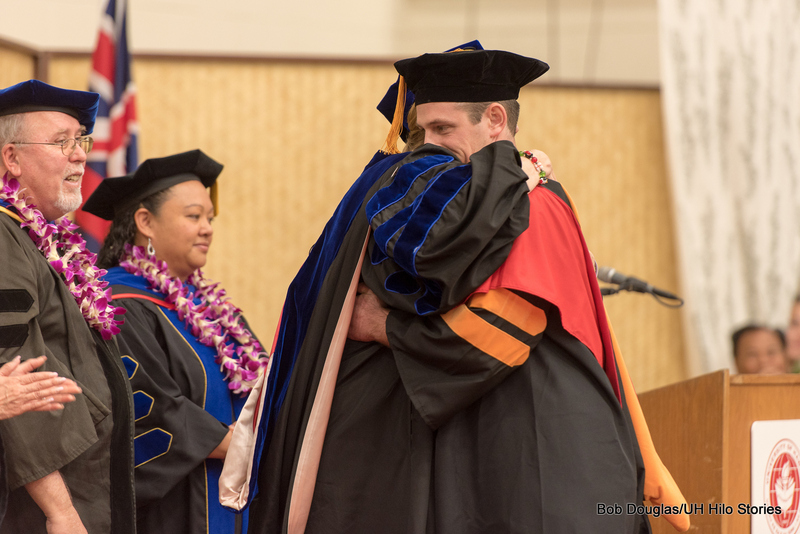 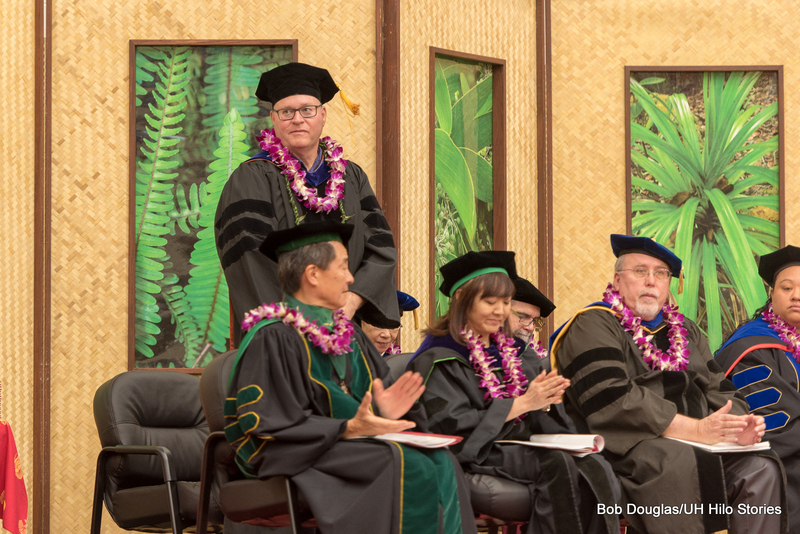 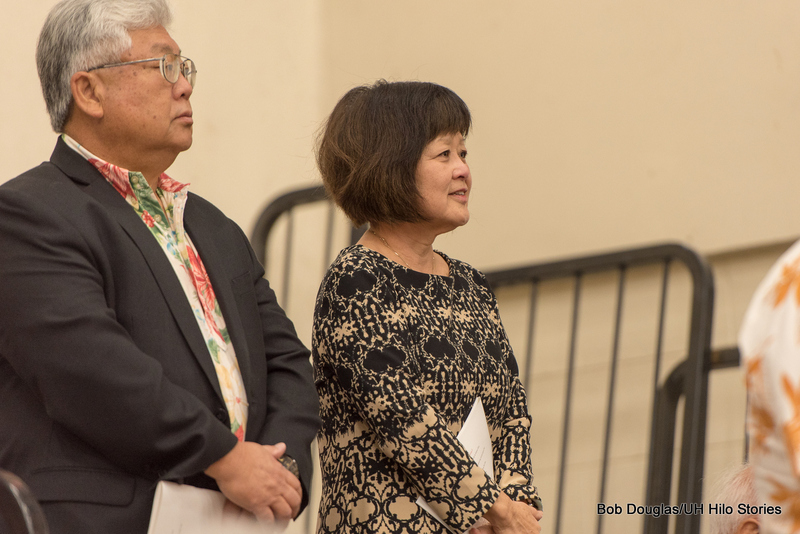 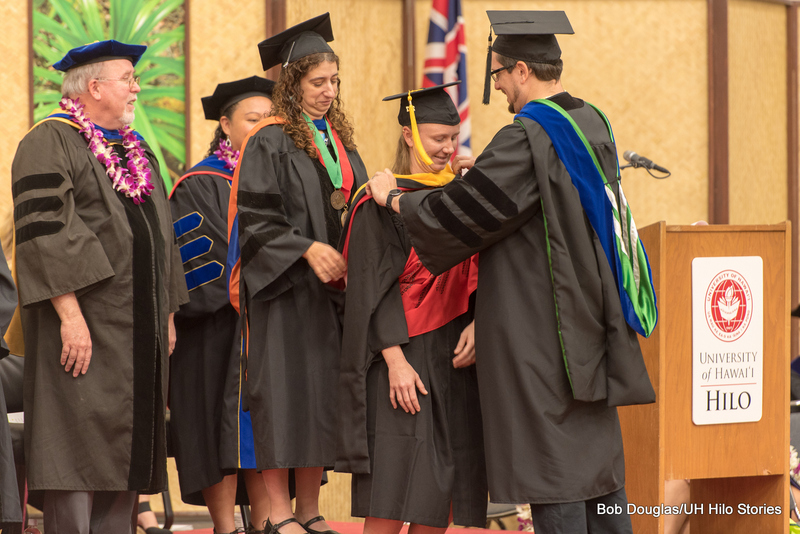 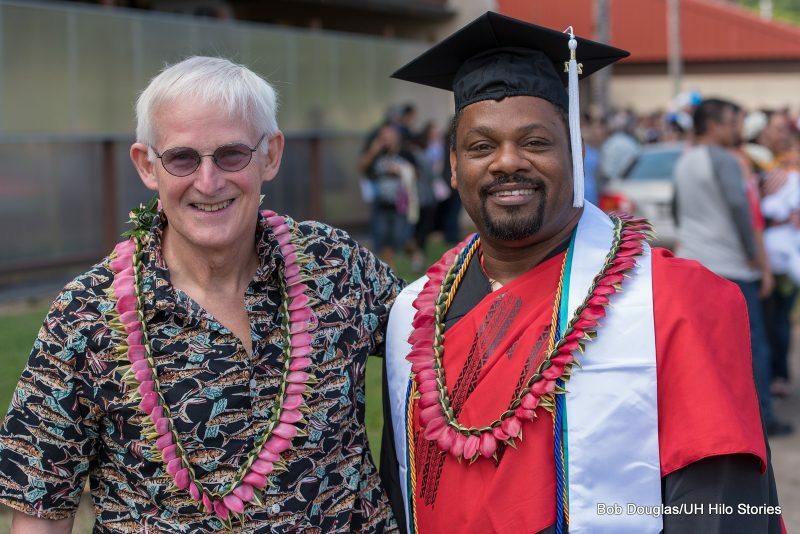 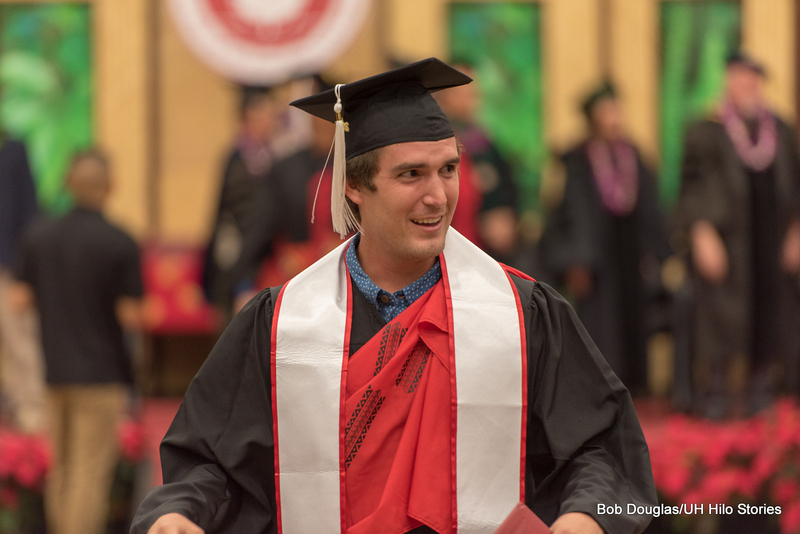 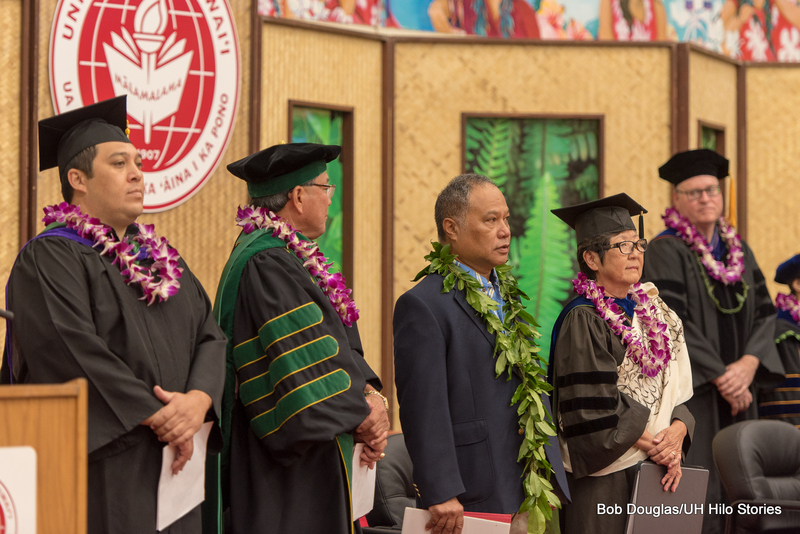 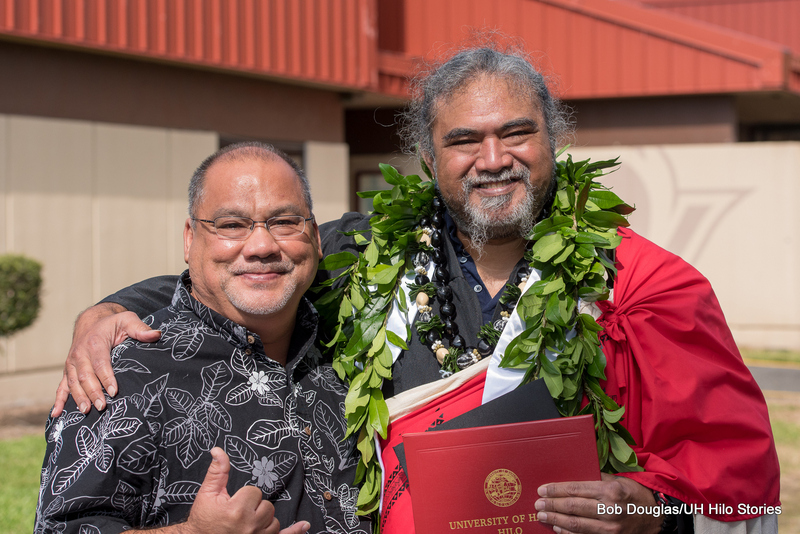 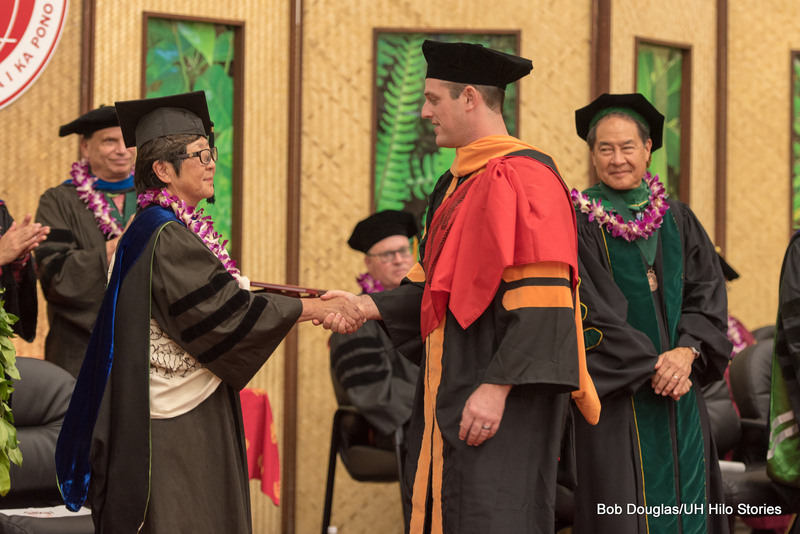 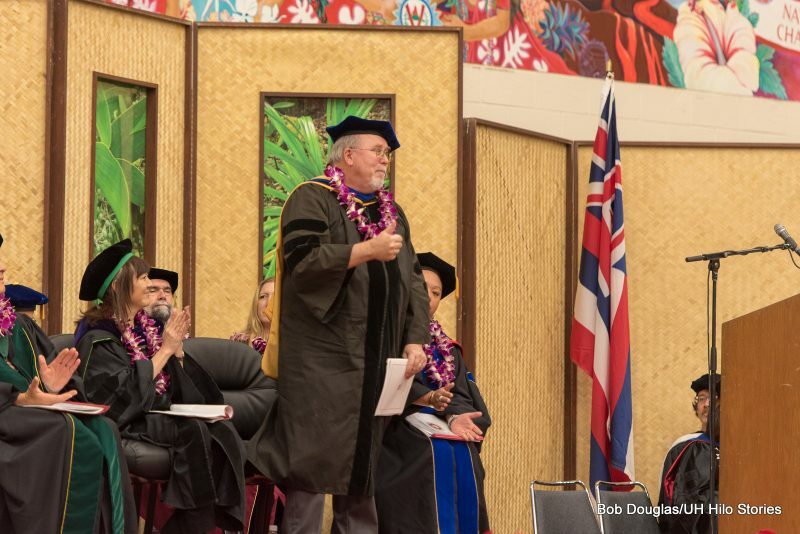 Kolin Kettleson, director of Auxiliary Services, received the Chancellor’s Special Recognition Award for his years of service to the UH Hilo community. 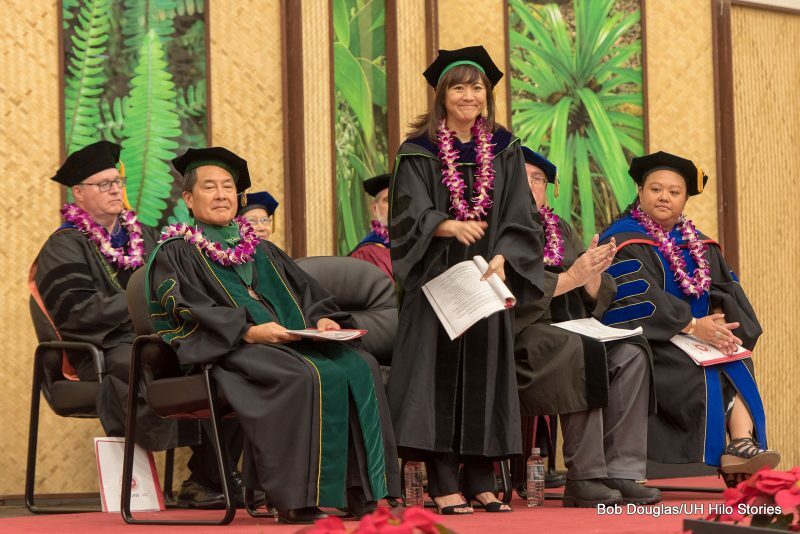 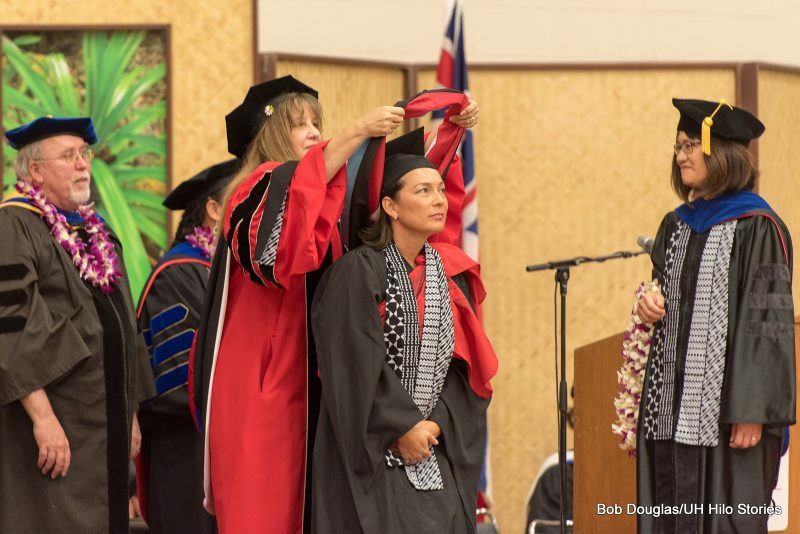 Interim Chancellor Marcia Sakai gives medal to keynote speaker Kālepa Babayan. 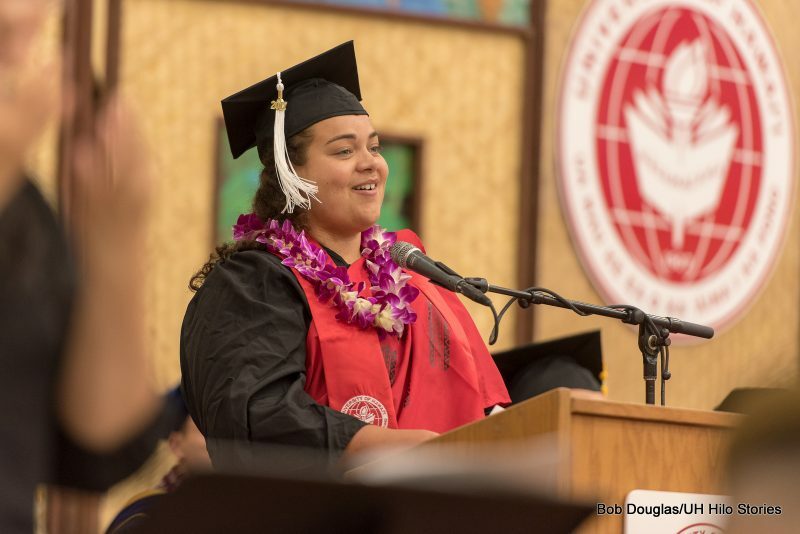 Student speaker Anne Rivera delivers her remarks. 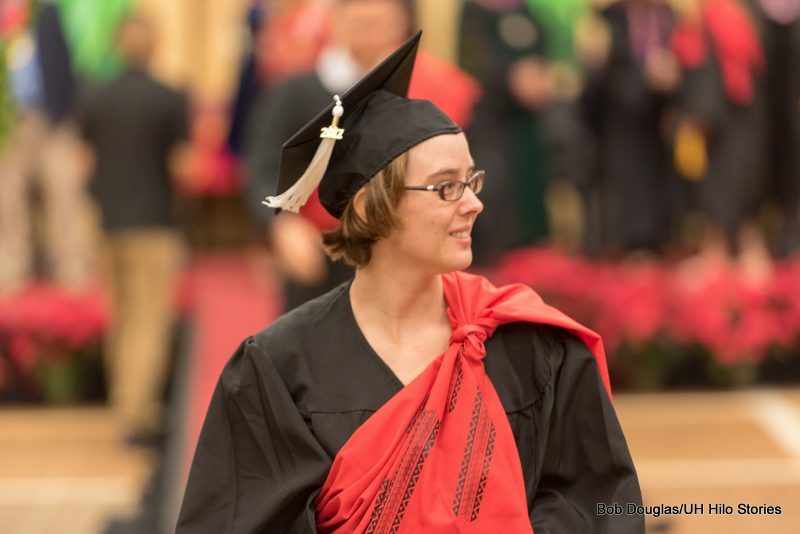 Graduate degree candidate with hood. 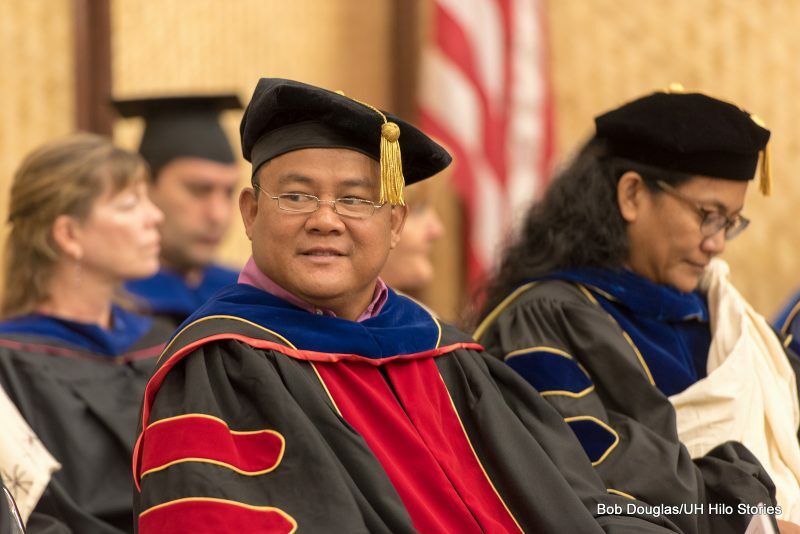 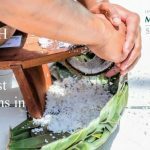 Doctoral degree in pharmacy is conferred. 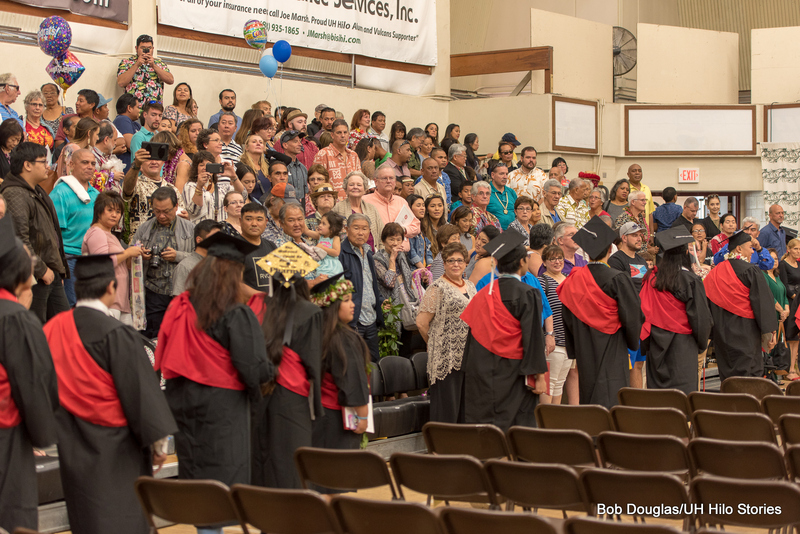 Exit procession to meet with family and friends. 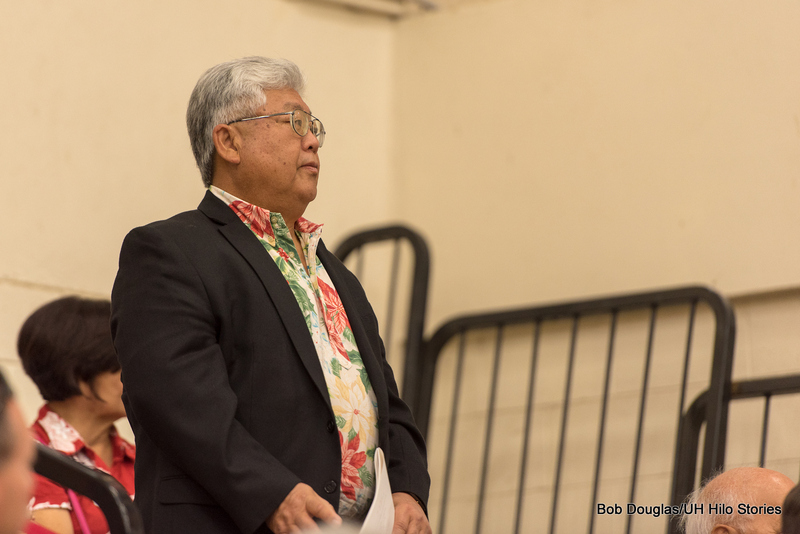 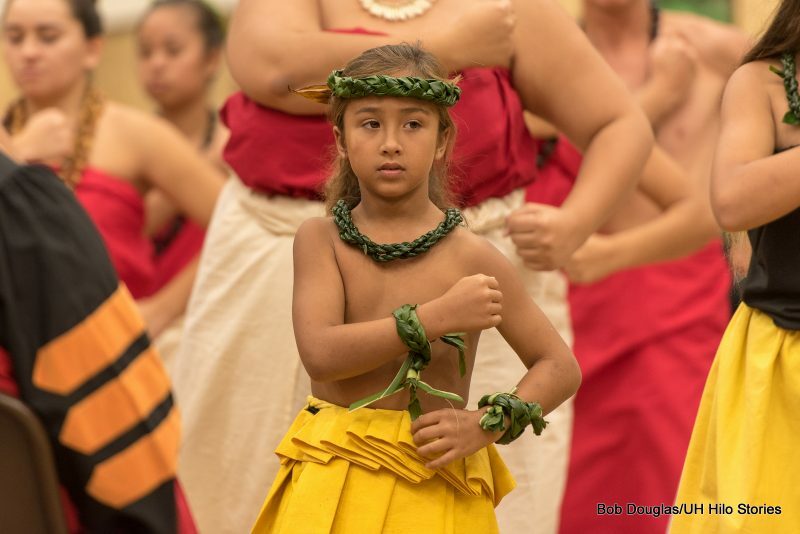 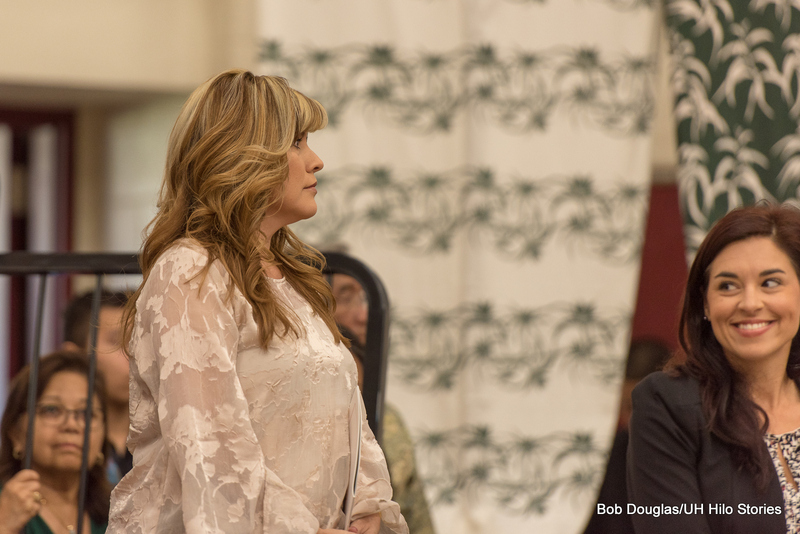 Photos may be freely shared in any print or electronic media.